3. 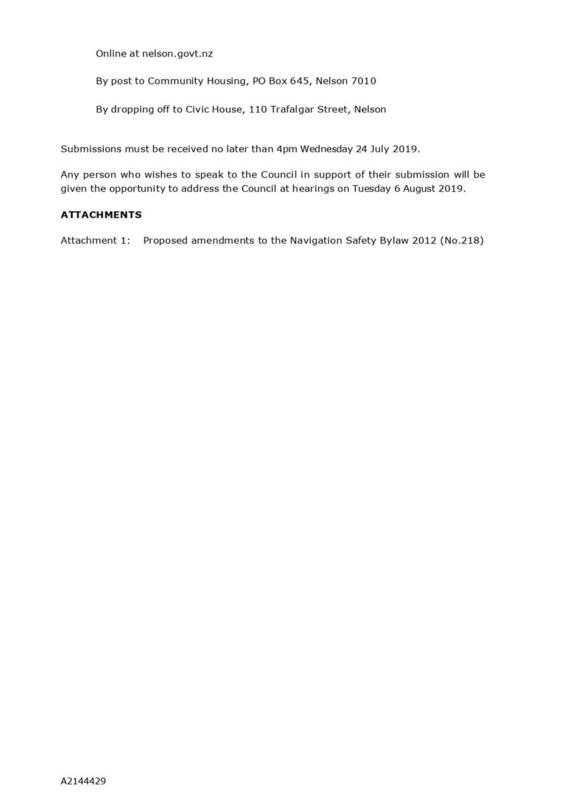 Delegates the Chief Executive the authority to amend the criteria in Part 3.3 of the Parking Policy when required to minimise any negative impacts of the parking permits on the users of the parking resource. 1. 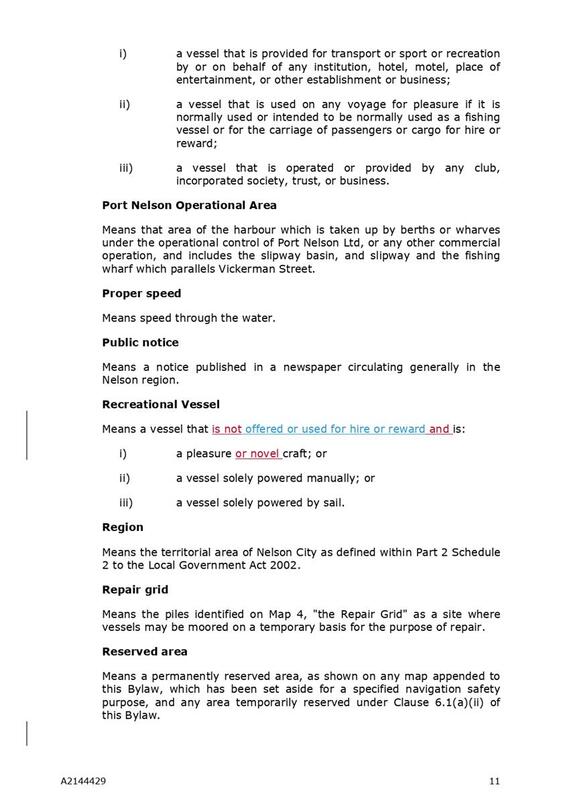 Receives the report Navigation Safety Bylaw review (R10026) and its attachment (A2144429). (b) the plan will result in the Statement of Proposal being as widely publicised as is reasonably practicable as a basis for consultation. A verbal briefing will be provided. 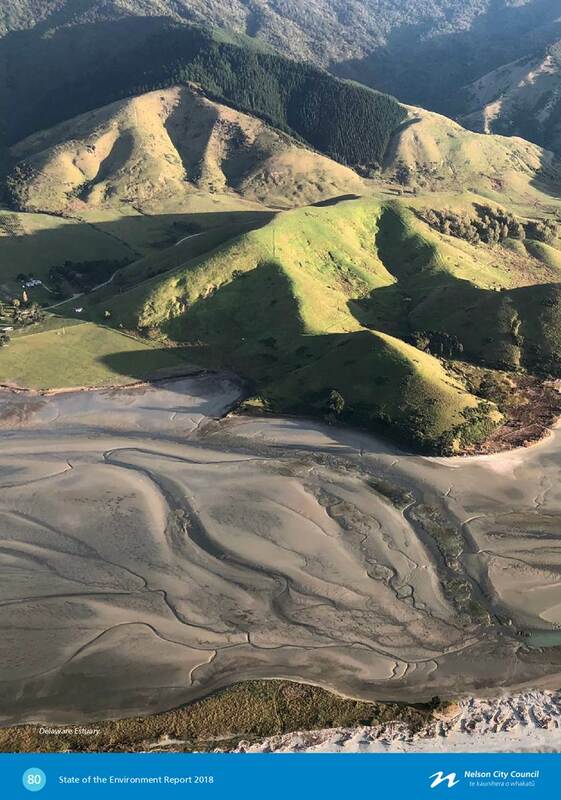 On Thursday 21 February 2019, commencing at 9.00a.m. Receives and accepts an apology from Ms G Paine. Attendance: Councillor Fulton entered the meeting at 9.02a.m. 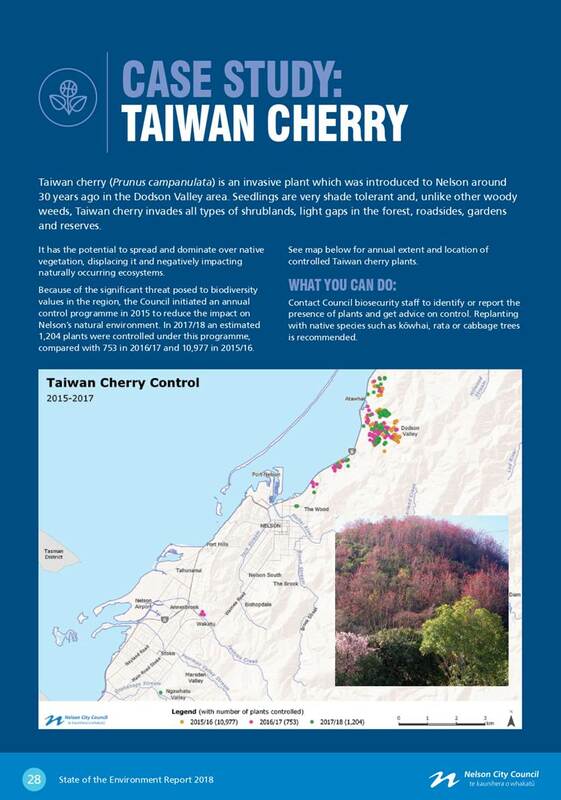 Document number M3934, agenda pages 7 - 10 refer. 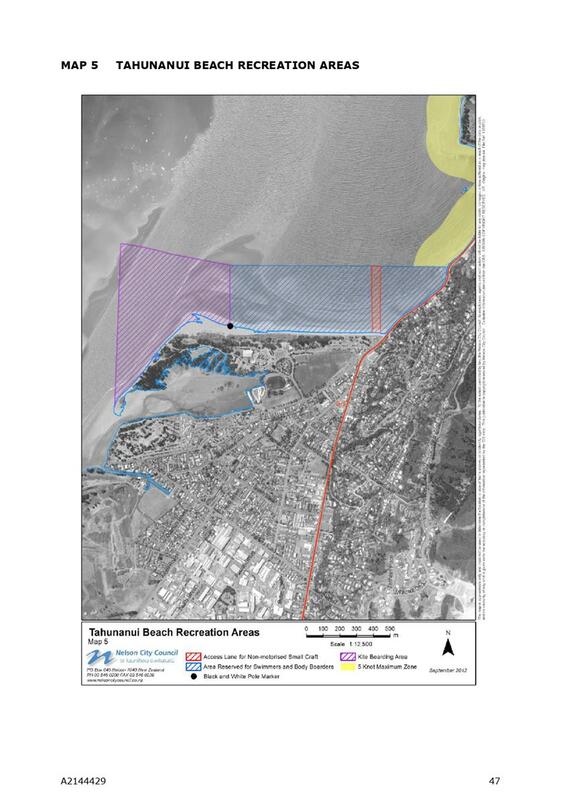 Confirms the minutes of the meeting of the Planning and Regulatory Committee, held on 22 November 2018, as a true and correct record. 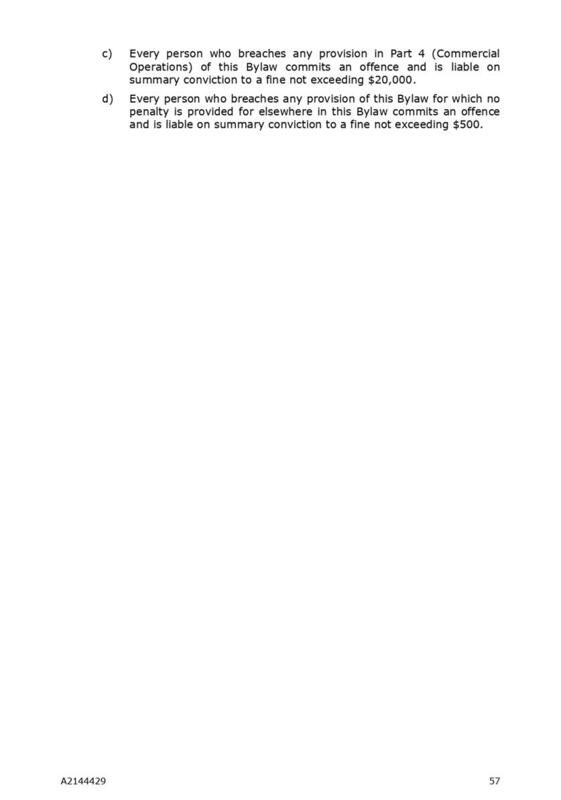 Document number M3932, agenda pages 11 - 18 refer. 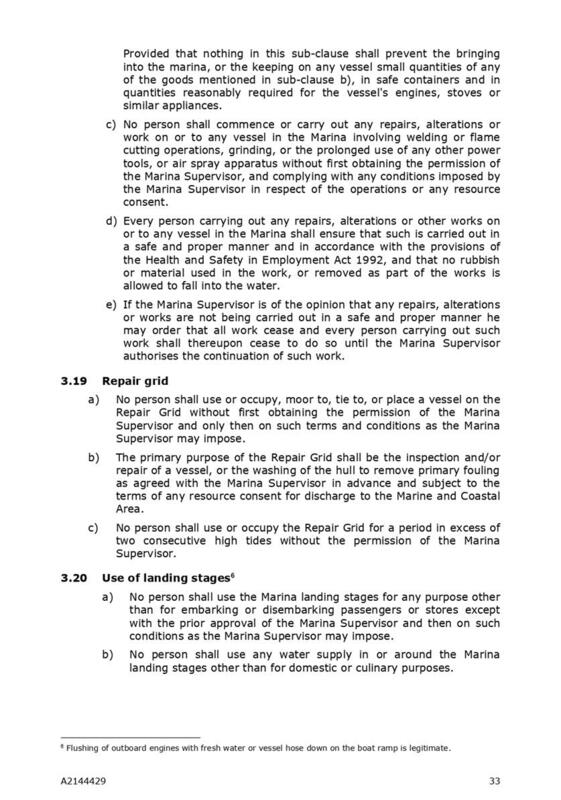 Document number M3977, agenda pages 19 - 23 refer. 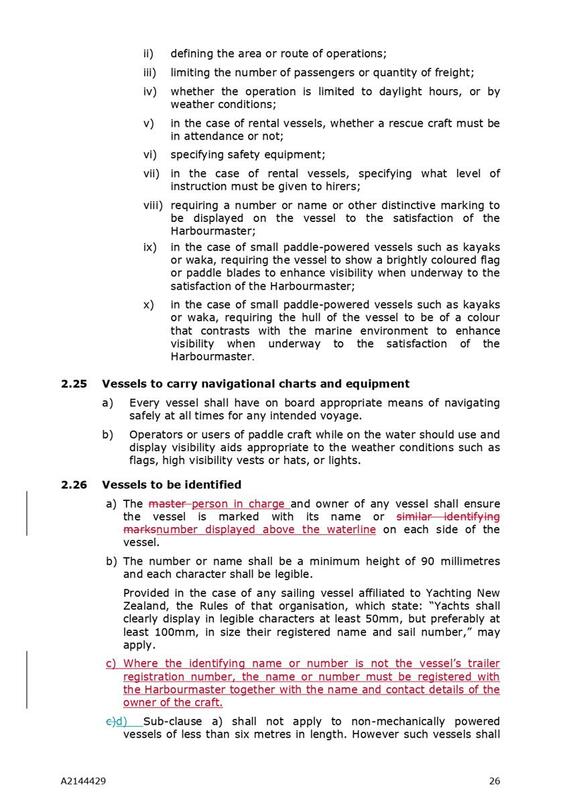 Confirms the minutes of the meeting of the Planning and Regulatory Committee, held on 6 December 2018, as a true and correct record. 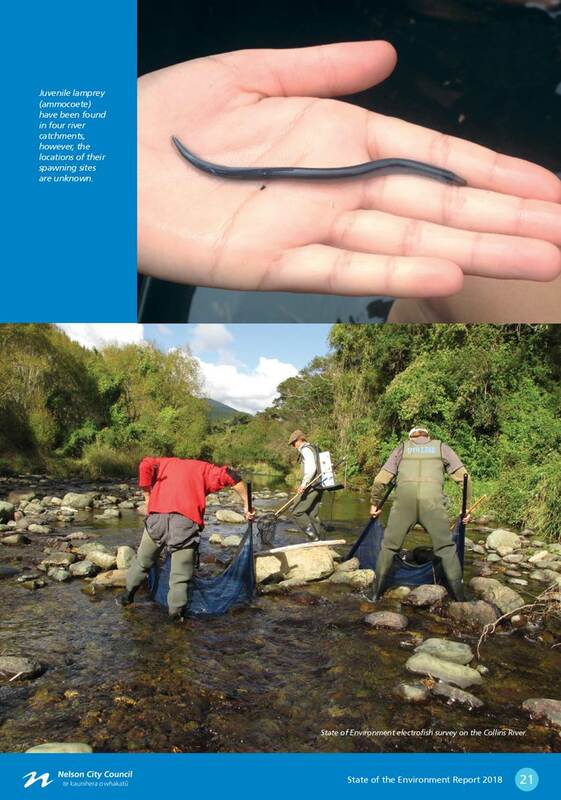 Document number R10007, agenda pages 24 - 25 refer. 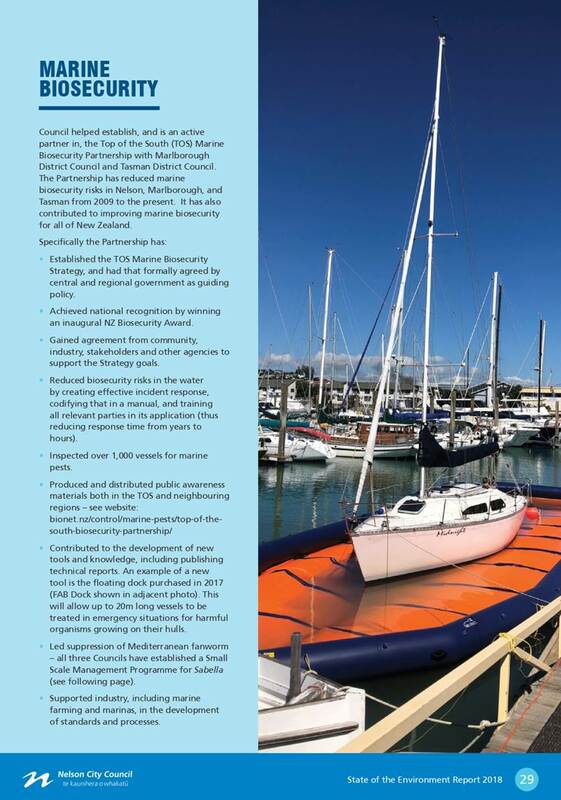 The Chairperson answered a question relating to Council’s role in managing recreational vessels to prevent or slow the spread of marine pests, noting that a piece of work was underway and the issue was raised at a recent Annual Plan workshop. Receives the report Chairperson's Report (R10007. 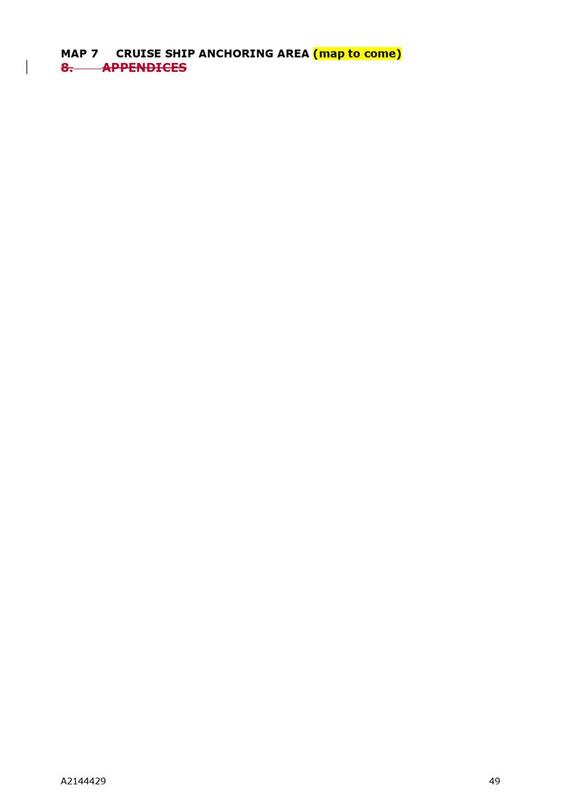 Document number R9905, agenda pages 26 - 64 refer. 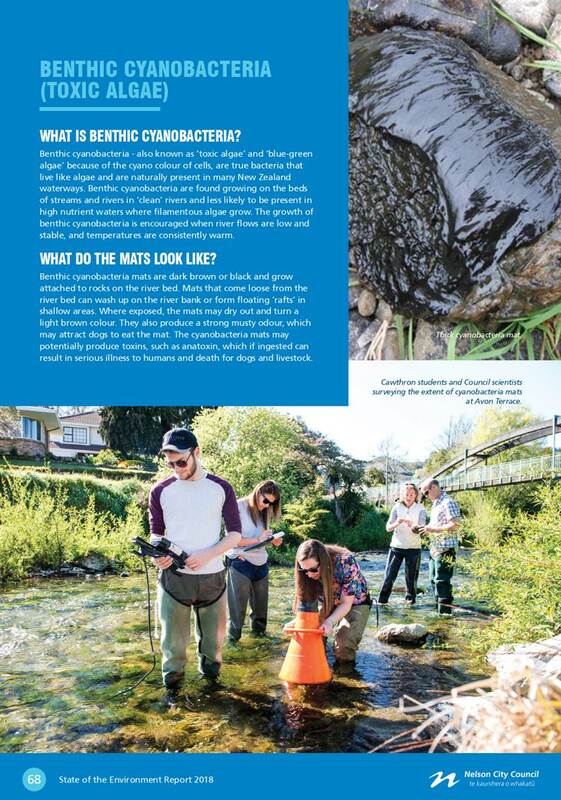 Manager Consents and Compliance, Mandy Bishop, Manager Environment, Matt Heale, Manager Building, Martin Brown, Team Leader City Development, Lisa Gibellini and Team Leader Science & Environment, Jo Martin were present to answer questions. 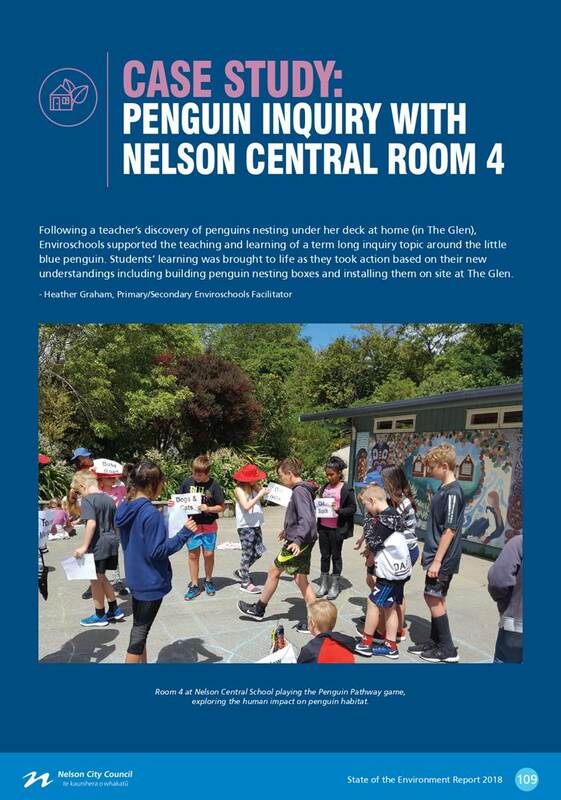 Mr Heale highlighted a change to paragraph 6.51 of the quarterly report, noting that the Nelson Plan Elected Member Working Group meeting had been deferred until May. 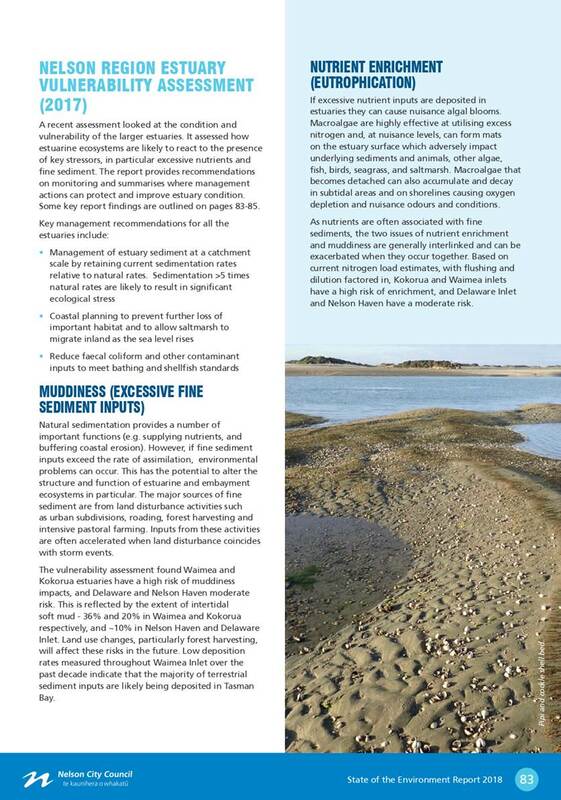 Discussion took place on the need to get those dates set and the importance of governor oversight of proposed significant changes to the Plan. 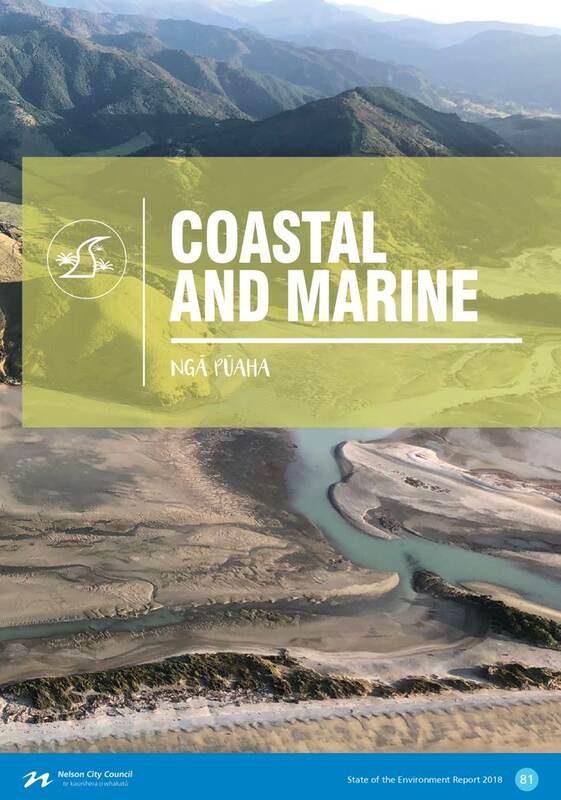 Officers responded to questions regarding consent processing times, the Future Development Strategy, IANZ accreditation, the Land Management Manual, the Biodiversity Forum, water quality in the Maitai and the MARPOL submission. 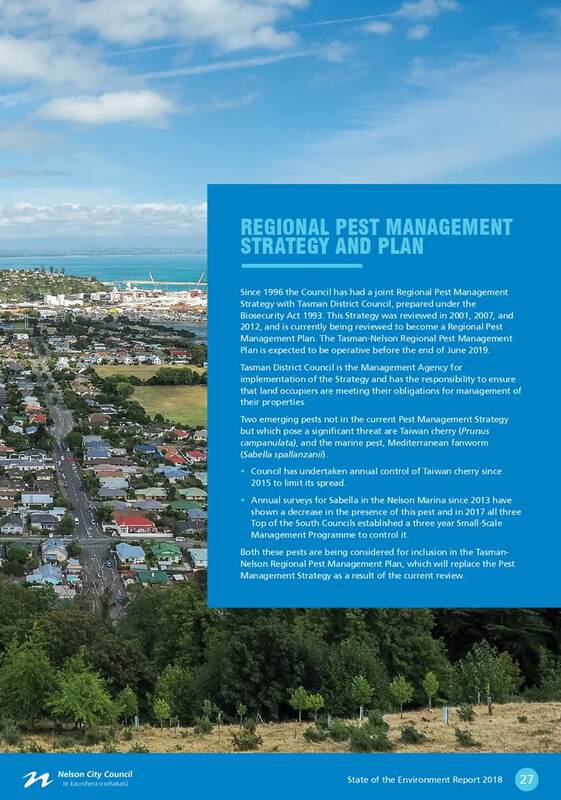 Further discussion took place on the Nelson Plan process and Mr Heale confirmed that the Plan was undergoing peer and legal review, and that once officers received that feedback, they would know the extent of the changes required and could bring that work to Elected Members. It was reiterated that the Working Group required a mandate from the Committee and would need to advise the Committee of material changes, ensuring a transparent process. It was noted that a discussion regarding the reporting of Section 357 objections needed to take place as this was missing at the moment. 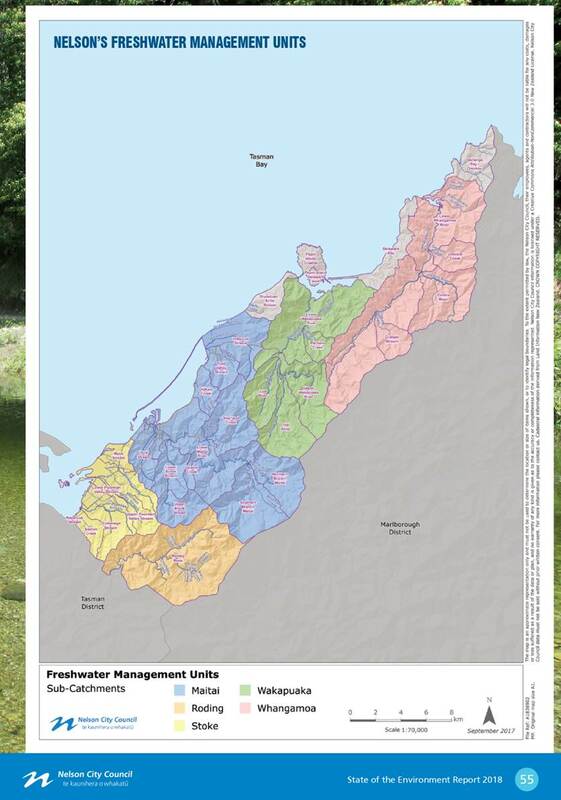 Approves that the Progressive Implementation Programme for Freshwater is updated to align with the amended Nelson Plan timeline. 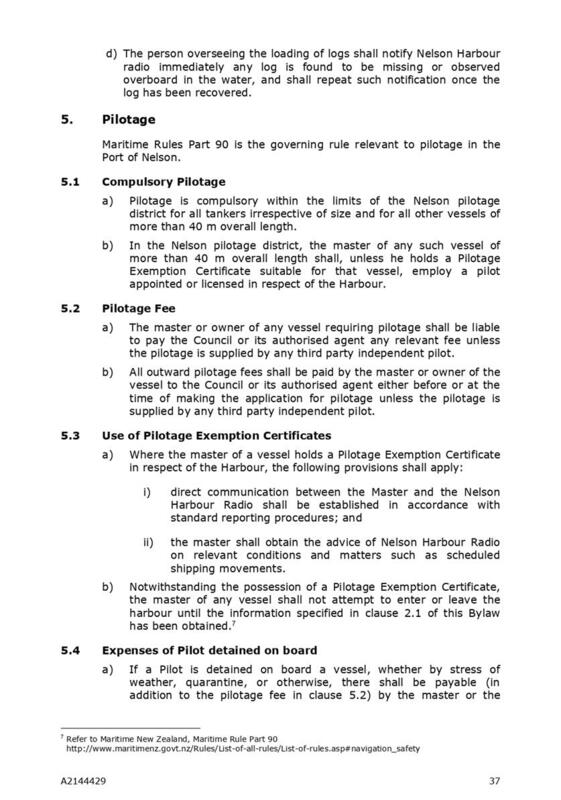 Document number R9972, agenda pages 65 - 75 refer. 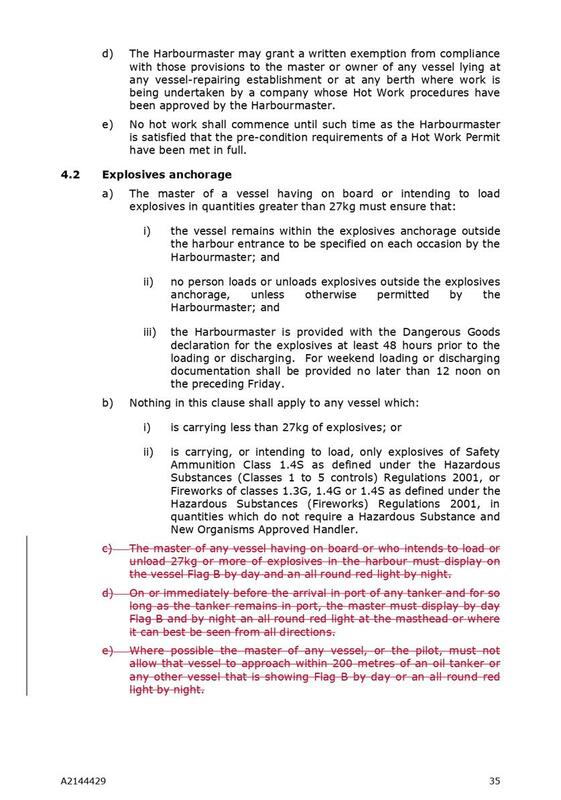 Group Manager Environmental Management, Clare Barton, declared a conflict with this item and Manager Consents and Compliance, Mandy Bishop acted as lead officer. 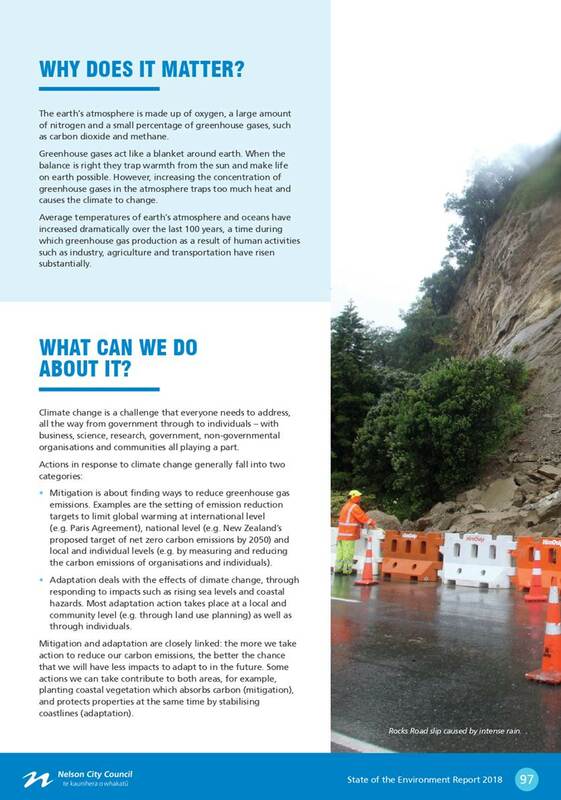 Manager Environment, Matt Heale, advised that on page 71 of the agenda report, Option 2 - risks and disadvantages, was incorrect and that paragraph 7.6 of the report was the correct information. 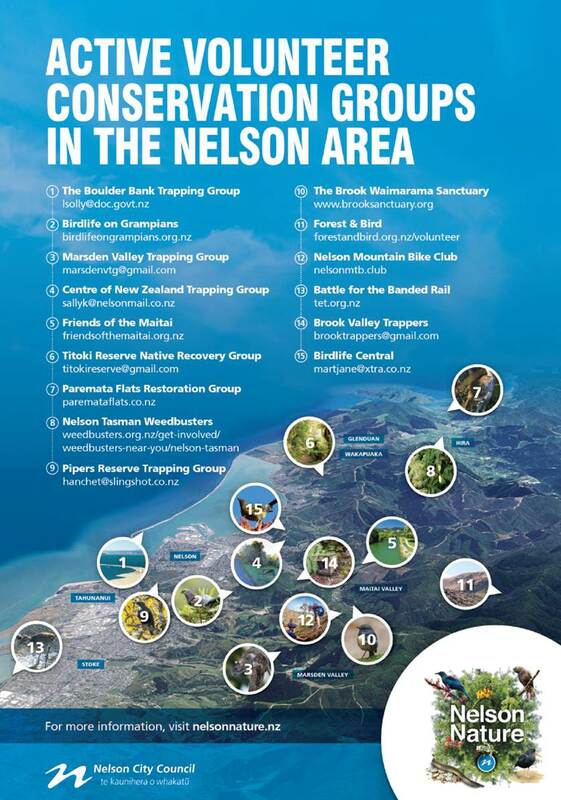 He referred to the map in Attachment 1, which identified where Quakers Acre and Wellington Reserve were. Mr Heale also noted that since the agenda had been published, Police feedback had been received that, although Police reporting systems did not allow specific data on locations, based on experience, this had been a problem location for the Police for years. He said that Police would support this being a liquor ban area. Mr Heale answered questions regarding the risk of displacement, the safety audit, consideration of mental health and addiction issues, work with social agencies, residents’ concerns, anti-social behaviour, improvement of amenities and the review of the bylaw process next year. 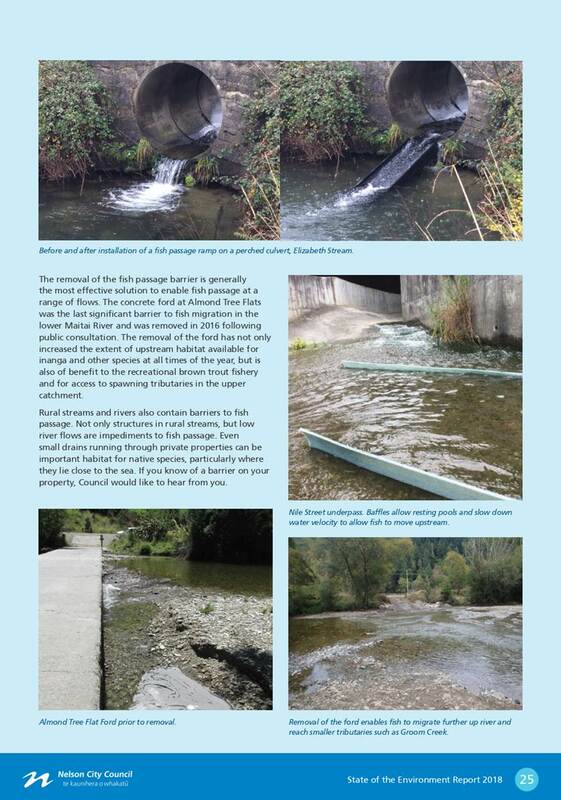 Approves completion of a Crime Prevention Through Environmental Design Safety Audit to identify whether any physical improvements to the Kerr Street Walkway area are necessary. The meeting went into public excluded session at 10.17a.m. and resumed in public session at 10.19a.m. 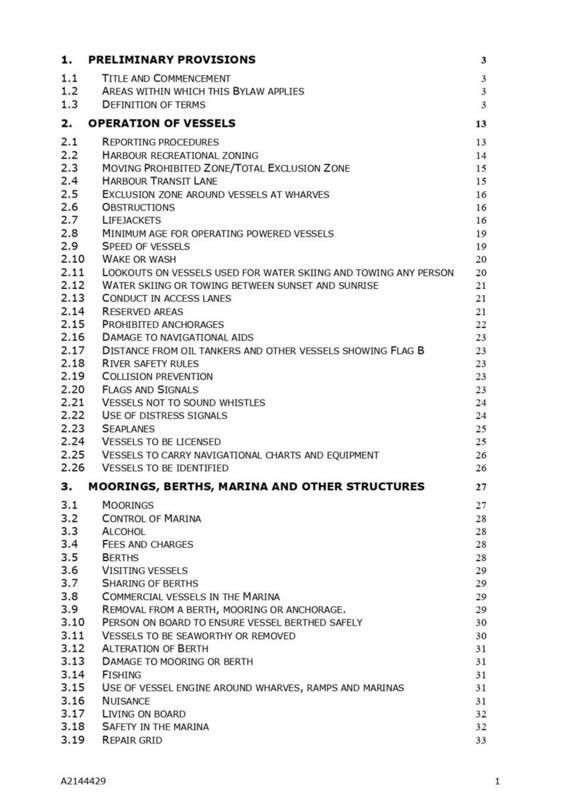 Document number M3933, agenda pages 3 - 4 refer. 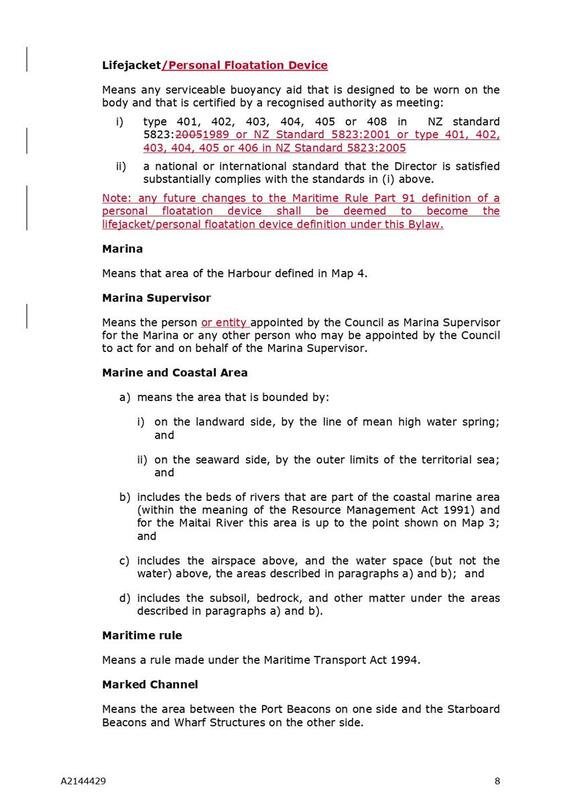 Confirms the minutes of part of the meeting of the Planning and Regulatory Committee, held with the public excluded on 22 November 2018, as a true and correct record. There being no further business the meeting ended at 10.19a.m. 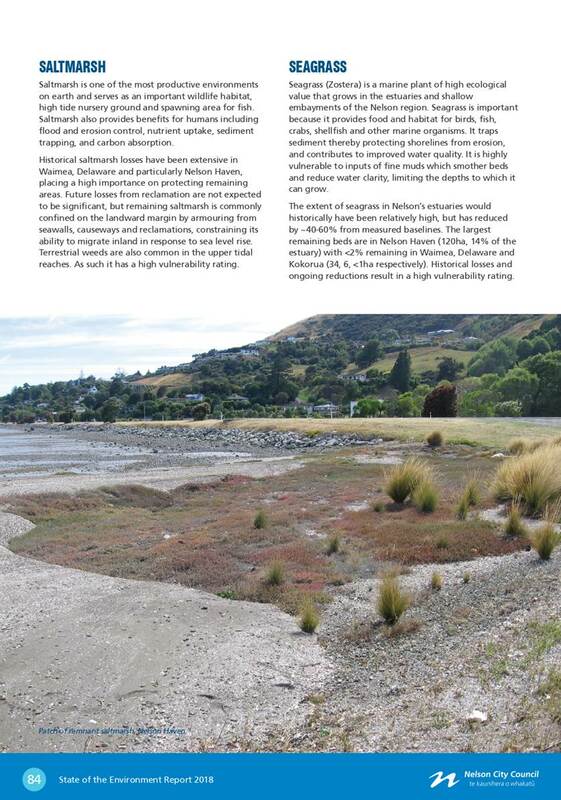 1.1 The purpose of the report is to introduce the Nelson State of the Environment Report 2018 (Attachment 1). 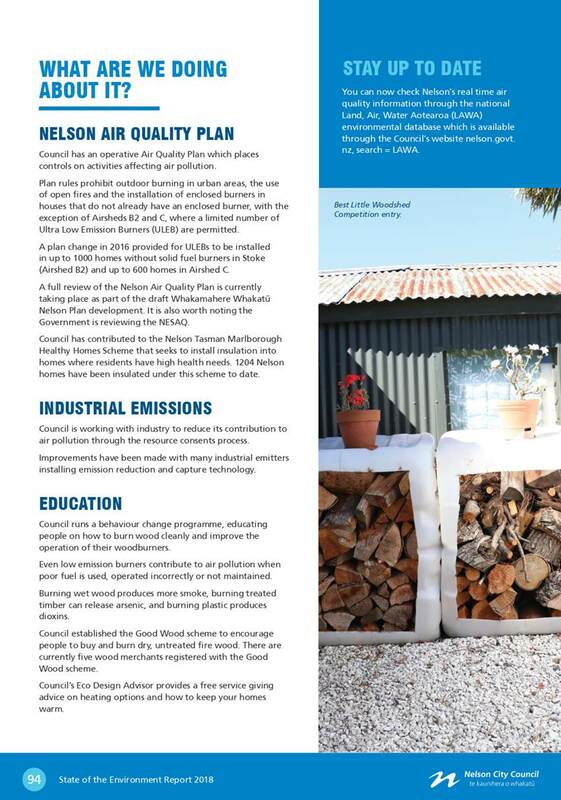 1.2 The report recommends that the Planning and Regulatory Committee receives the Nelson State of the Environment Report 2018 and approves it for distribution as a Council document. 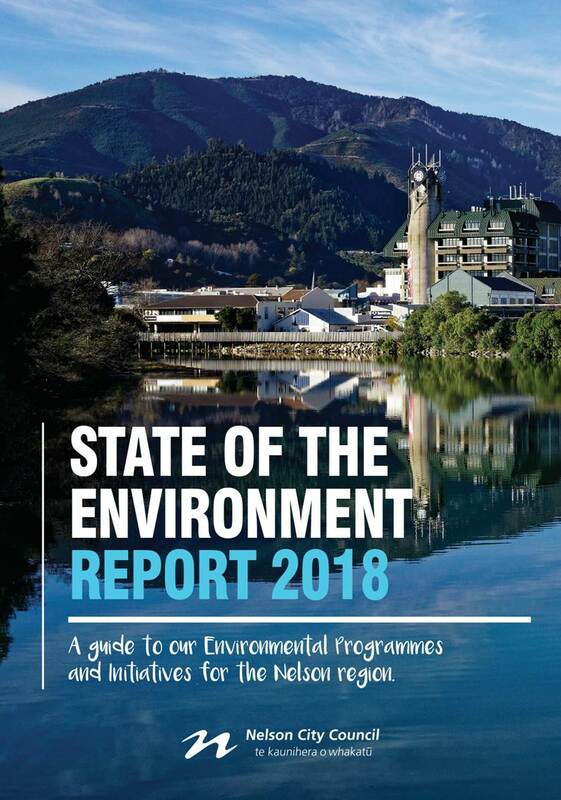 2.1 The State of the Environment Report 2018 provides a summary of the current state for key environmental domains, along with a summary of monitoring programmes and mandatory reporting for the Ministry for the Environment. 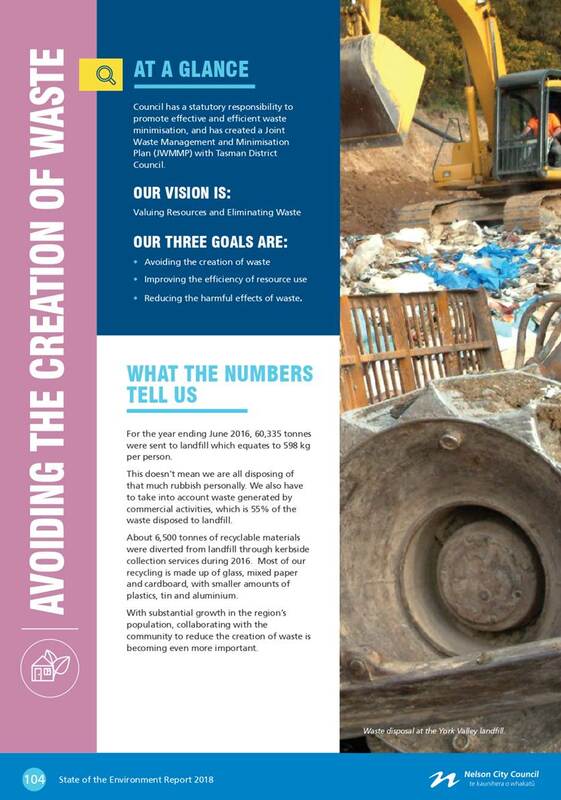 Case studies are included to describe specific projects and provide factual information. 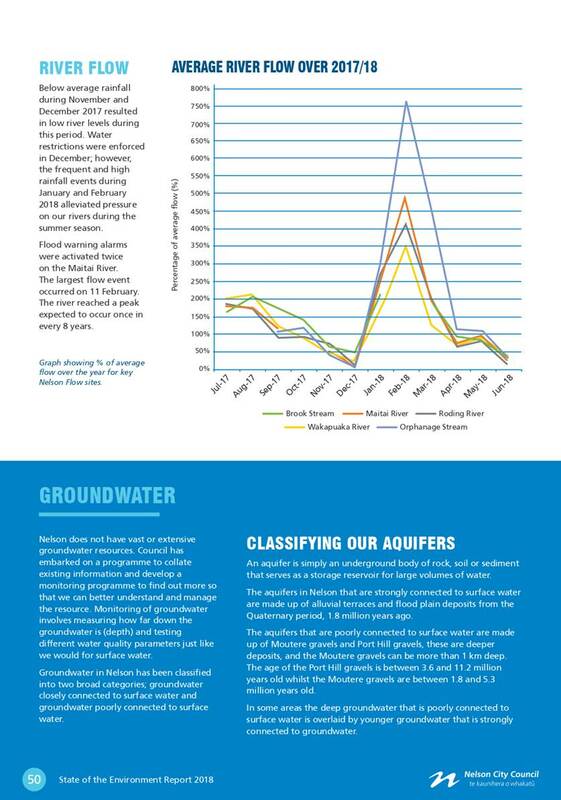 The report is aimed at a public audience. 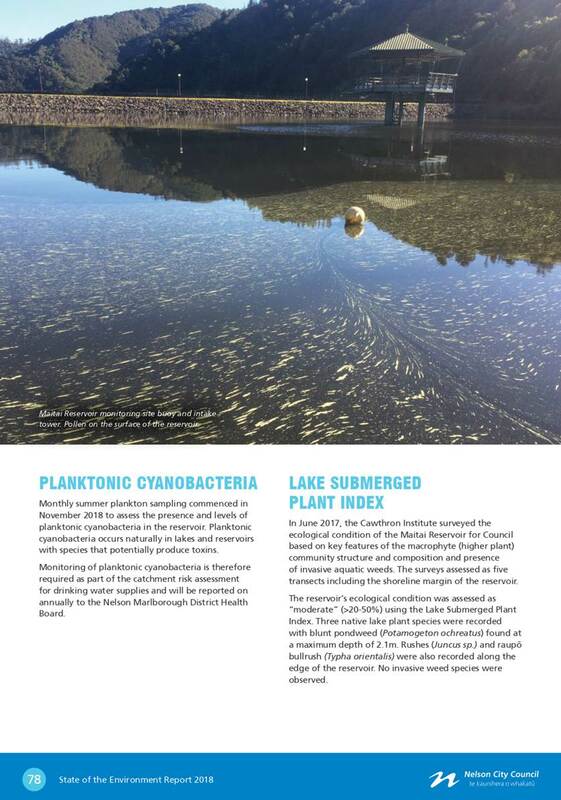 The report has been peer reviewed by Cawthron. 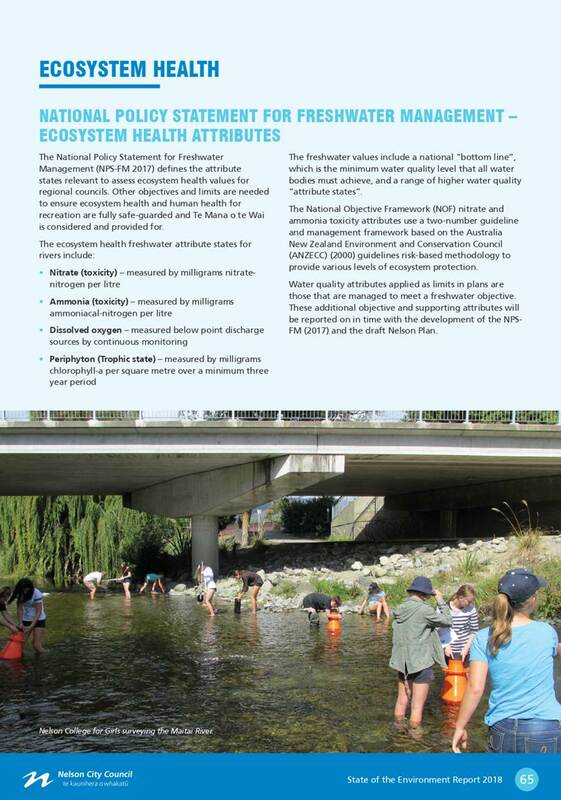 2.2 This report meets Nelson City Council’s obligations under the Resource Management Act (1991) to regularly report on the state of the environment, and includes additional information to that reported nationally via the regional council Land, Air, Water, Aotearoa (LAWA) web portal and the Environmental Reporting Act (2015) ‘domain’ reports. 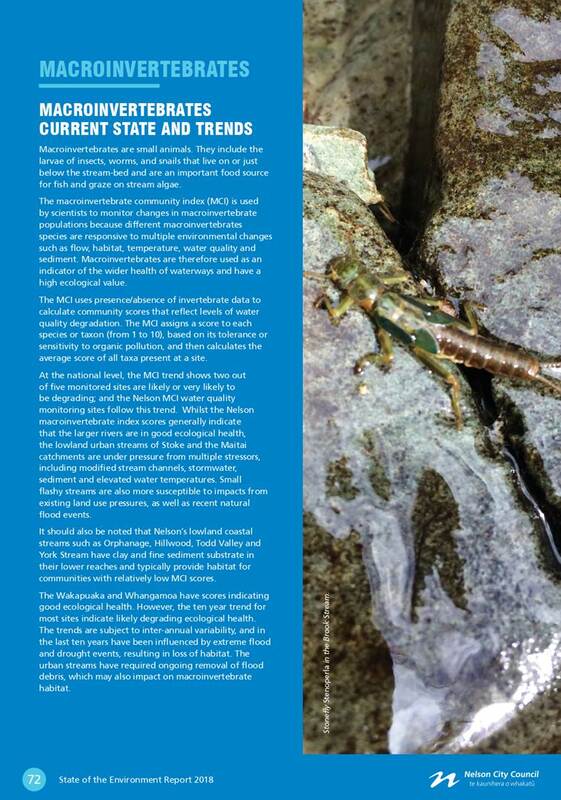 4.1 The last State of the Environment report was produced in 2010. 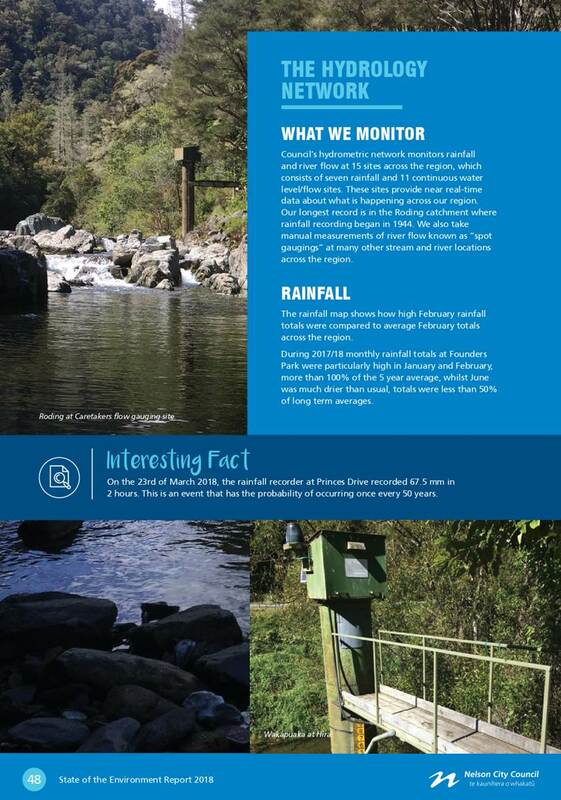 Annual scorecards for river and stream health, recreation bathing water quality and air quality have been produced from 2010/11 to 2015/16. 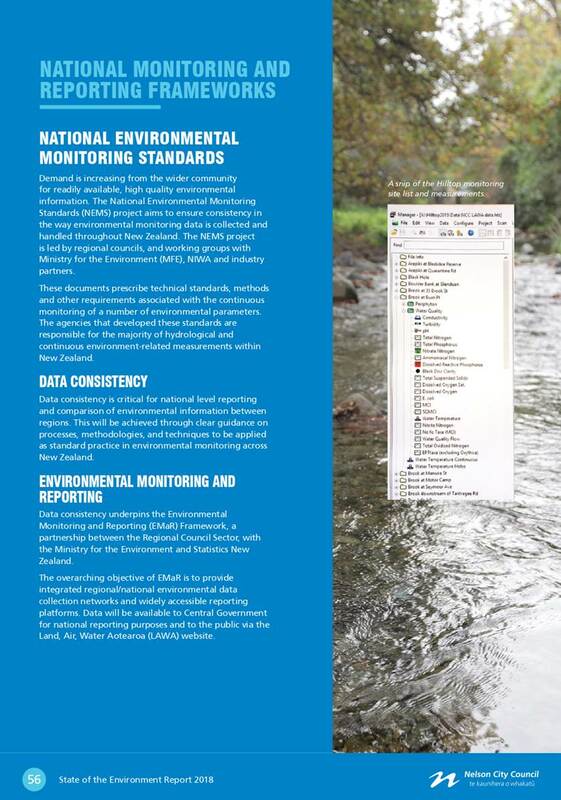 This State of the Environment Report provides an update to these core monitoring programmes and introduces new environmental management programmes that allow monitoring and reporting across the full range of environmental domains. 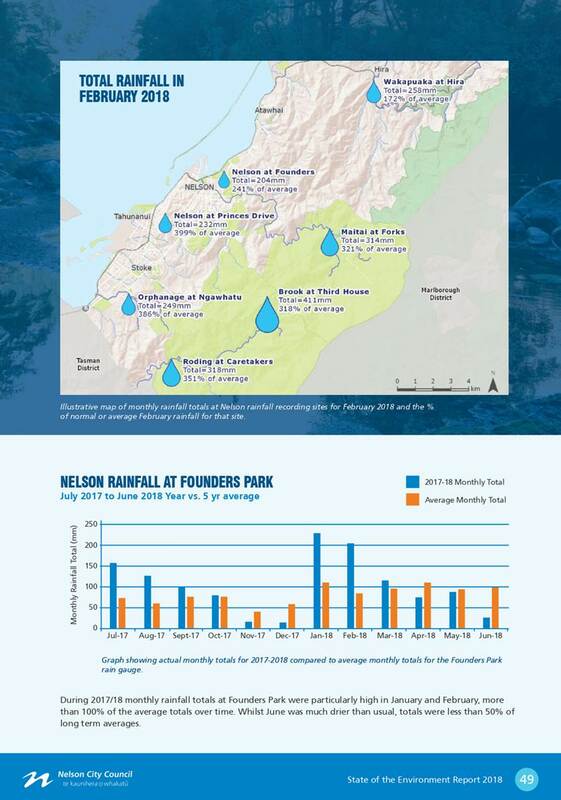 5.1 This report demonstrates a real improvement in the depth and breadth of Nelson City Council’s environmental monitoring and actions since 2010. 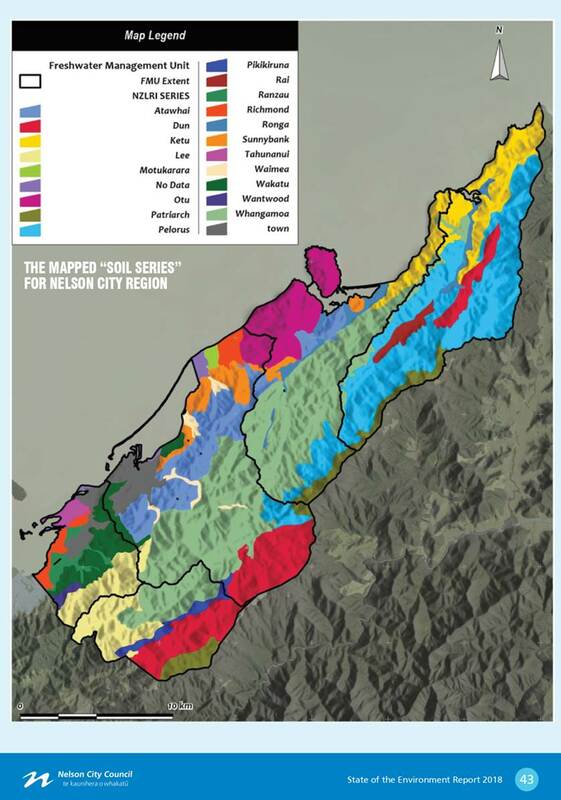 The 2010 actions report did not cover all of the regional council domains and the data sets are not comparable so cannot be considered a baseline. 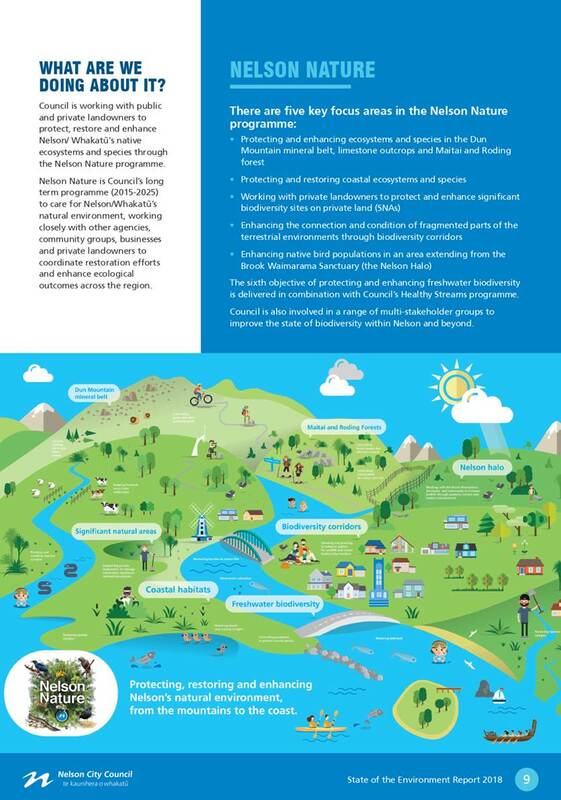 The report can be viewed as a baseline for all of the reporting domains, with a subsequent report planned for five years’ time to report on the same metrics and the outcomes of the programmes highlighted in the case studies. 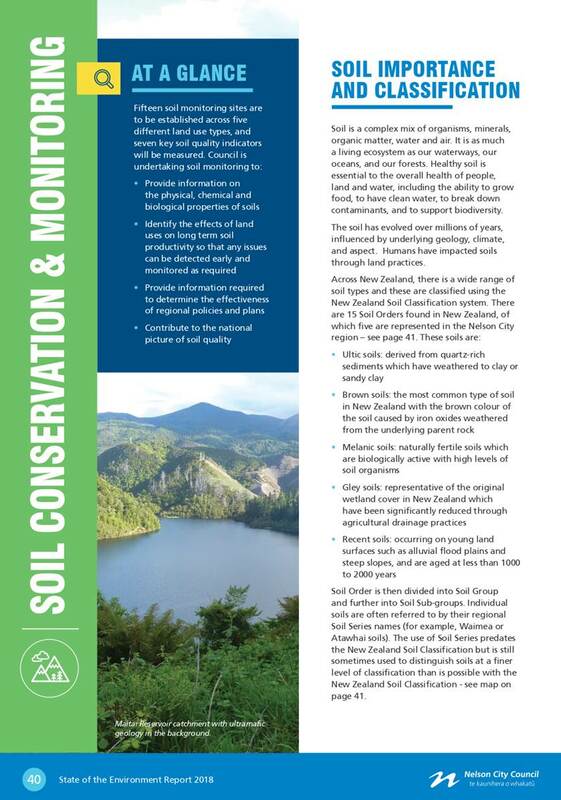 5.2 In addition, it is intended to continue reporting on the core monitoring programmes annually as a collection of infographic scorecards, to ensure Council information is widely available to the public and to assist with reporting against annual and long term targets. 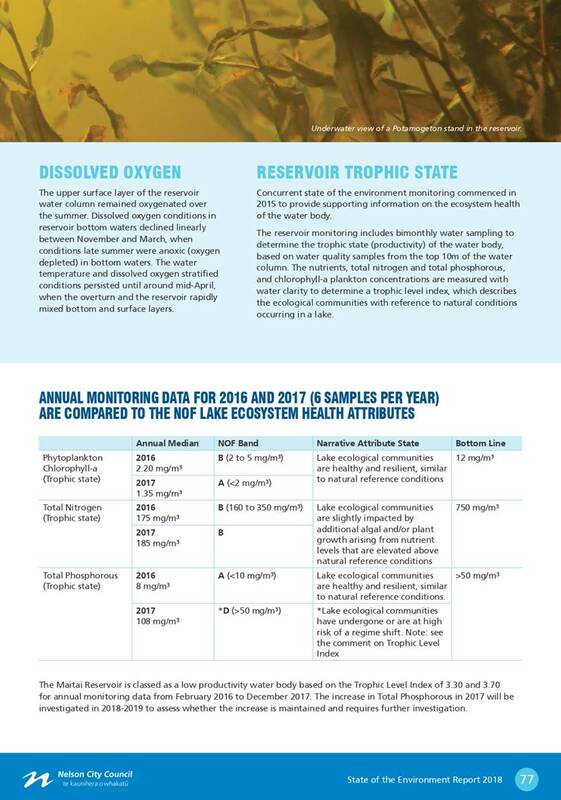 5.3 The report is recognition of the fact there is now science and monitoring programmes spanning all of the environmental domains, along with a wide range of action programmes which are highlighted in the case studies. 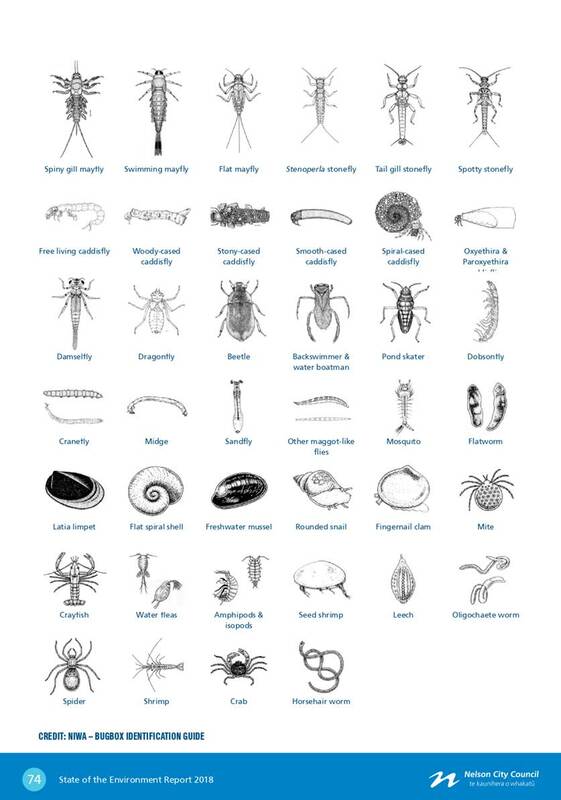 Some of these are still in their infancy, such as the coastal/marine and soil monitoring programmes, and it is anticipated that these domains will be able to be reported on more fully in the future. 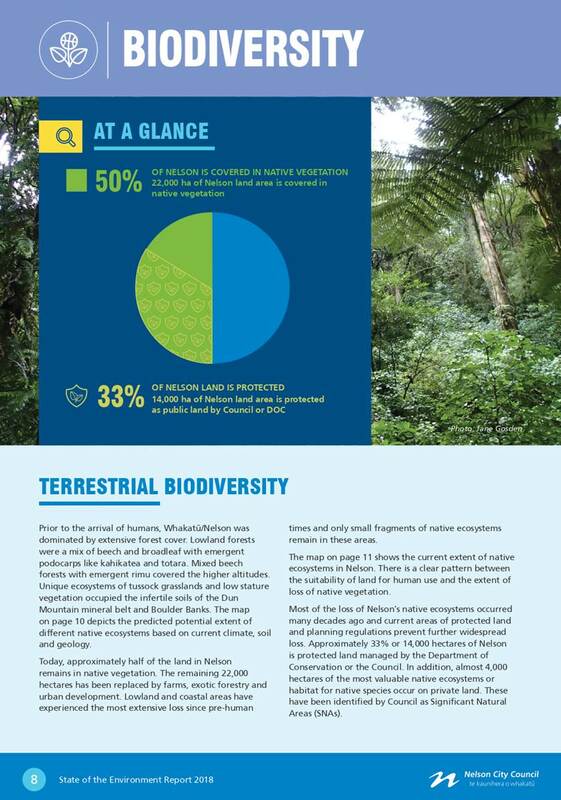 5.4 The report format includes infographics and images to explain scientific information in a non-technical manner, and ‘At a glance’ section summaries to appeal to the wider community and readers from school age upwards. 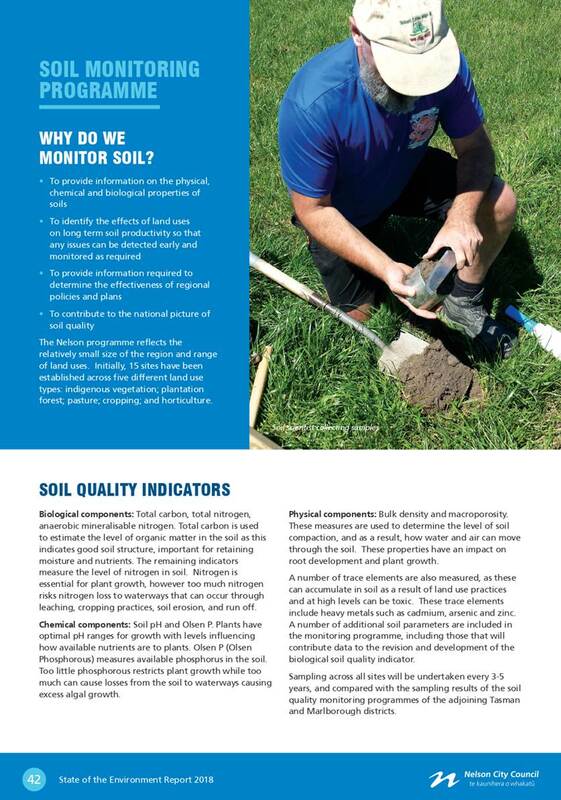 The reporting is evidence based and provides facts and figures that are supported by monitoring, research and peer-reviewed published literature. 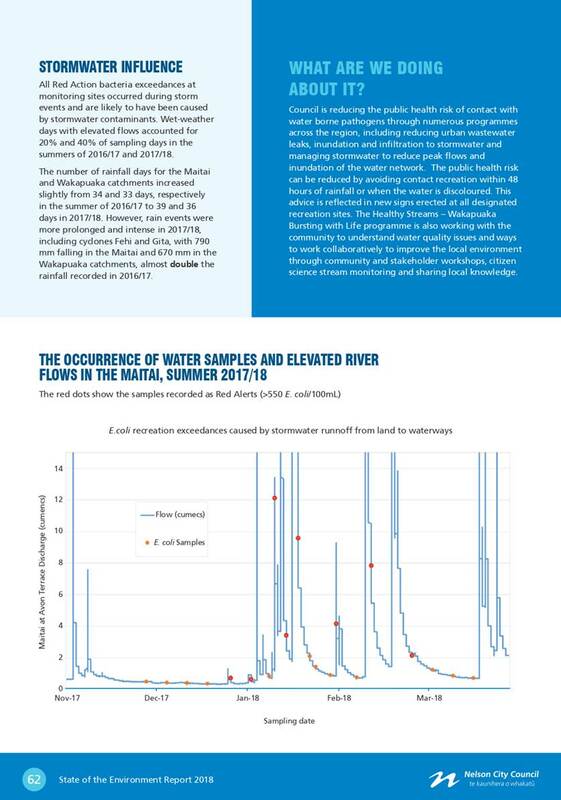 5.5 The data in the report does not paint a fully positive picture because where possible long term data sets have been used and it takes several years of improvement to change the trend. 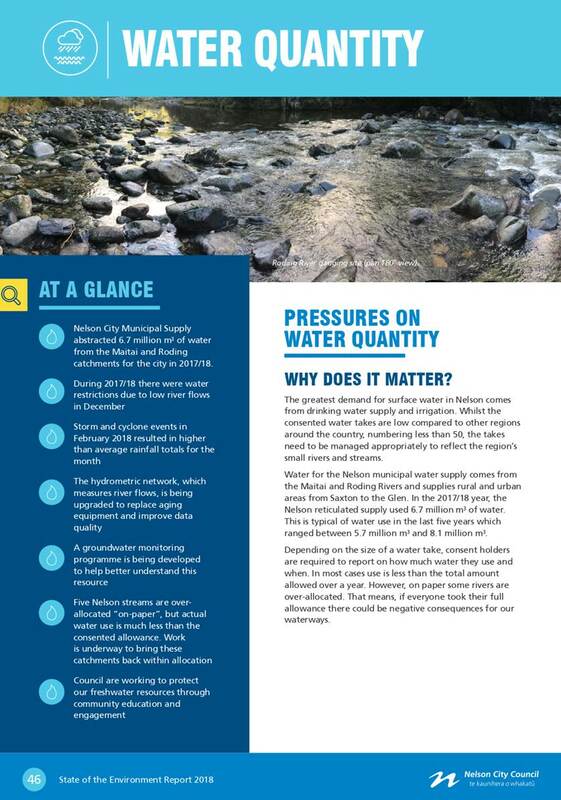 However the results have been included in the interests of transparency and are balanced with strong stories of what is being done to address the issues. 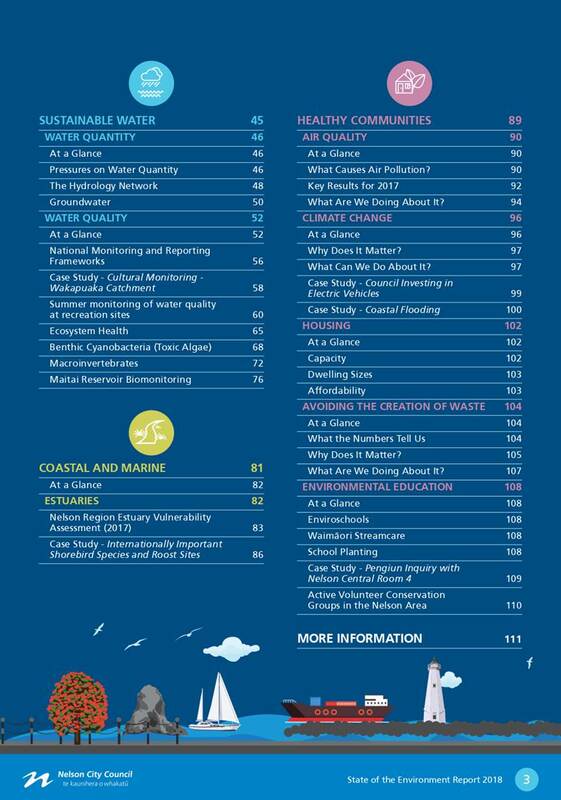 5.6 The table below compares current data with data from the 2010 State of the Environment report. 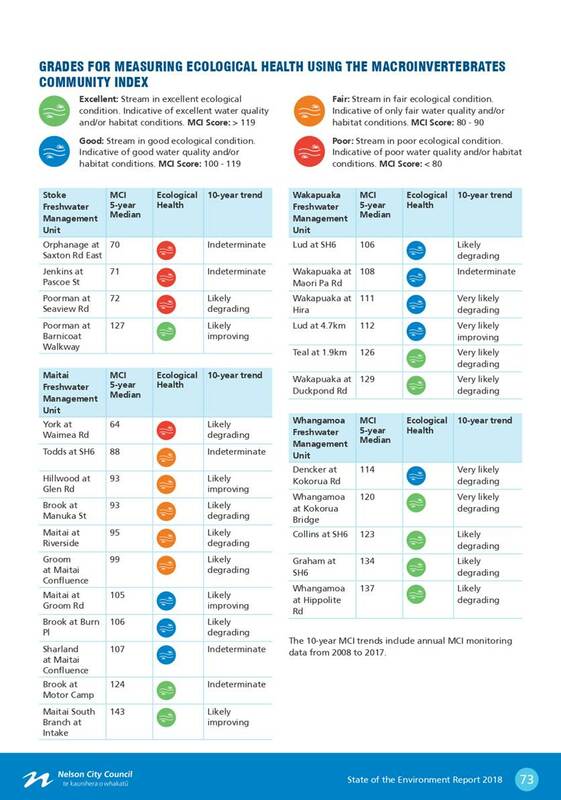 Explanatory commentary is provided below the table. Q4. 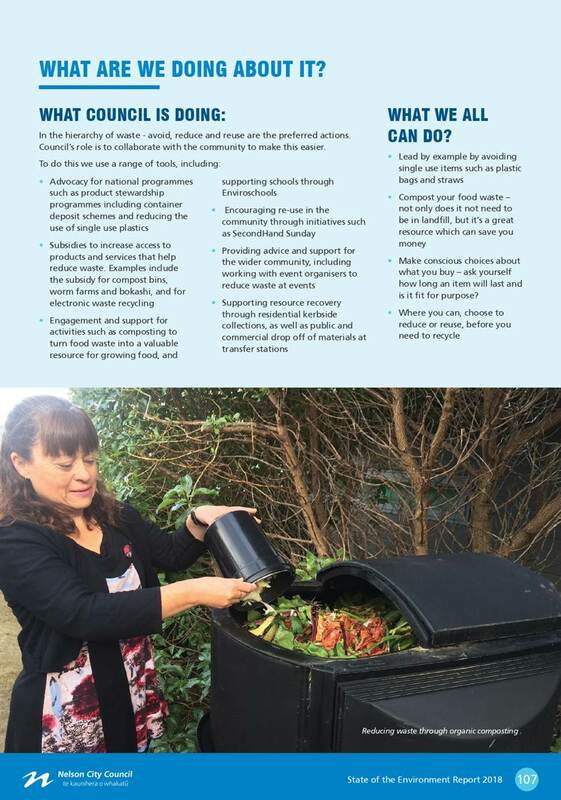 Do you compost food waste? Q5. 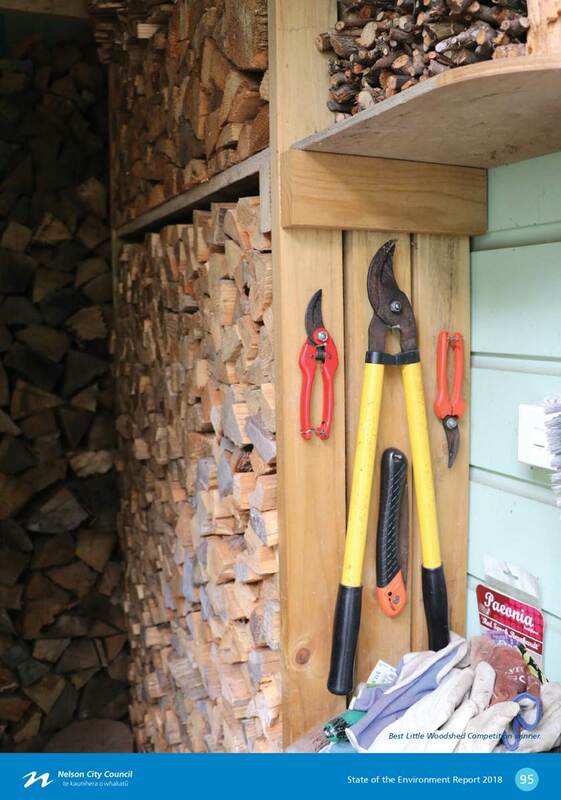 Do you compost garden waste? Does household compost food waste? Does household compost garden waste? 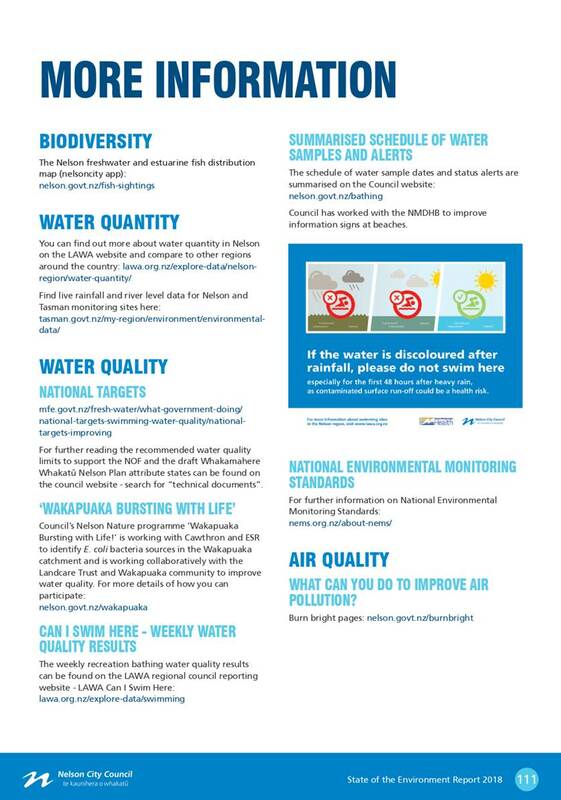 5.7.1 Air quality in Nelson South and Tahunanui is progressing toward the Air Quality National Environmental Standard (24 hour average for PM10 to remain below 50 µg/m3), with a target to only exceed the standard on one day a year from 2020. 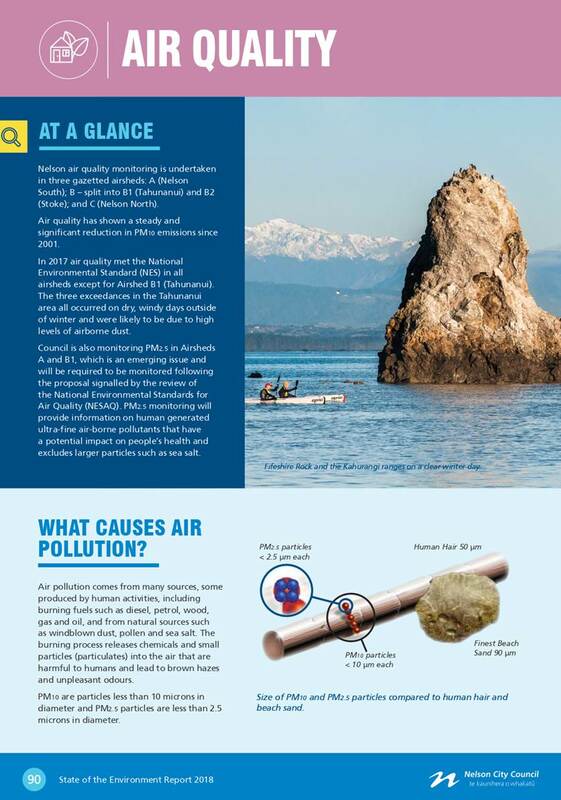 PM10 is particulate matter 10 micrometres or less in diameter, small enough to be inhaled. 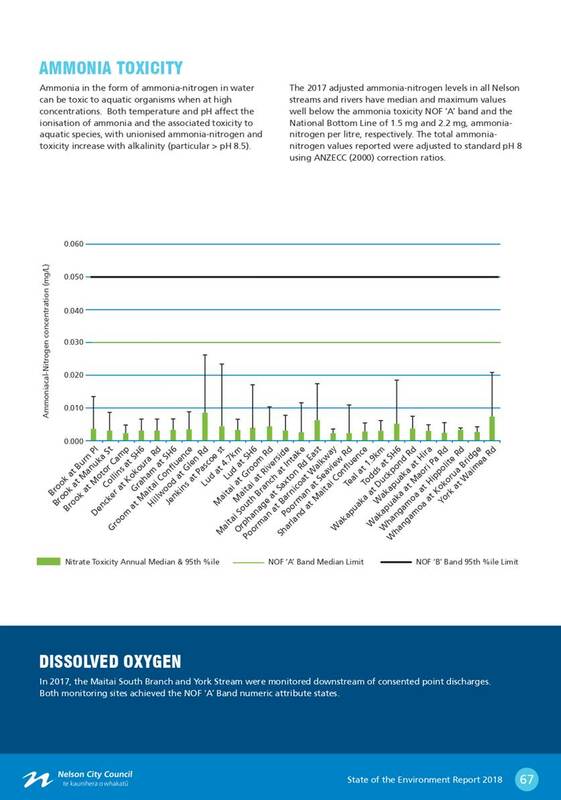 Exposure to high levels of PM10 can cause cardiovascular and respiratory health problems. 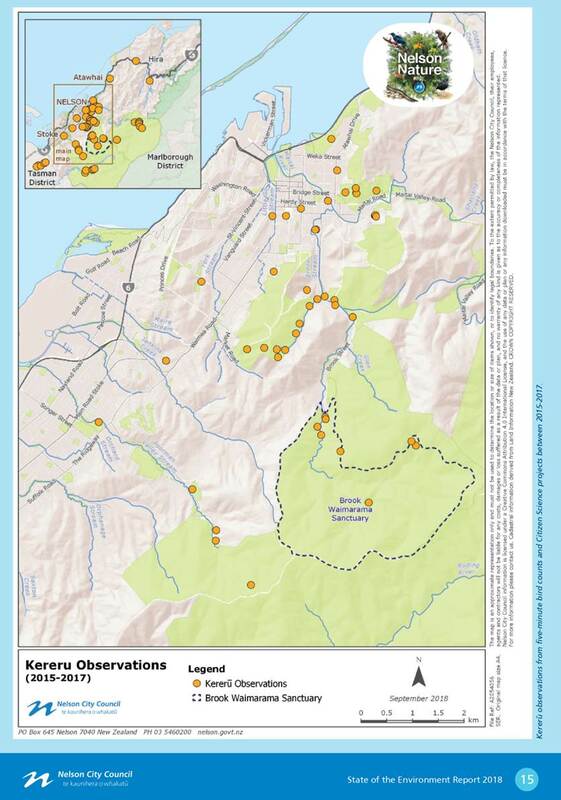 5.7.2 The Nelson South (St Vincent area) is tracking toward this target with a reduction in both PM10 exceedances and annual average concentration of PM10 particles since 2010. 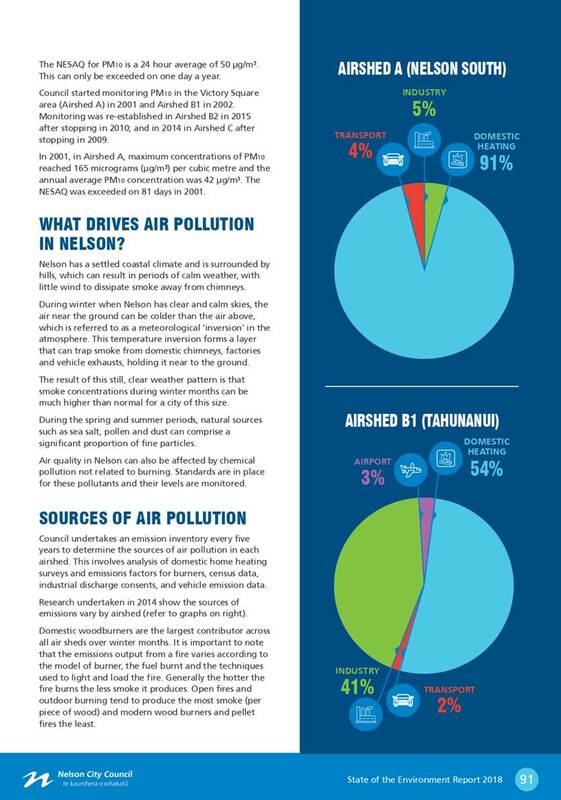 5.7.3 The target was achieved in the Tahunanui area along with a reduction in the PM10 annual average concentration since 2010. 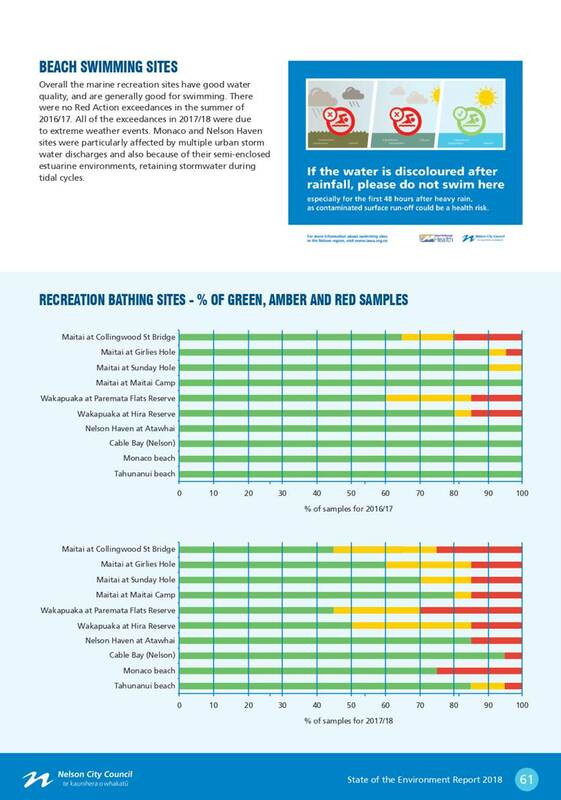 5.8.1 Of 25 monitoring sites, 14 sites have retained the same grading as in 2010. 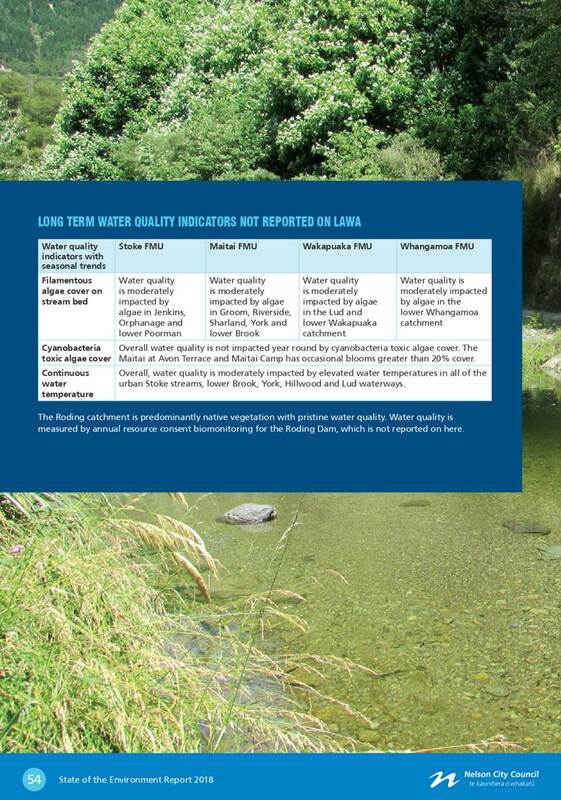 Four sites have improved in the Maitai and Wakapuaka catchments. 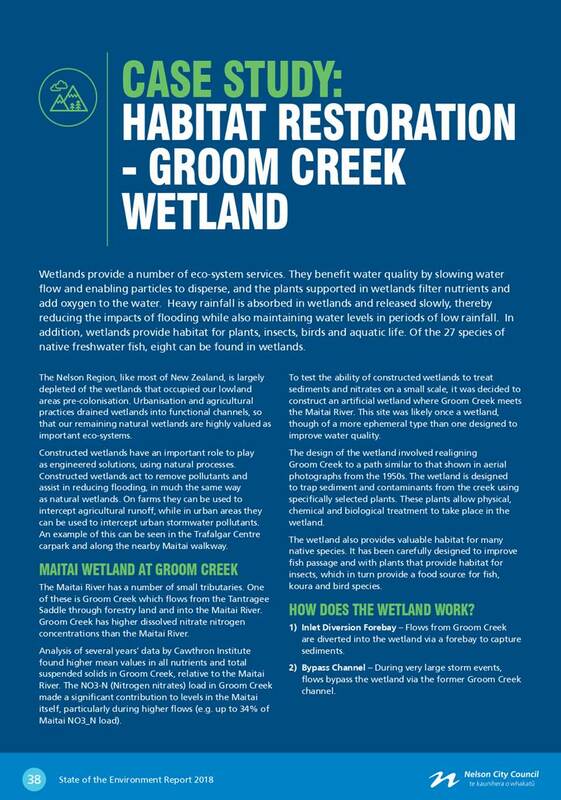 These improvements reflect water quality and restoration projects under the Council’s Project Maitai/Mahitahi, Nelson Nature and Healthy Streams programmes. 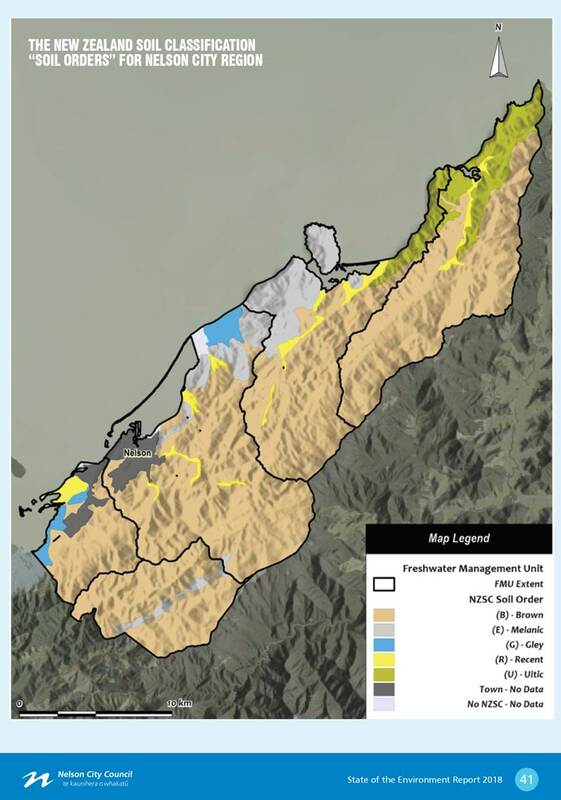 Seven sites have degraded and these are in areas that have come under increasing pressure from land use and forestry activity. 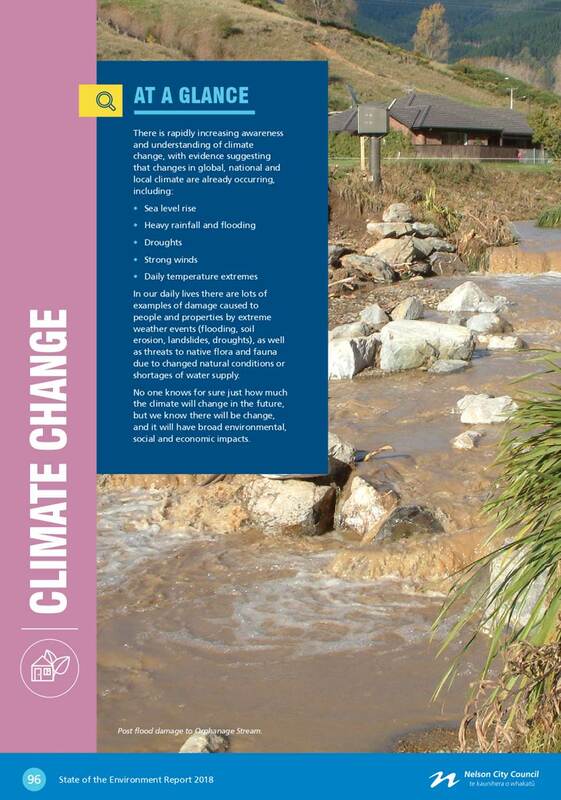 5.8.2 The sites that have degraded since 2010 are: Sharland at Maitai confluence; Groom at Maitai confluence; Whangamoa at Kokorua Bridge; Collins at SH6; Todds at SH6; and Orphanage at Saxton Rd East. 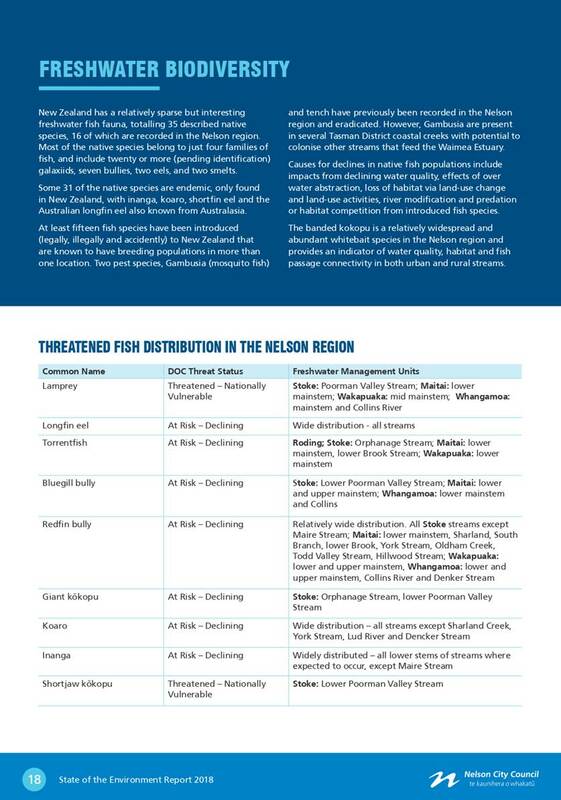 5.8.3 Sites categorised below the Freshwater Classification of ‘C’ are prioritised for improvement in the Nelson Resource Management Plan (NRMP). 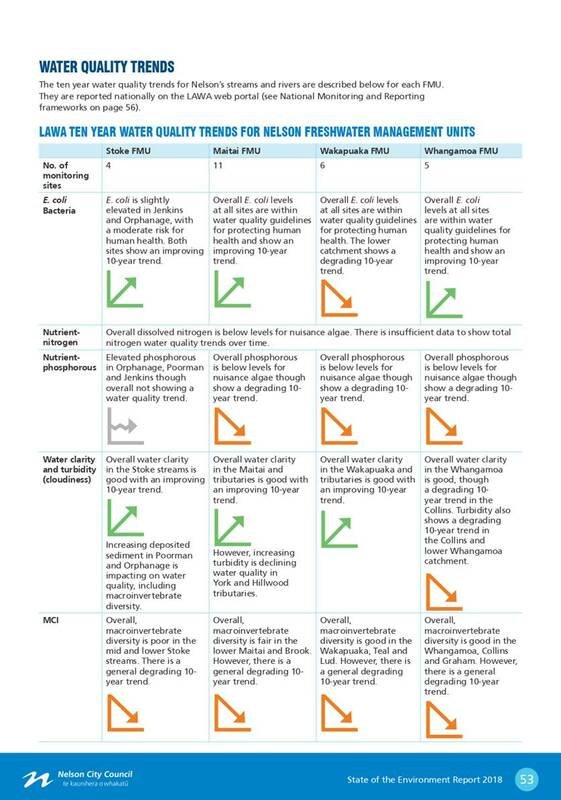 There has been a slight increase (by one) in the total number of water quality sites categorised as D or E.
5.9.1 These figures are based on answers to questions asked in the resident’s survey of 400 households. The figures were consistent between surveys in 2009, 2010 and 2014, but dropped noticeably in 2017 and again in 2018. 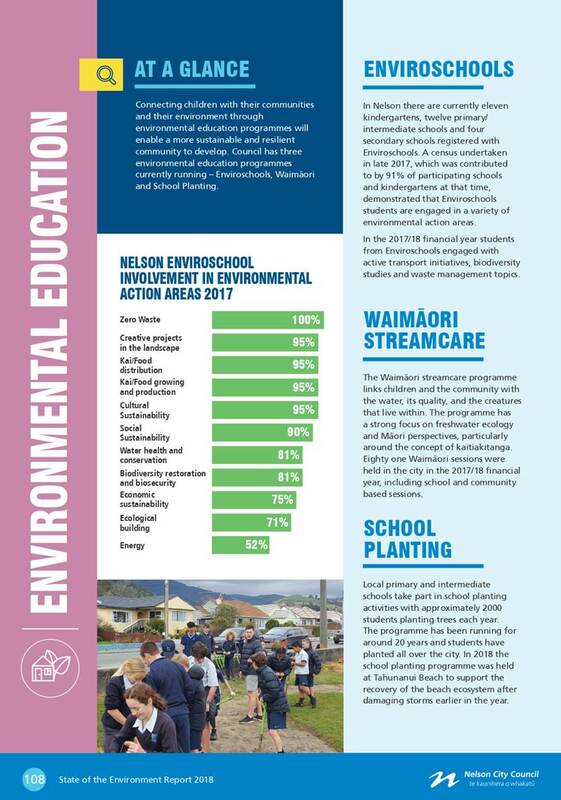 The environmental education/waste education role was vacant during this time and has since been filled. 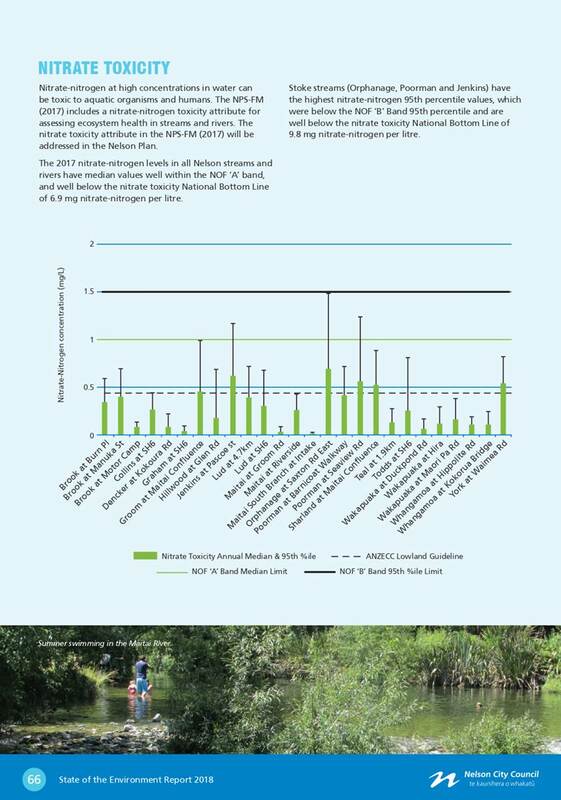 5.10.1 Sites put forward for inclusion as significant natural areas (SNAs) cannot be confirmed as SNAs until their significance is confirmed by surveys. 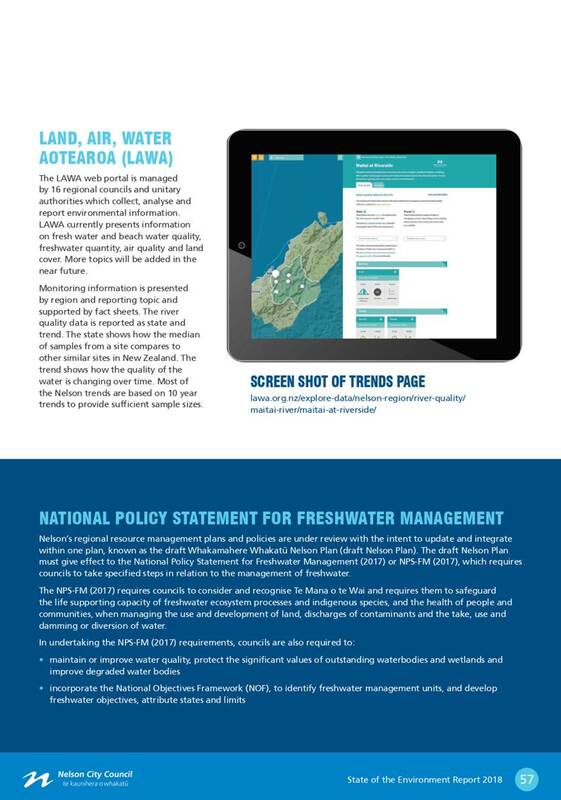 The current state is that of 244 sites put forward, 165 have been assessed either by survey or desk top analysis to be significant. 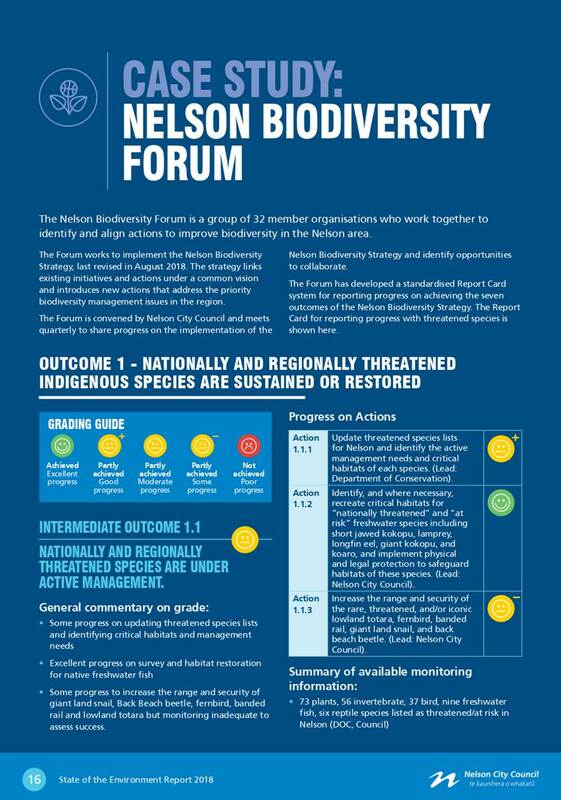 5.10.2 The SNA programme is likely to be of increasing importance with the development of the NZ Biodiversity Strategy and the proposed National Policy Statement for Indigenous Biodiversity. 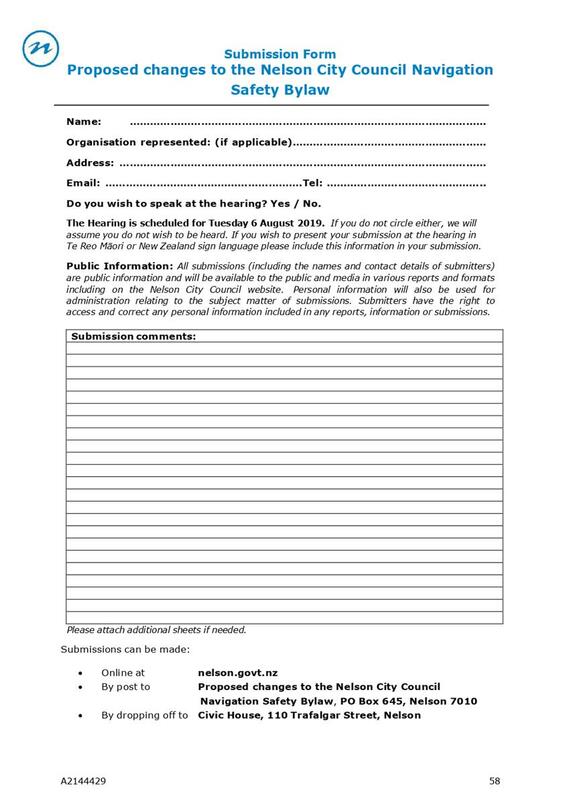 · Meet mandatory reporting requirements. 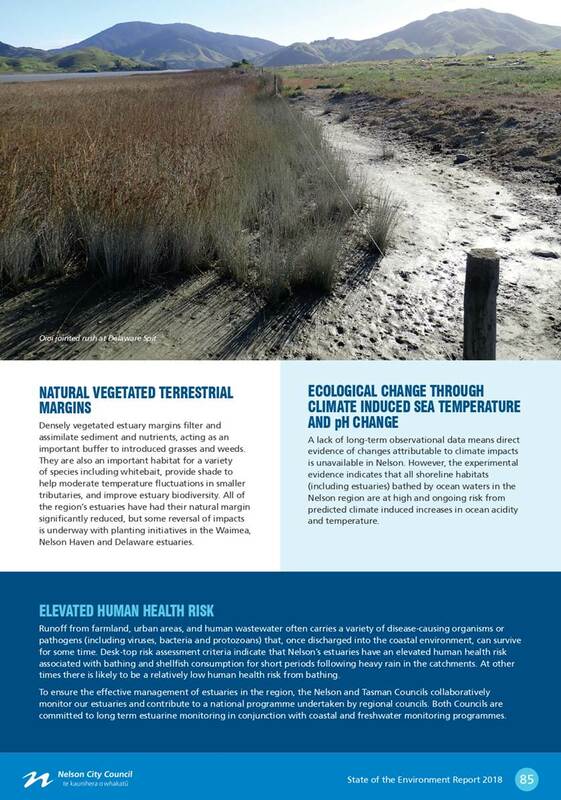 · This would require mandatory reporting by other methods which would not provide a consolidated overview of the environmental domains. 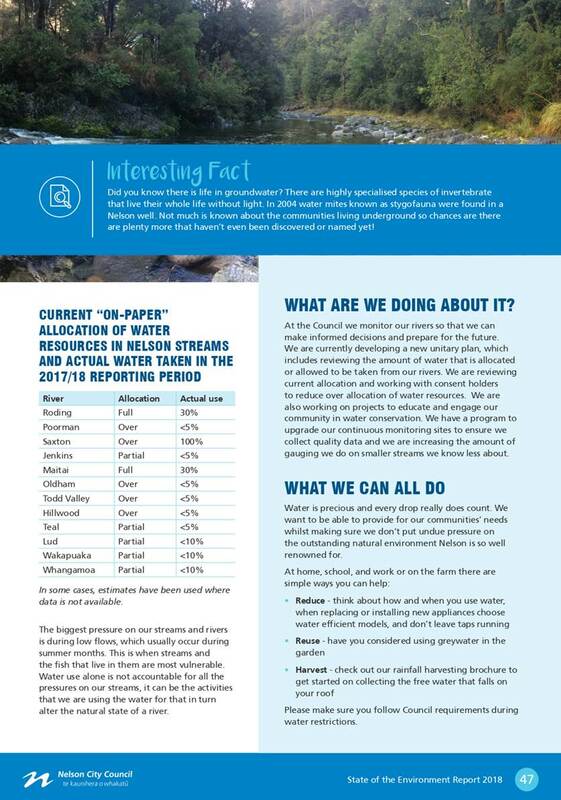 7.1 The Nelson State of the Environment 2018 provides an opportunity to present factual data across all environmental domains in a readily understandable way for the community. 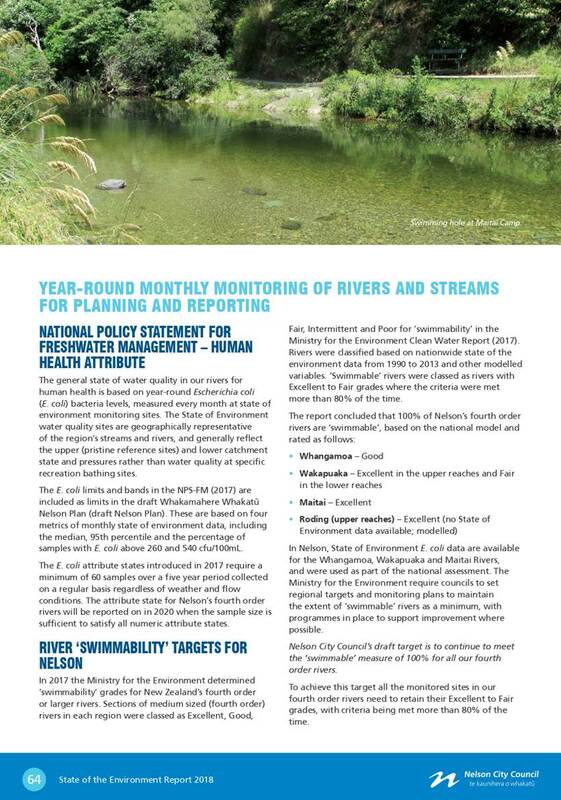 This report provides an update to the core environmental monitoring programmes, and introduces new environmental management programmes that support Council meeting Long Term Plan requirements, Nelson Plan objectives and targets, and national reporting requirements. 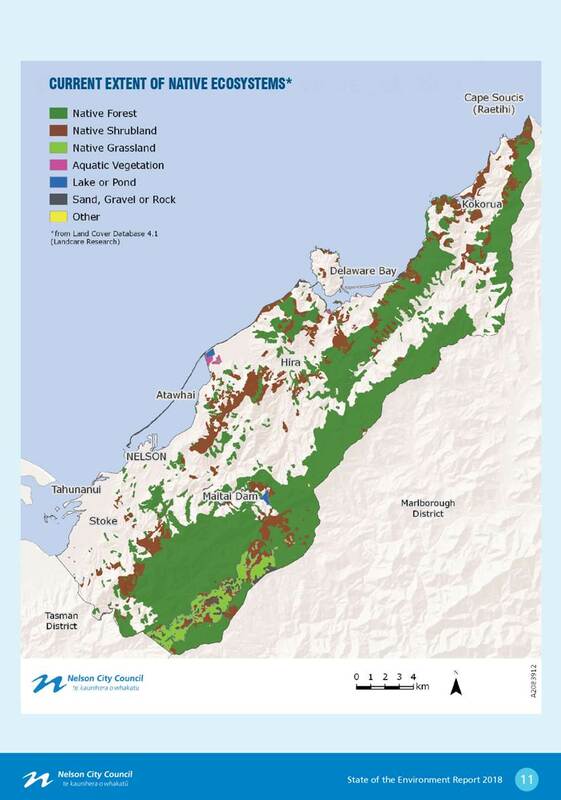 The decision supports the community outcome: ‘our unique natural environment is healthy and protected’ by ensuring appropriate monitoring and reporting is in place to highlight the state and pressures on the environment and to document what we are doing about it. 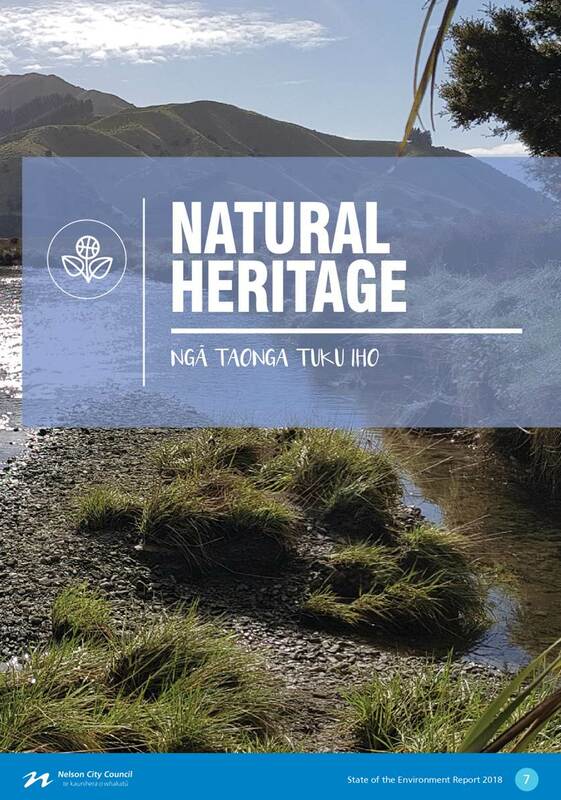 The report seeks to highlight the state, trends and emerging environmental issues so that the public is more informed and engaged with Council programmes, reducing the risk of public misunderstanding from lack of information and understanding. 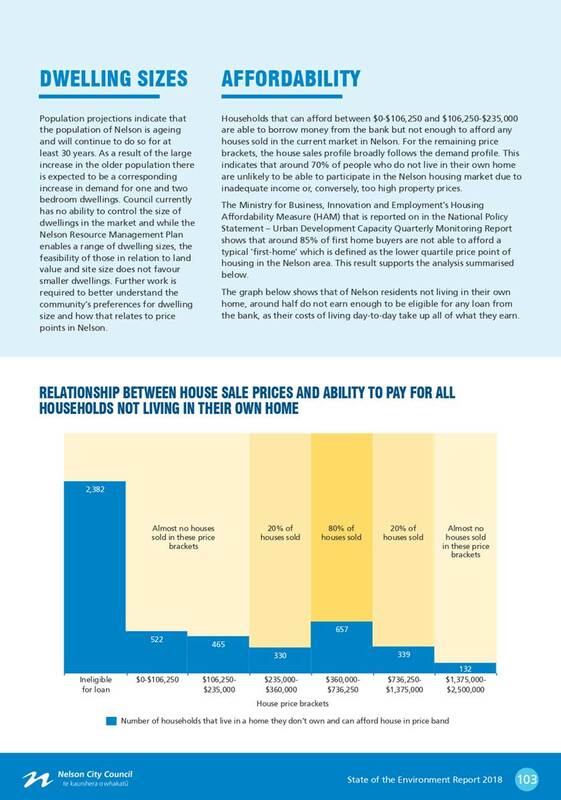 There is no financial impact. 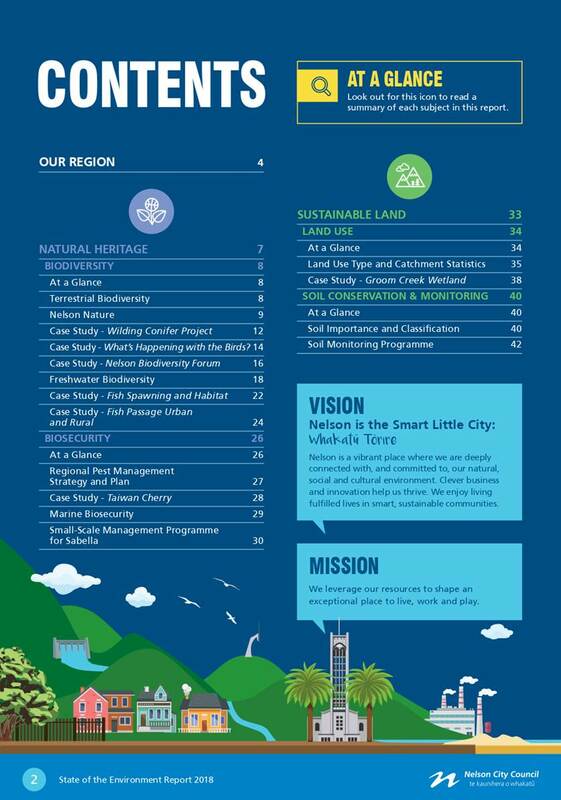 The costs of producing the report are budgeted. 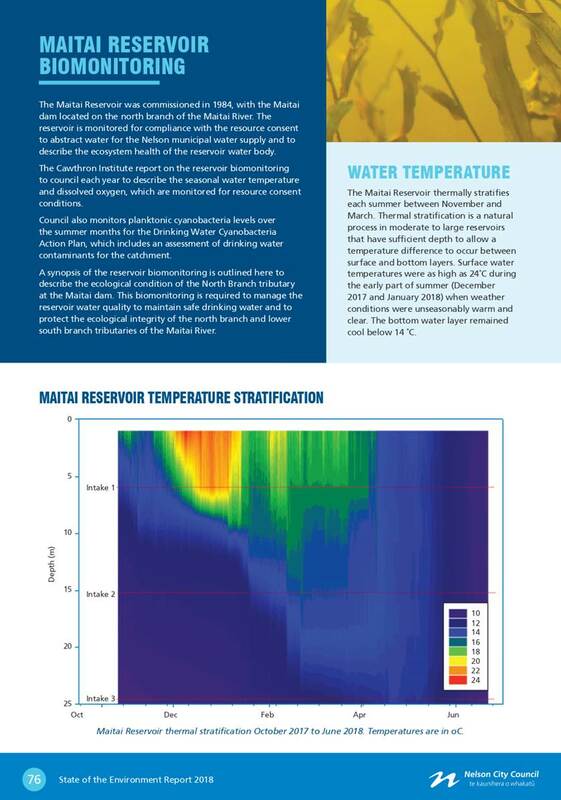 This matter is of low significance but will be of interest to the community. 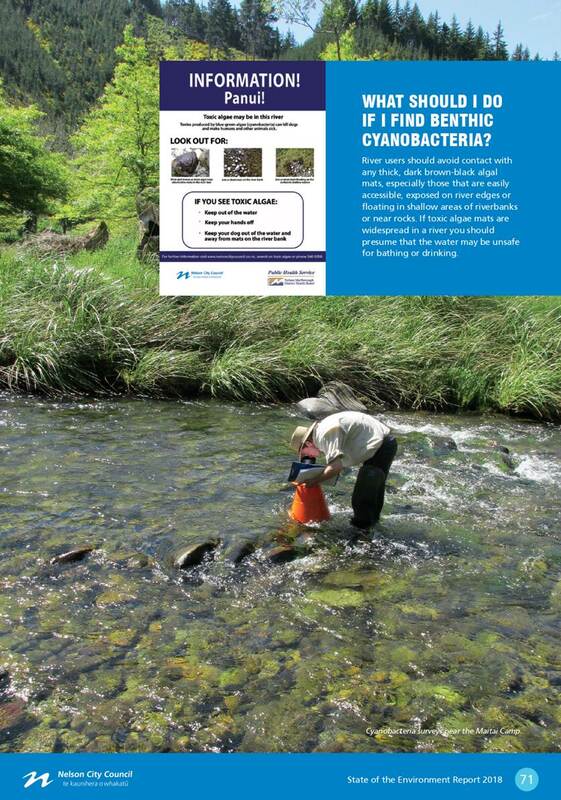 There is a requirement to report State of the Environment information. 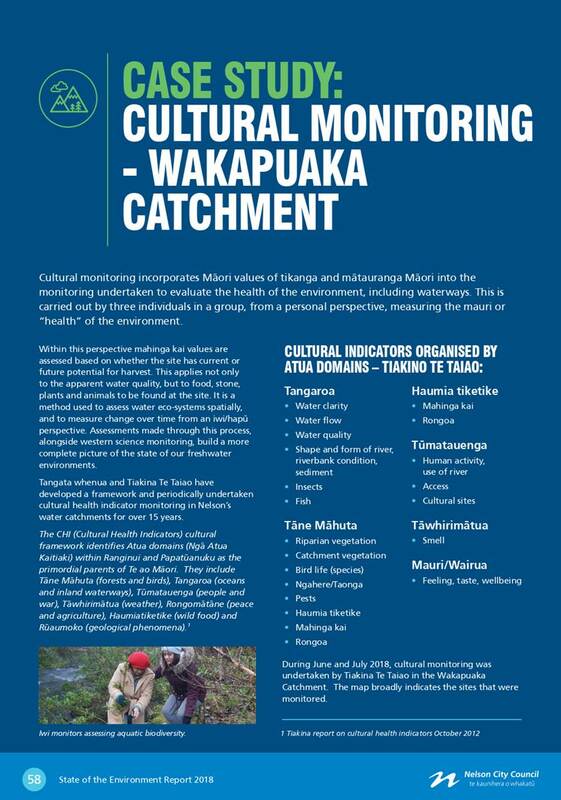 Māori have been engaged with and have contributed regarding cultural monitoring. 1.1 To consider amending the Parking Policy to enable the issuing of parking permits to jurors that override time restrictions for parking while carrying out jury service at the Nelson Courthouse. 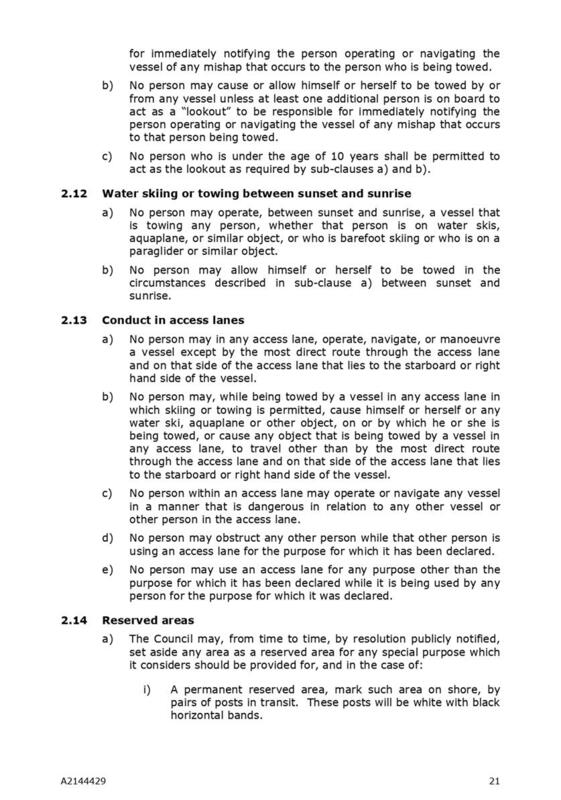 b) safety implications for the jurors if they have to walk some distance to their vehicle, particularly in the evening. 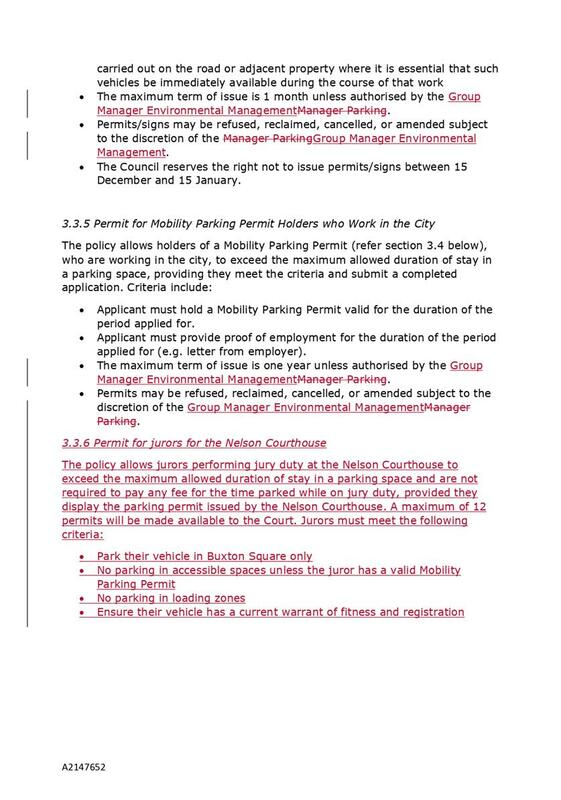 2.2 The Parking Policy would need to be amended to enable Council to issue parking permits for jurors. 4.2 Part 3.3 of the Policy provides for reserved parking to those users who are not covered by other parking schemes in the Policy. Users have to demonstrate private benefits outweigh the cost to the public of having these parking spaces reserved. · Mobility card holders who work in the City. 5.1 In general, public parking is for the use of the public. 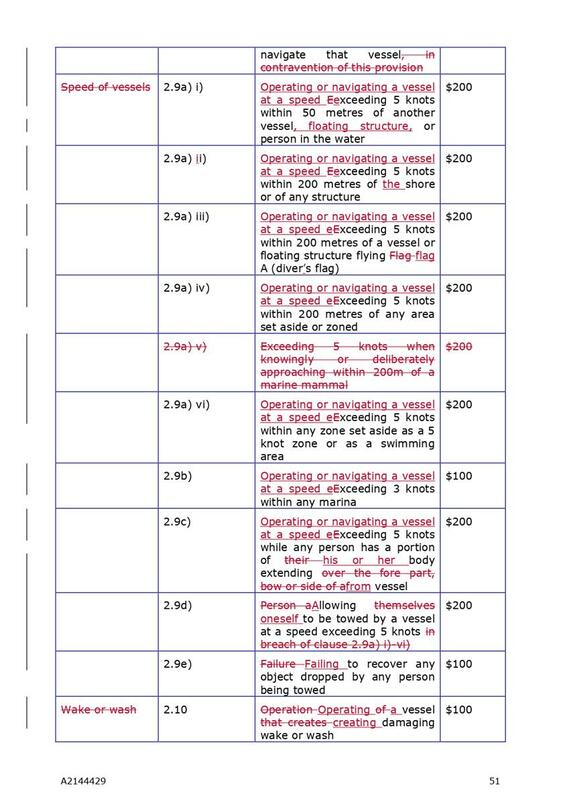 Parking restrictions such as time limits and metered spaces (paid parking) are used to ensure everyone has a fair opportunity to use the limited parking resource. 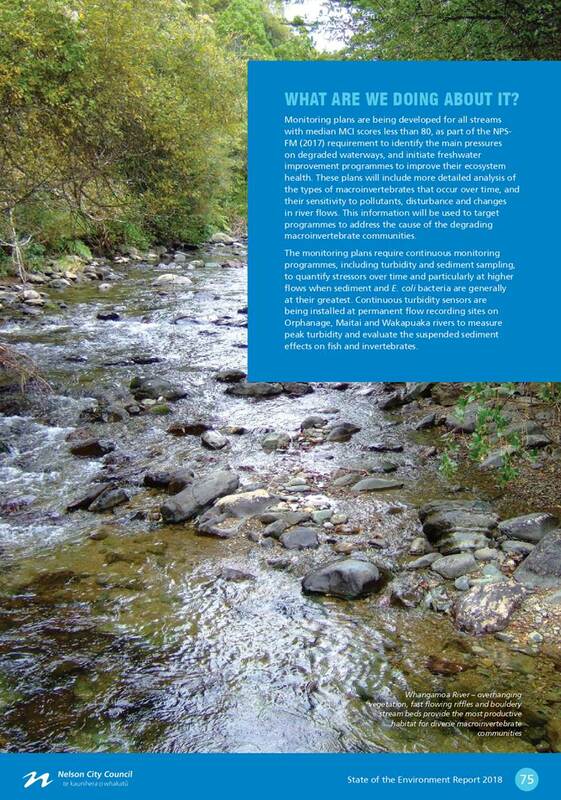 5.2 Any variations from the above principle can benefit a specific user at a cost to the general public. For example if permits are issued enabling a user to park without having to comply with the restrictions, these spaces are unlikely to have the same turnover and as a result the public are less likely to be able to find a park in the area. This can potentially have negative impacts on businesses in the area that rely on the turnover of parking spaces. 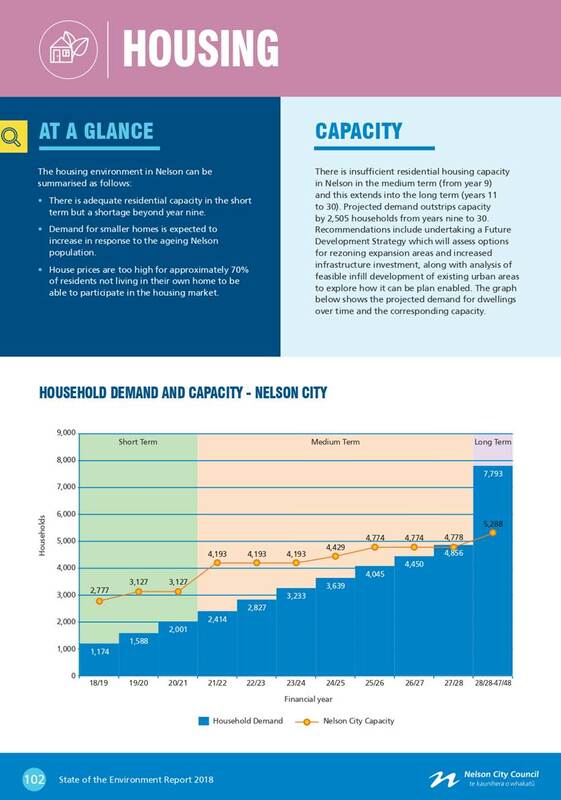 5.3 There are exceptions to this as outlined in part 3.3 of the Parking Policy for reserved parking where specific users have demonstrated a need which has private benefits to a specific type of user which outweighs the cost to the public. Council has been asked to extend the exceptions to include jurors. 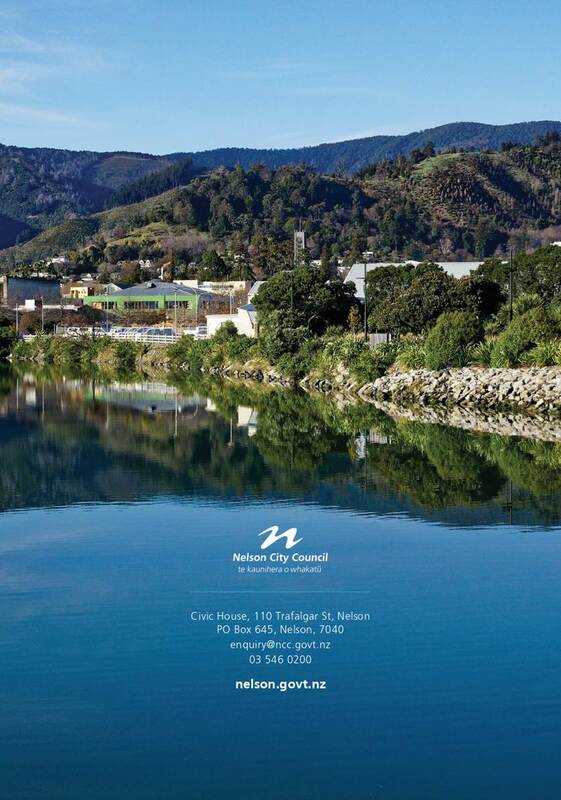 5.4 The Nelson Courthouse has requested Council issue it with 12 permits for use by jurors when attending jury service at the Nelson Courthouse. This would exempt the permit holders from complying with the normal parking restrictions while attending jury service. 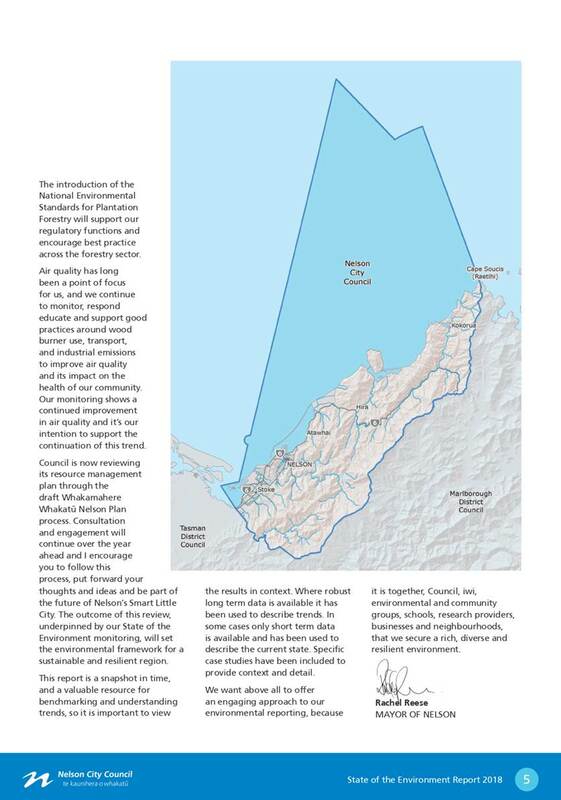 5.5 The Court has suggested that it could manage the issuing and retrieval of the permits from jurors so there would be minimal Council staff input required. 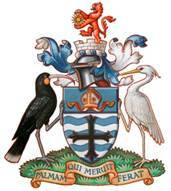 5.6 Undertaking jury service is a compulsory service for members of the community. It is often considered a significant inconvenience as people take time away from their normal lives to undertake this civic duty. 5.7 Currently there is no special provision for jurors parking within the city and the Ministry of Justice does not provide on-site parking for jurors. This means that if jurors choose to park in town they legally must comply with the normal parking restrictions, or park further away in unrestricted parking. 5.8 It has been raised as a potential security concern by the Court that jurors coming to or leaving the Court and walking some distance could be approached by associates of the accused or others. The time when jurors are required at Court varies and can extend into the evening. 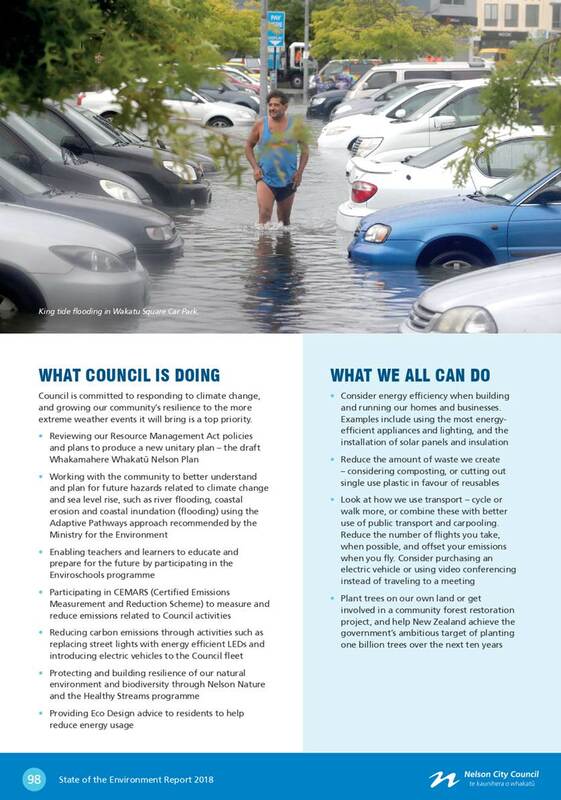 · There are 32 parks on the northern side of Bridge St between Collingwood St and the bridge allowing parking up to one hour. The northern end of Tasman Street is free although it has a high occupancy rate as it is some of the closest free parking to the City. 5.10 Car parking off street surrounding the Courthouse is restricted to government centre staff and visitors. There are 44 parks in the car park between the Courthouse and the Suter and these are normally fully occupied by 8am. 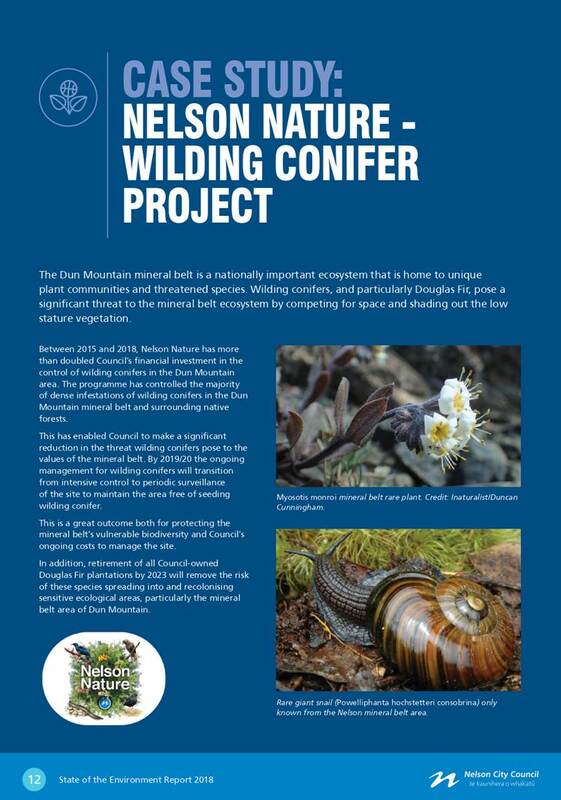 Between the Courthouse and the Munro Building (Department of Conservation) there are three spaces that are not time restricted or reserved for the Police, Department of Conservation or Worksafe New Zealand vehicles. 5.11 Harley St (between Bridge and St John Streets) has car pool parking, one space for up to 10 minutes and eight spaces for up to two hours metered parking. 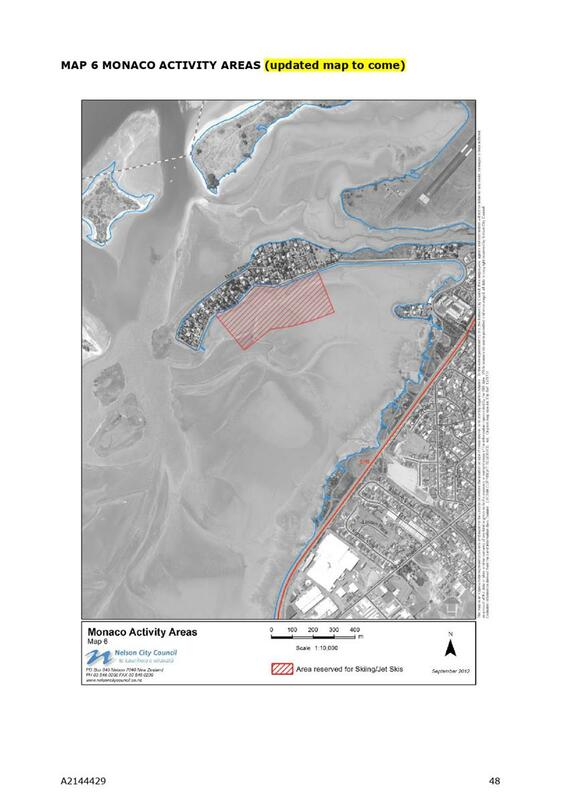 5.12 It is likely that if juror permits were issued and the parking spaces on Bridge Street are occupied all day near the Courthouse this will have a negative impact on the ability for other members of the public to find parks in the area when visiting the Suter or the gardens for example. The Suter has commented that if 12 parking spaces were occupied all day in the vicinity of the Suter this would have a significant impact on its customers. 5.13 The Suter states that it already receives comments from people finding it hard to get a park as the theatre can accommodate up to 150 people and the café can seat up to 80. It has school groups visiting and occasionally buses with passengers from the cruise ships. 5.14 Most other businesses in this section of Bridge Street have off street parking for their staff and clients. 5.15 Parking Officers report that the streets around the Courthouse are usually full by 8am or soon after. They suggest that Buxton Square is the closest option to the Courthouse that could accommodate 12 parking permit vehicles for most times of the year. In summer the parking square is often full by 10am so parks would not be able to be guaranteed then. Parking Officers also recommend that the parking permits exempt jurors’ vehicles from the time restriction and fees only. Vehicles will still need to be warranted and registered and not parking in a loading zone or accessible parking space. 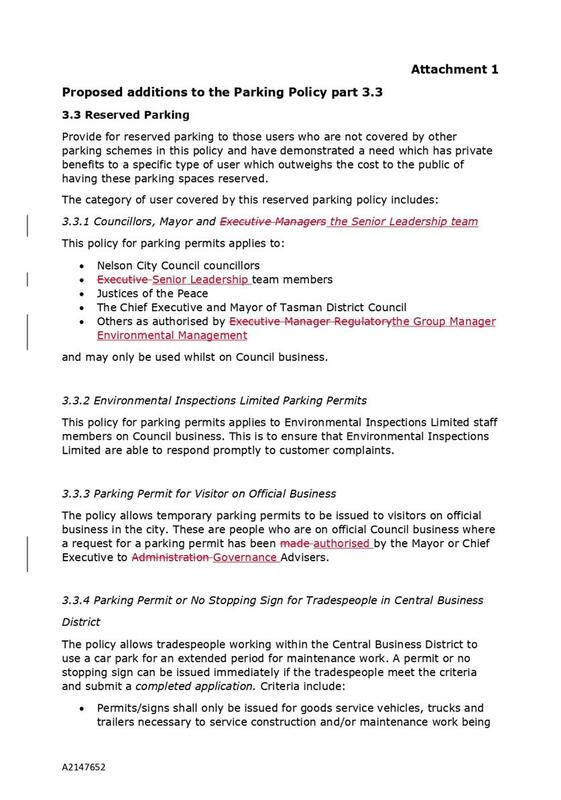 5.16 Part 3.3 of the Parking Policy includes criteria for the issuing of parking permits. 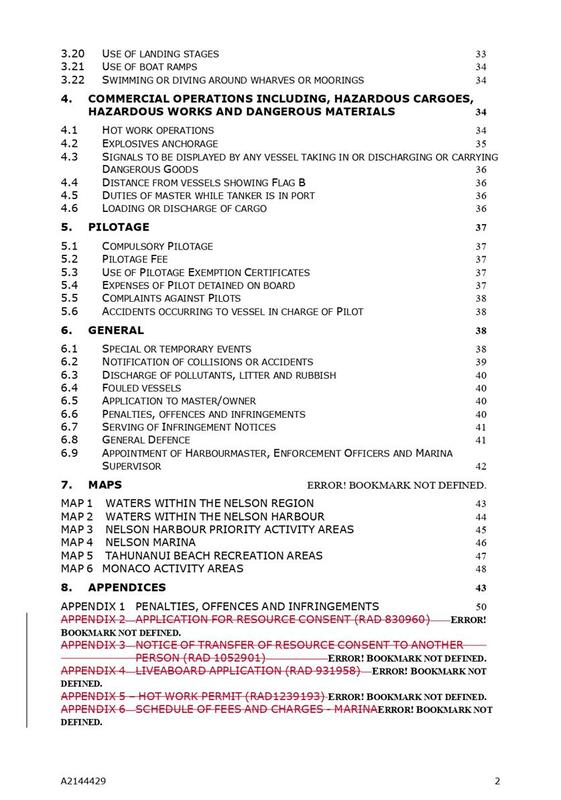 It is recommended that should parking permits for jurors be issued, there will need to be restrictions or criteria to mitigate impacts on their use as identified in paragraph 5.15 above. 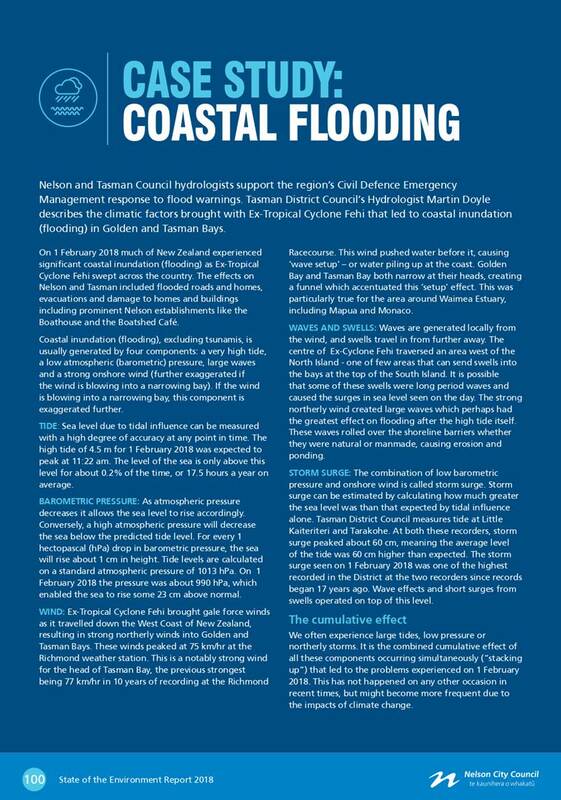 It is recommended that the Chief Executive be given authorisation to amend the criteria as needed. Any amendments will be to ensure the impacts of the parking permits on the limited parking resource remains low. 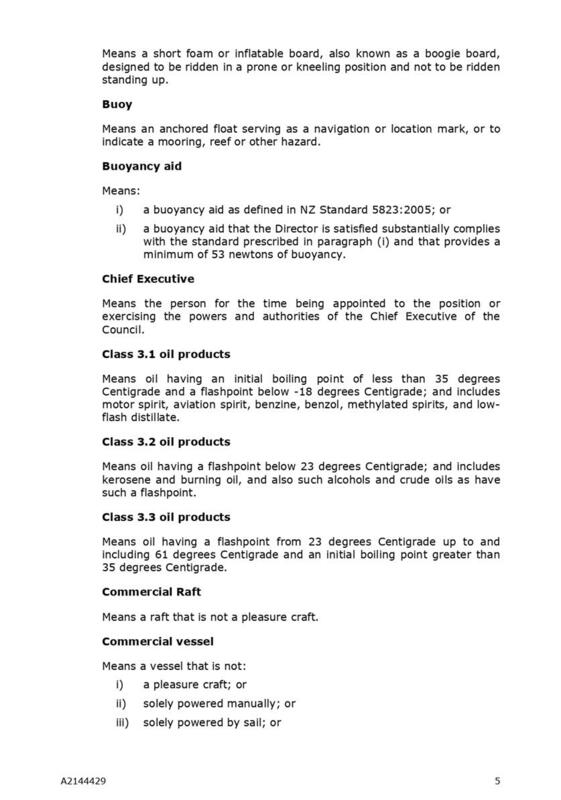 Criteria in Part 3.3 are detailed in Attachment 1. 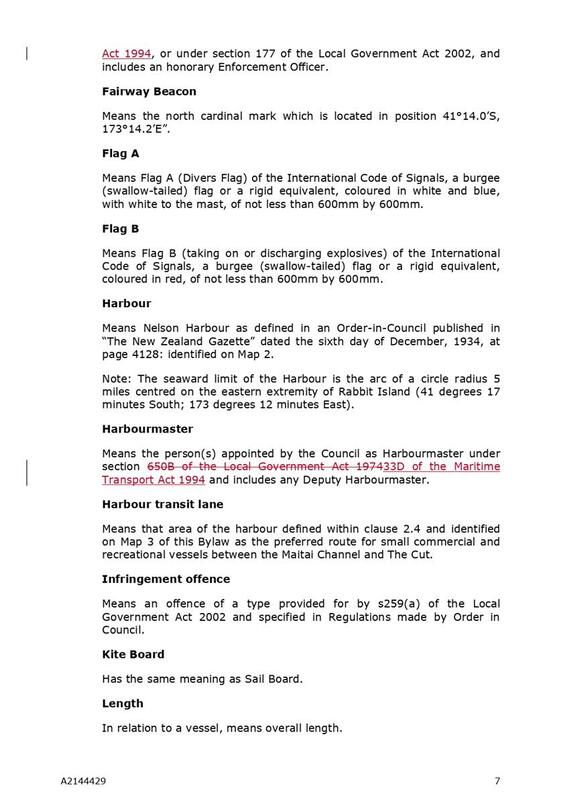 5.17 References to Council officer positions are out of date in the Parking Policy and these are proposed to be amended at the same time as the changes identified above. Tracked changes in Attachment 1 outline these position updates. 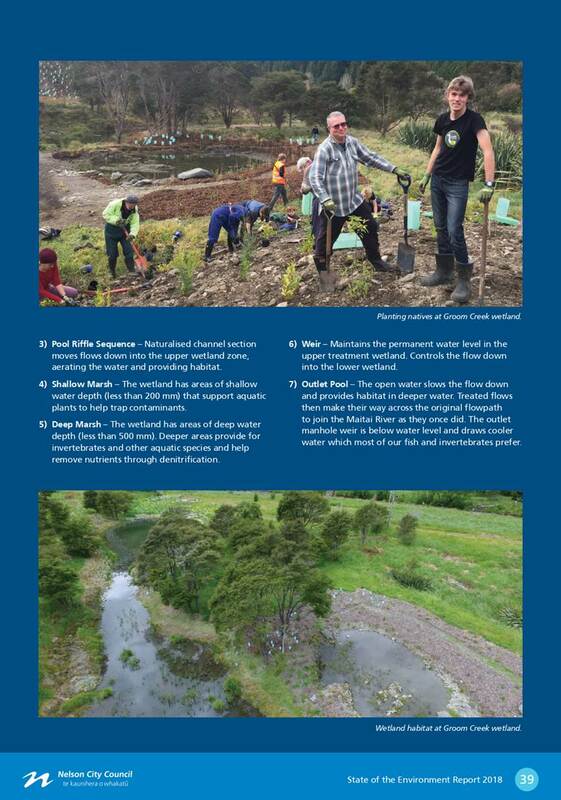 6.1 The preferred option is option 2. 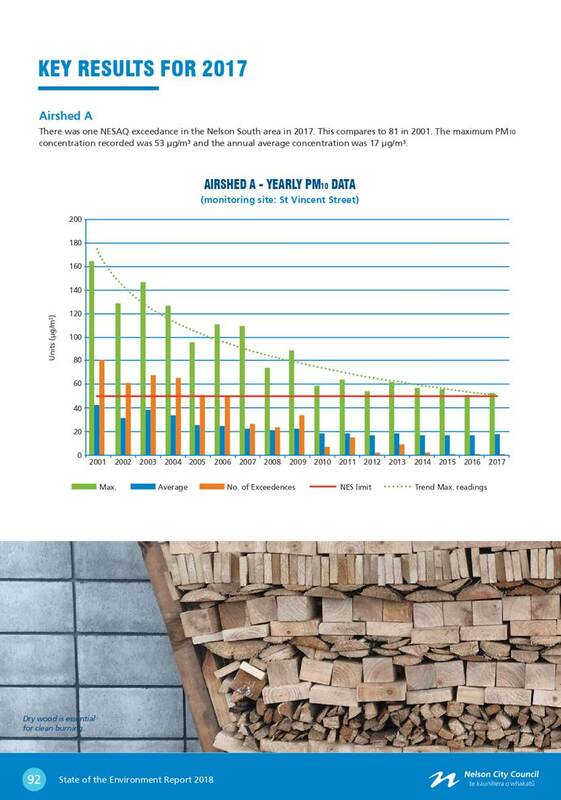 · Lower turnover of parking spaces in Buxton Square meaning more difficulty for the public to find unoccupied parks in that area. 7.1 The time restricted parking near the Courthouse causes a safety issue for jurors as they have to park some distance from the Courthouse. 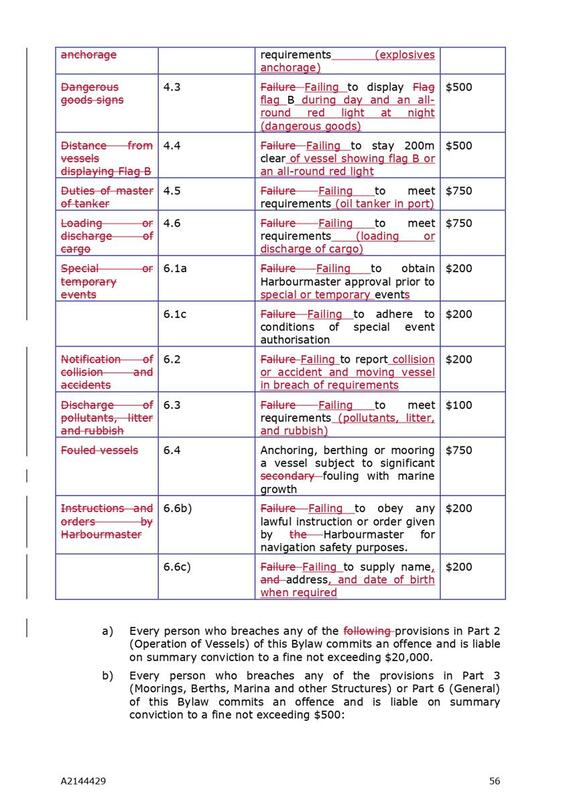 7.2 It is considered reasonable that the Parking Policy be amended to enable the issuing of parking permits (subject to criteria), for people carrying out jury duty so they are not restrained by time limits or costs. The recommendation in the report enables jurors to park closer to the Courthouse without receiving parking enforcement penalties while only having minor impacts on the performance of the parking regulatory function overall. 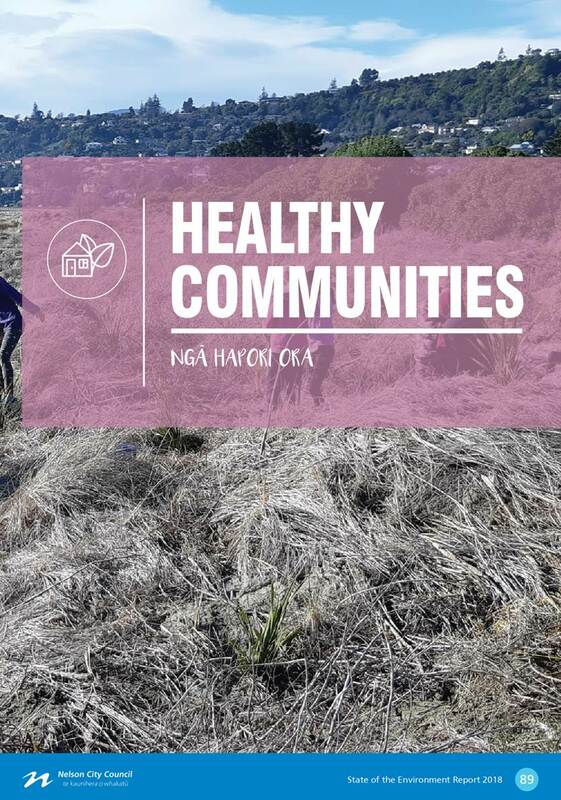 The recommendation will contribute to achieving community outcomes of having people friendly urban environments, supports communities to be healthy, safe and resilient and fosters partnerships. There is a minor risk the uptake of parking permits by jurors can lead to reduced availability of the parking resource but the restrictions can be reviewed and adjusted to minimise the impact. 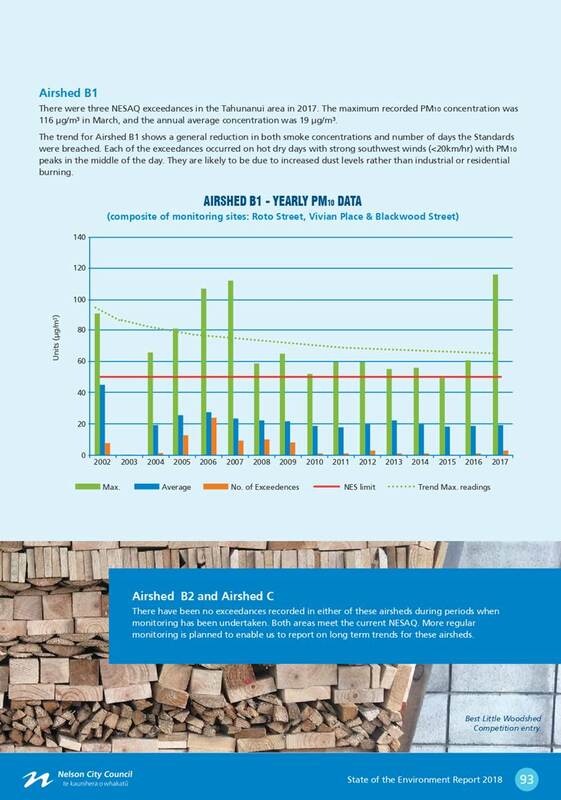 The use of parking permits reduces the income from metered time restricted spaces but this is not expected to impact on the parking income by more than a minor amount. The administration of the permits will have minimal staff time cost component. This matter is of low significance because with the restrictions imposed the negative impacts are not likely to be more than minor and there will be positive response from jurors. Council officers have liaised with the Suter staff as other businesses in the area provide their own parking or attract fewer visitors. 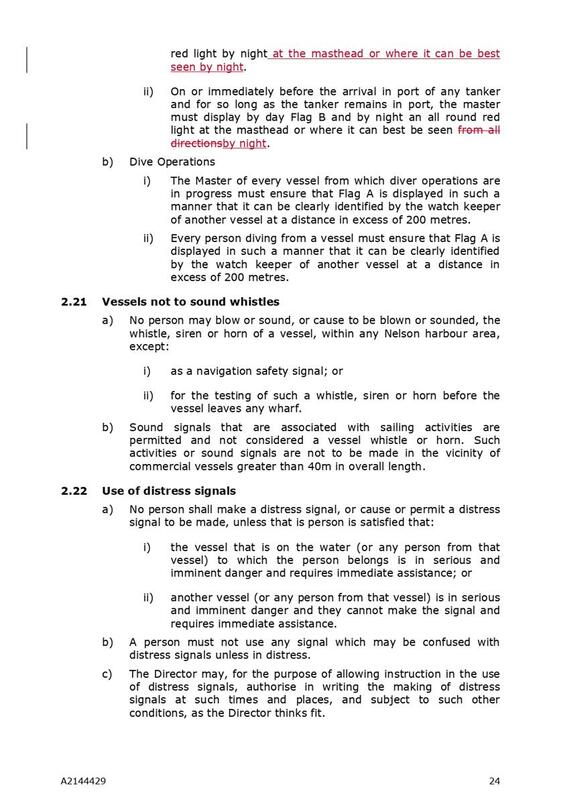 1.1 Following a review of the Navigation Safety Bylaw 2012 (No. 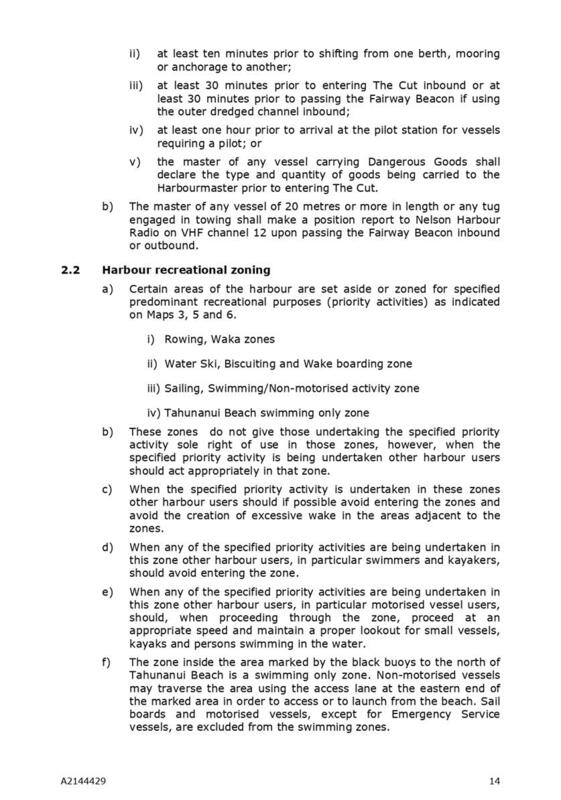 218), (the Bylaw), the report recommends that it be amended and a Special Consultative Procedure (SCP) commences for the proposed amendments. 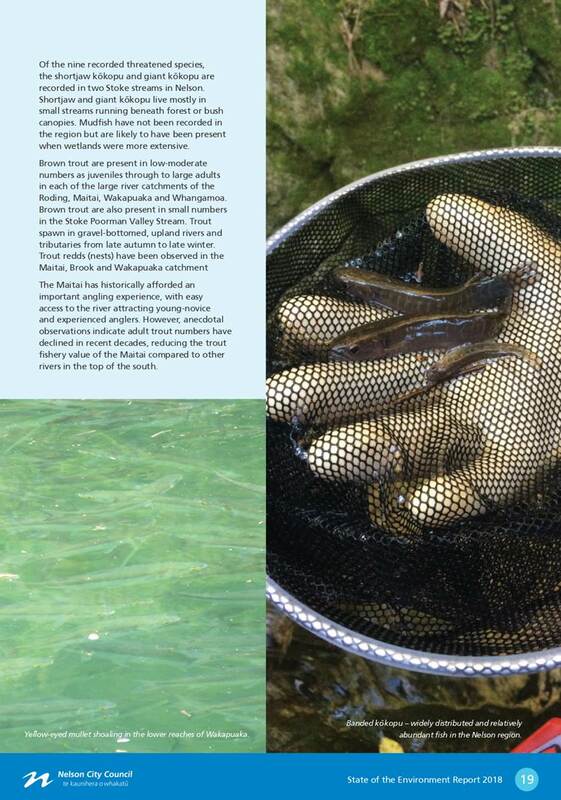 c) reduce conflicts between different activities. 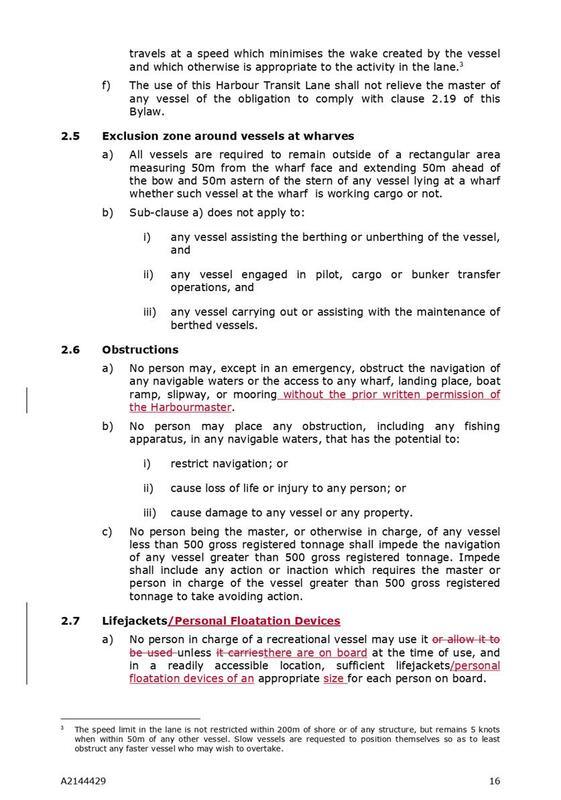 2.2 Key recommended changes include a requirement to wear lifejackets in vessels six metres or less in length and for recreational vessels to be registered. 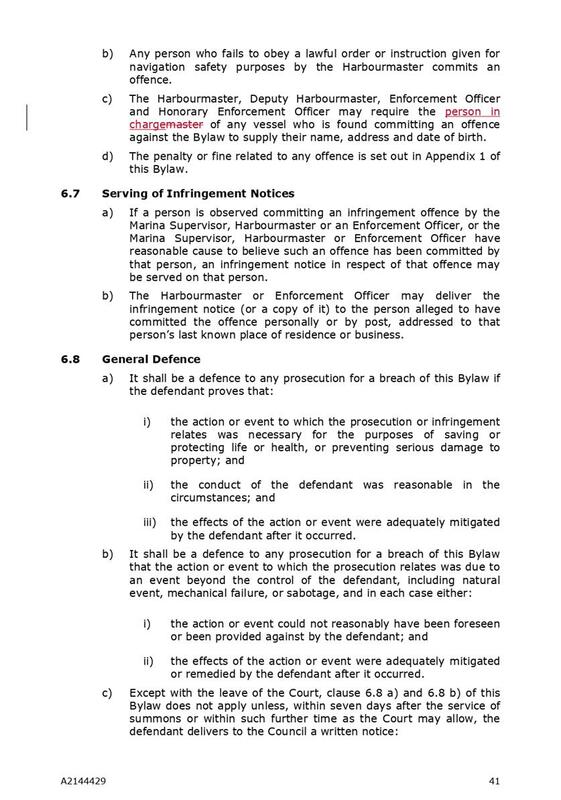 4.1 The Local Government Act 2002 (LGA) requires that bylaws are reviewed five years from the date on which the bylaw was made. 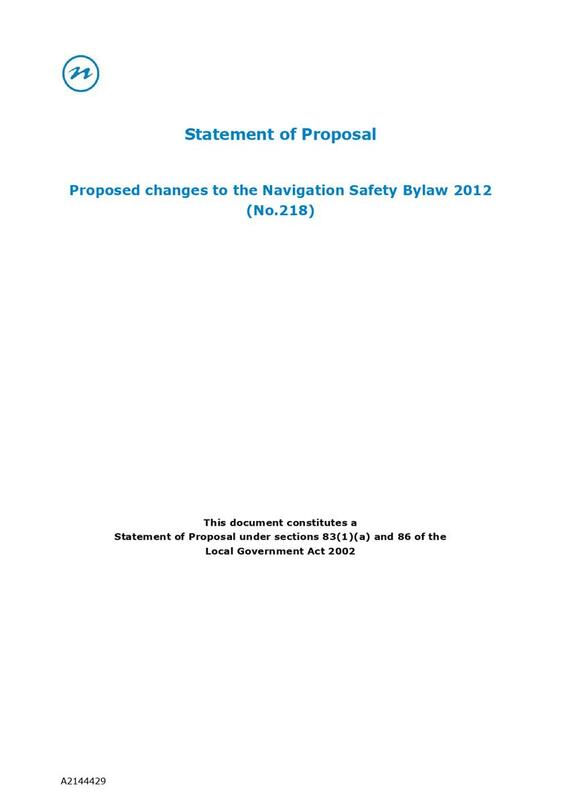 The Navigation Safety Bylaw was due for review by 1 December 2017, but can remain in force provided that a review is completed by 1 December 2019. 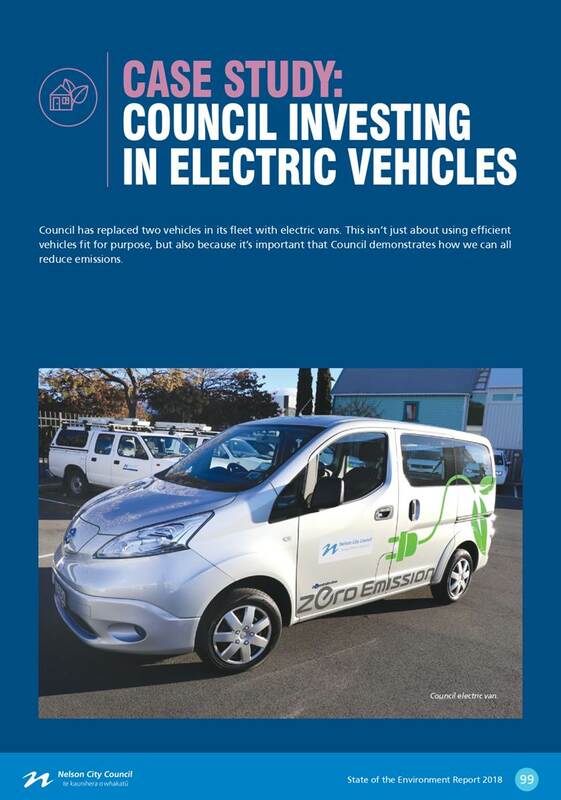 On 25 May 2017 the Planning and Regulatory Committee approved completion of the review by 1 December 2019. 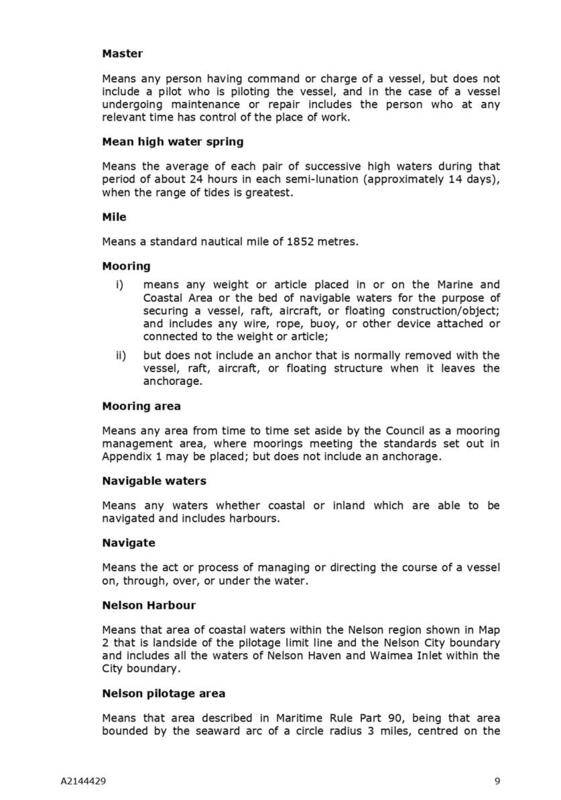 4.2 Council must complete a review by making the determinations required by section 155 LGA. 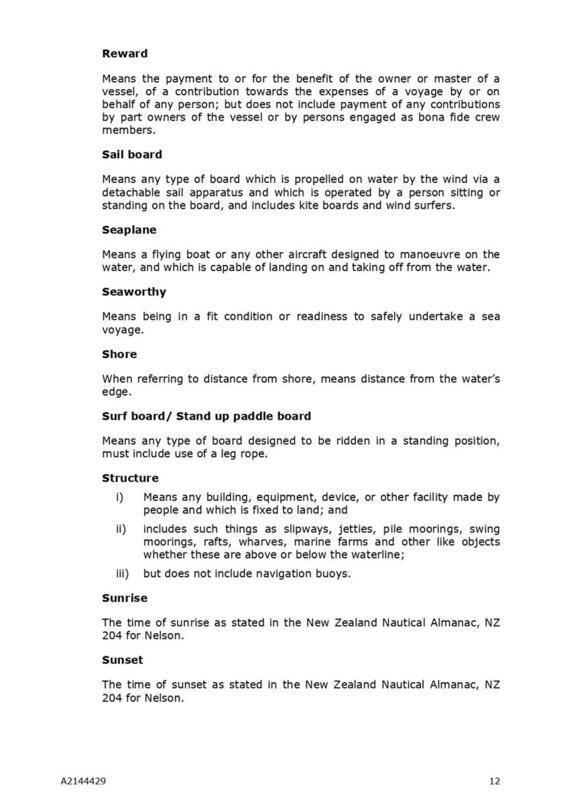 Section 155 of the LGA requires Council to determine whether amendment, revocation or replacement of the bylaw is the most appropriate way to address any perceived problems arising from the review and, if so, whether the proposed changes are the most appropriate form of the bylaw and gives rise to any implications under the New Zealand Bill of Rights Act 1990 (NZBORA). 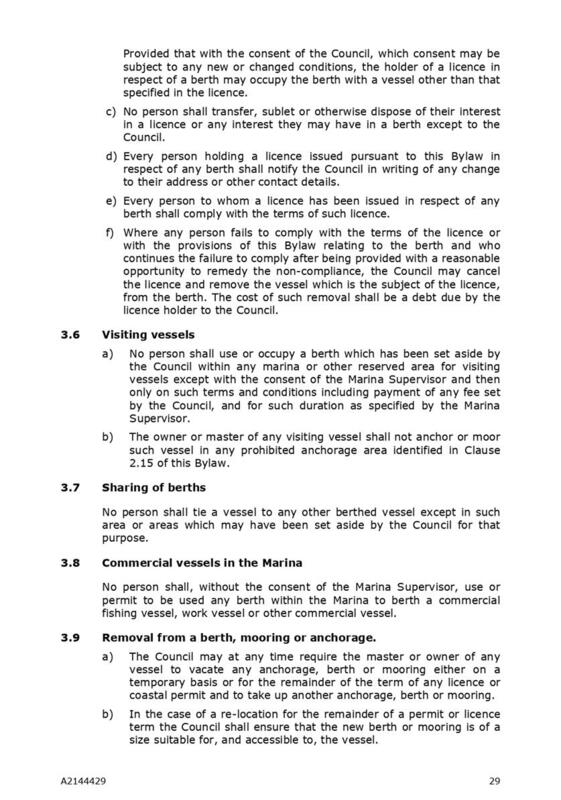 4.3 Section 156 of the LGA requires Council to use the SCP before making a decision to amend a bylaw if the local authority considers there is, or is likely to be, a significant impact on the public from the proposed bylaw changes. 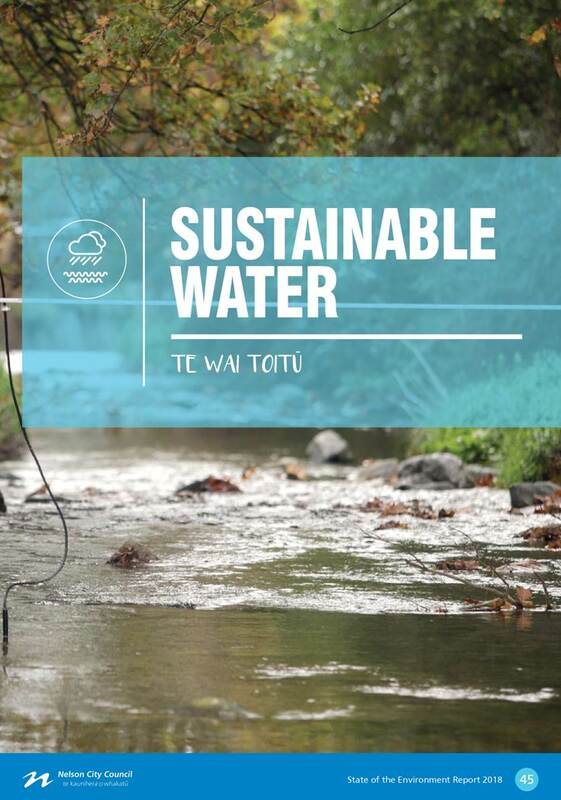 · consider whether a summary of the Statement of Proposal is necessary to enable public understanding of the proposal. 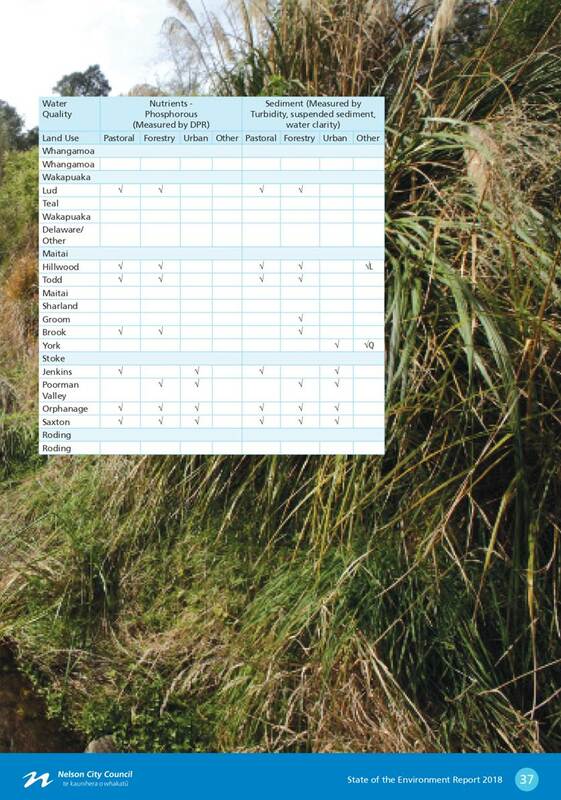 · A report on any relevant determinations by Council under section 155 LGA. 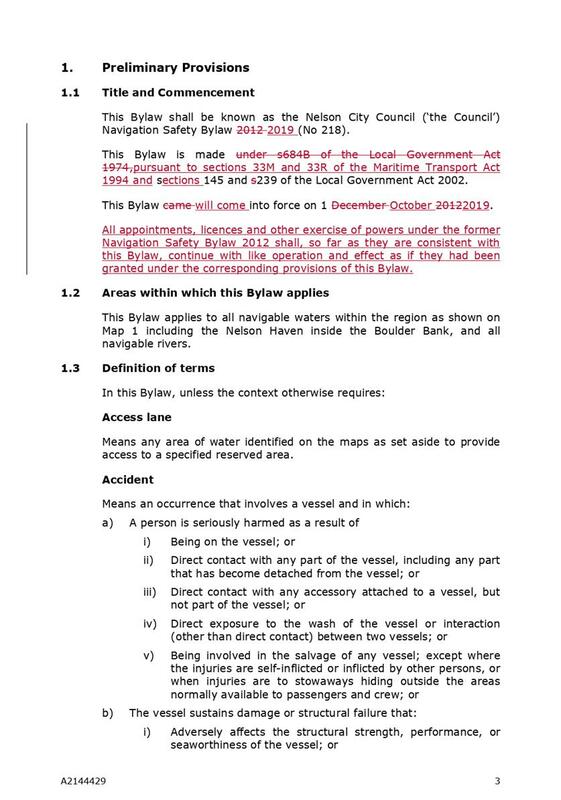 4.6 Since Council’s Navigation Safety Bylaw came into effect on 1 December 2012 the most relevant Maritime rules, (Part 91 Navigation Safety Rules made under the Maritime Transport Act 1994), have been amended three times. 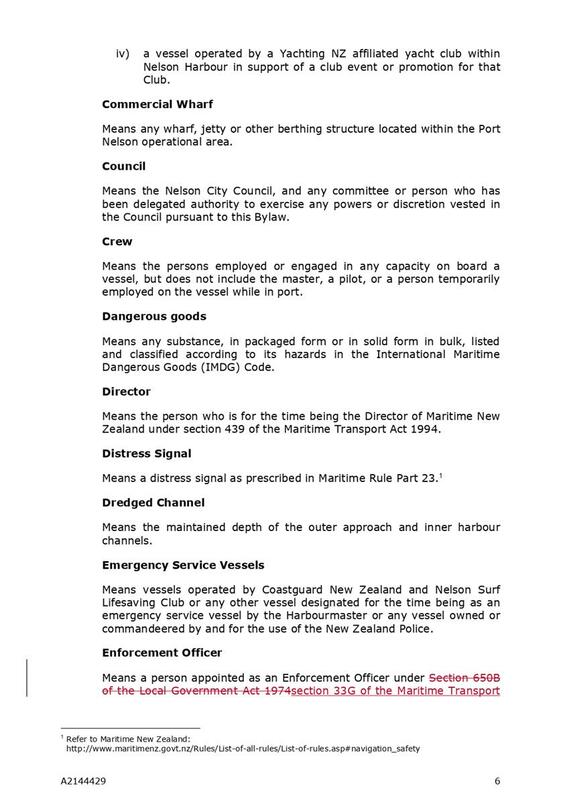 Maritime New Zealand safety campaigns have more recently joined forces with Harbourmaster activities to educate and enforce consistent safety messaging. 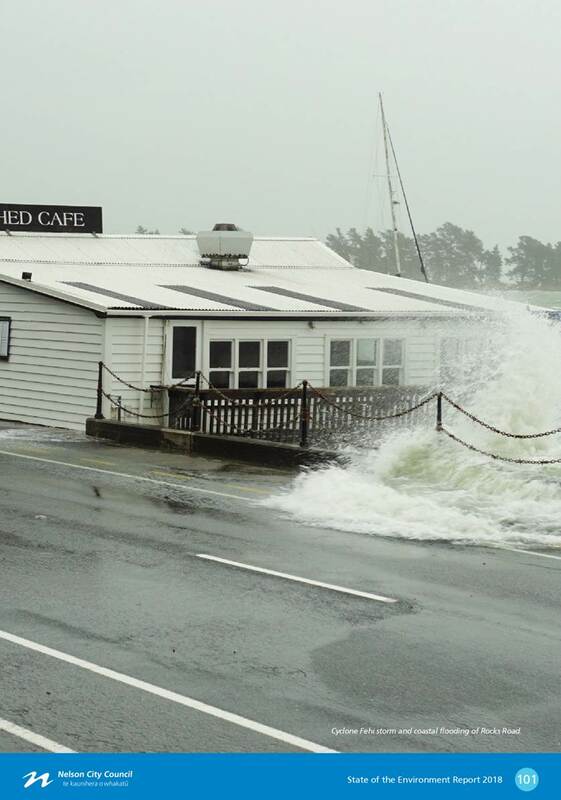 Nelson has one of the highest tidal ranges in the country and a narrow cut through the Boulder Bank. 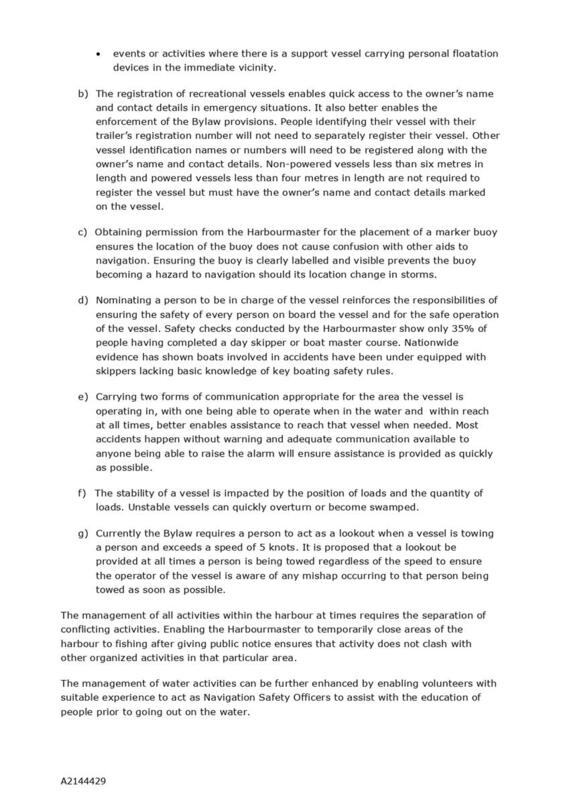 A high level of navigation safety measures are required to mitigate risks to vessels and people’s health and safety in these conditions. 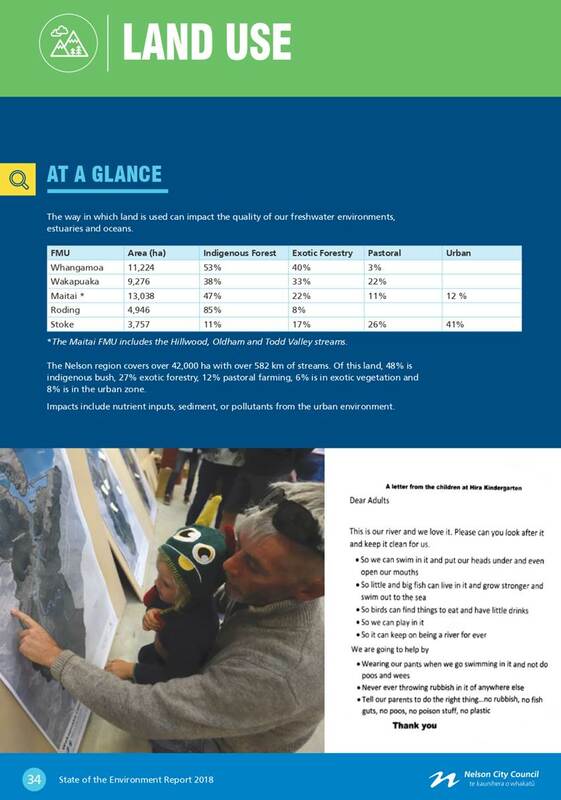 5.1 Prior to the writing of this report recreational water sport clubs and organisations were contacted asking for their views on whether the Bylaw needs changing. No comments were received. 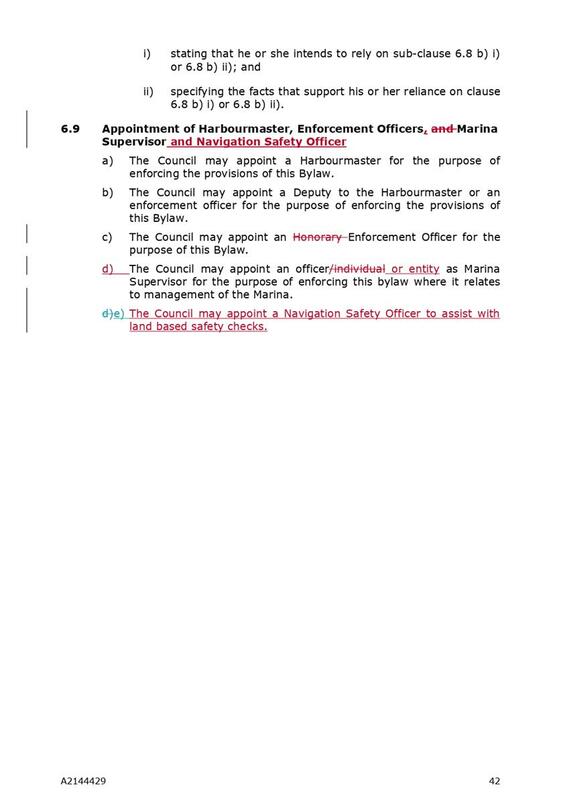 5.2 Council officers have undertaken a review of the Bylaw with the Harbourmaster and Deputy Harbourmaster. 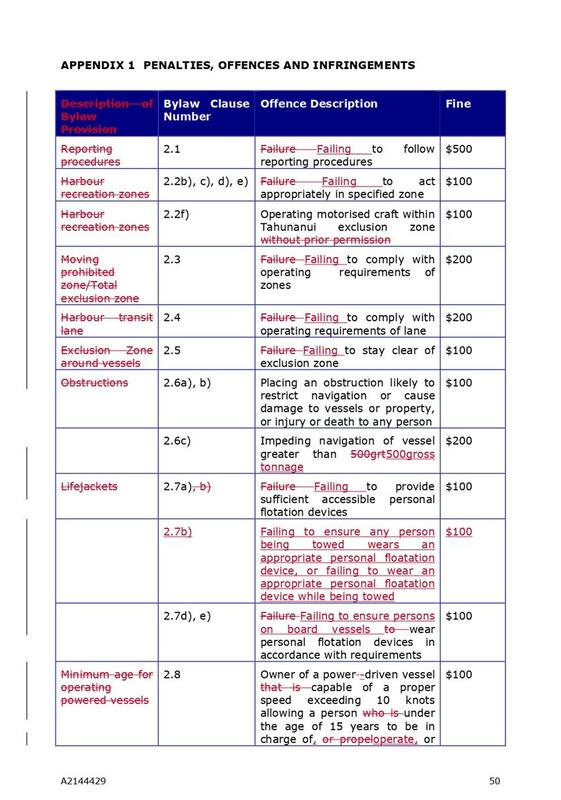 The review has identified some bylaw clauses are inconsistent with national safety campaigns and some terms are inconsistent with national regulation. 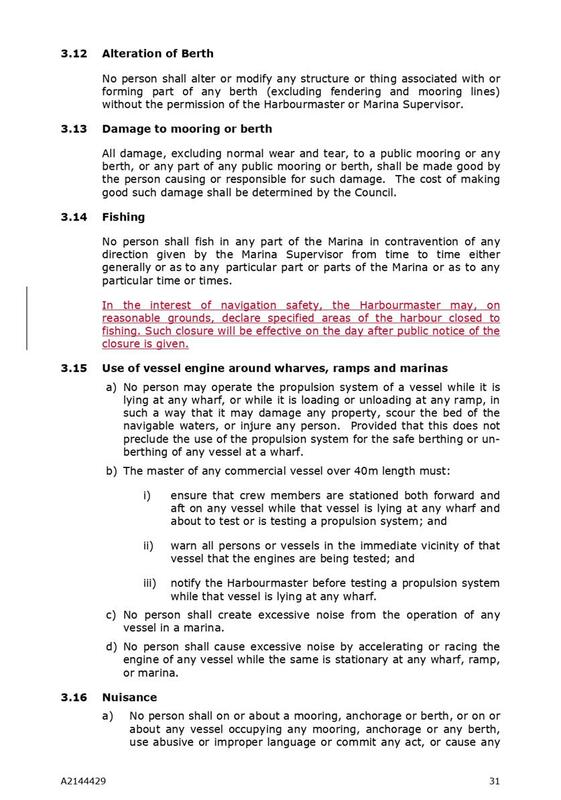 Officers consider that amendment of the Bylaw is the most appropriate way to address these problems. 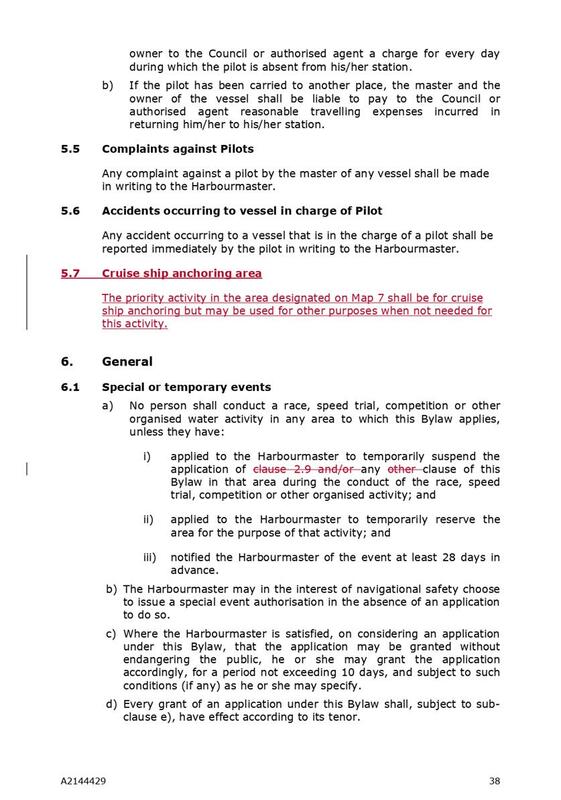 5.3 The Bylaw incorporates marina management activities that are not found in other Council Navigation Safety Bylaws particularly when their marina is operated by a separate commercial company or a Council Controlled Organisation. 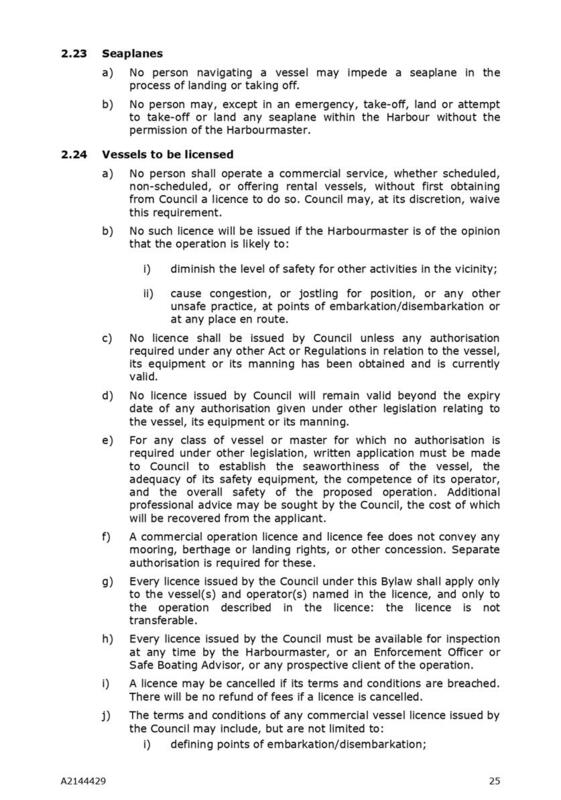 However a full review of the Bylaw to address these clauses would be premature before a review of the Nelson marina operation and licensing is carried out. 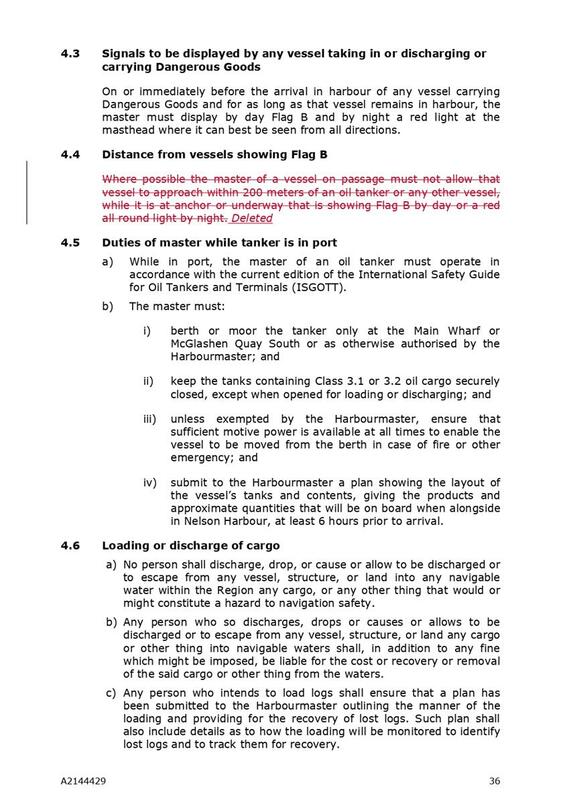 Proposed changes to the Bylaw as an outcome of this review are therefore limited to making clauses more consistent with national statutes and addressing potential safety problems identified by the Harbourmaster. 5.4 The specific amendments proposed to address the problems identified in the review are addressed in more detail below. 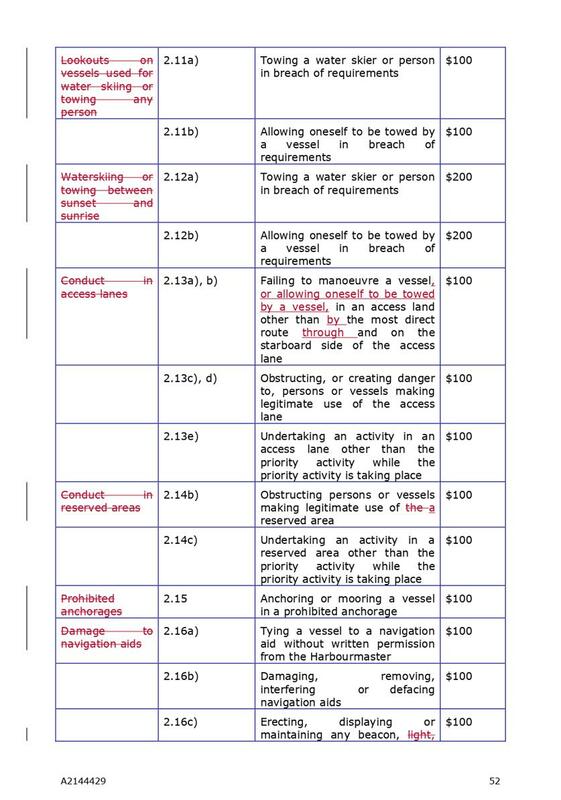 Officers consider that these proposed changes are the most appropriate form of bylaw. 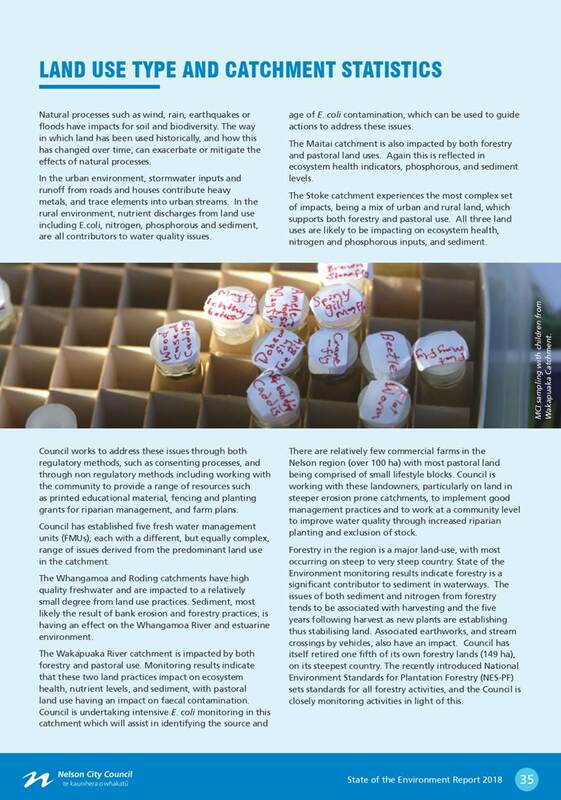 5.5 Council officers have considered whether the proposed changes give rise to any implications under the NZBORA. 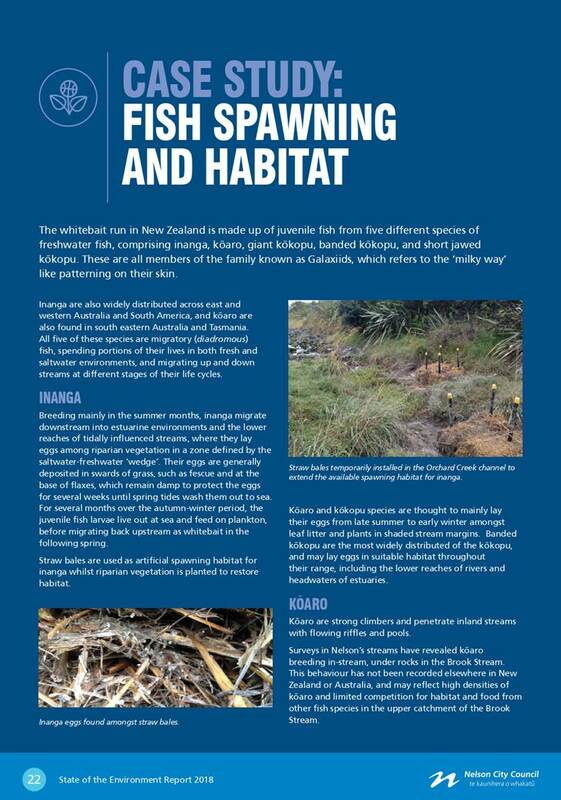 A bylaw is considered an appropriate way of managing a range of water based activities to minimise harm to people and property. 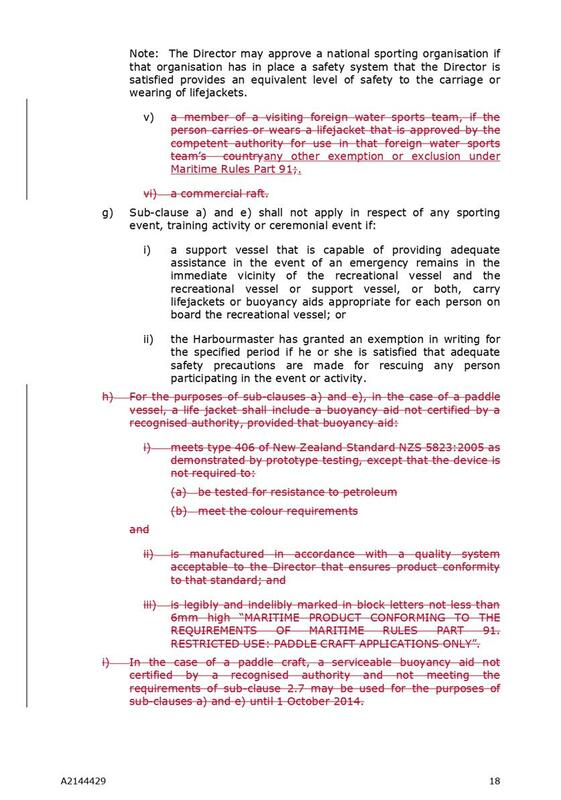 The Navigation Safety Bylaw seeks to protect life (that is consistent with section 8 of the NZBORA) and enable the safe movement of vessels. 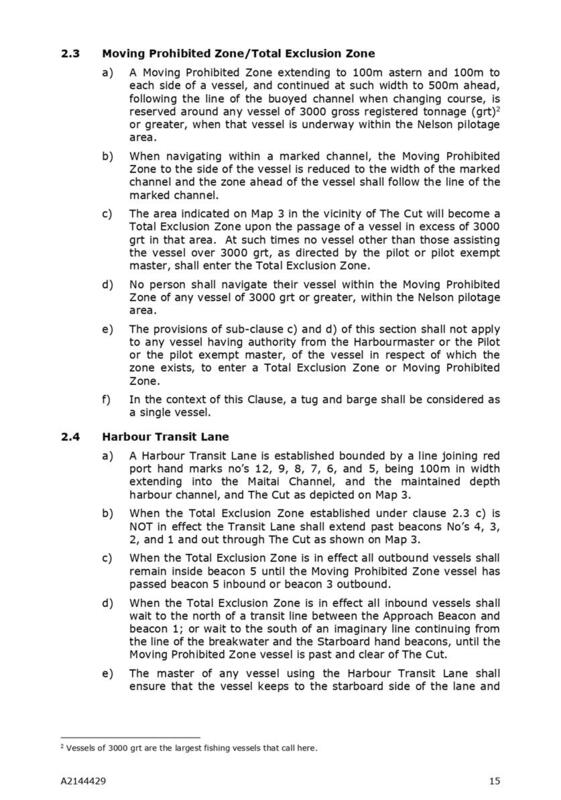 The Bylaw controls the speed and priority of movements in areas where potential conflict and harm can occur (such as transiting through the Cut). 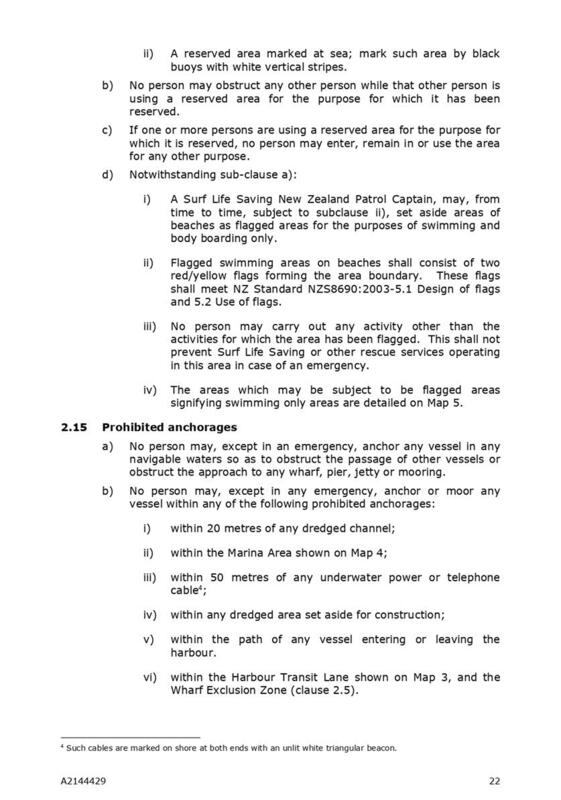 While this could be considered a restriction of freedom of movement under section 18 of the NZBORA, the limitations are designed to restrict people’s movement and behaviour as little as is reasonably required to protect life and property. 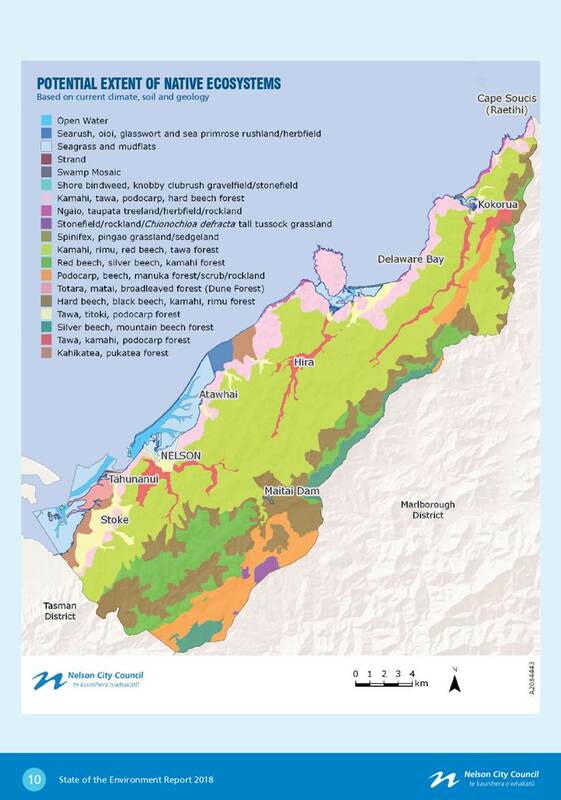 The proposed limitations are therefore considered reasonable and justified under the NZBORA. 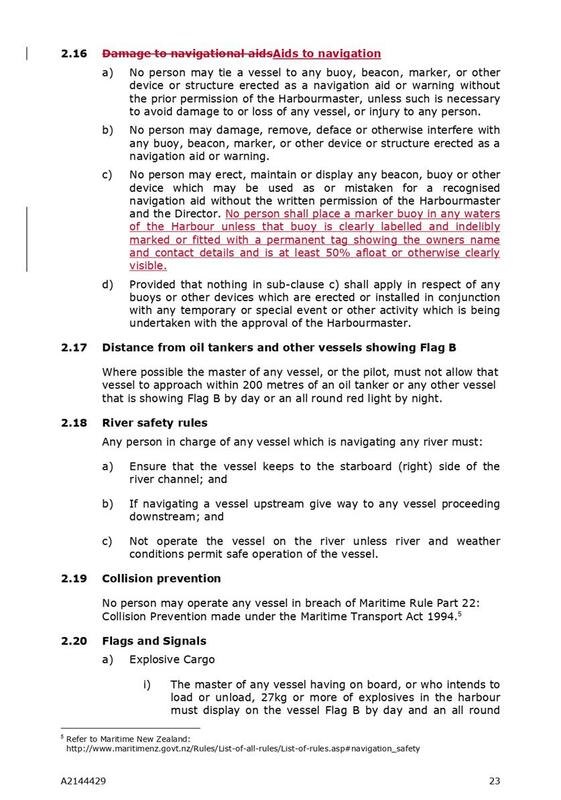 Amend from the person in charge of a vessel less than six metres in length to ensure each person shall wear a lifejacket unless the person in charge permits people to not wear them to require all persons to wear lifejackets in vessels six metres or less in length (with some exemptions). 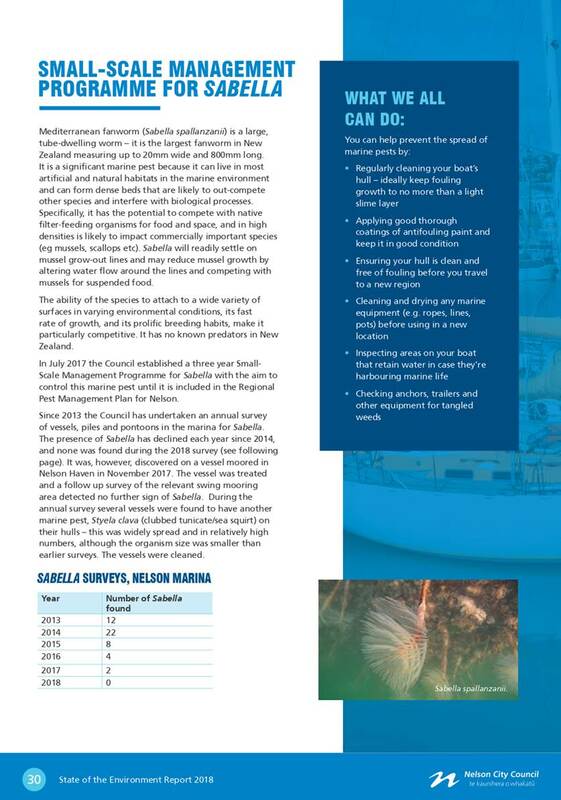 Safety - checks conducted by the Harbourmaster revealed only about a third of skippers have completed a day skipper or boat masters course. 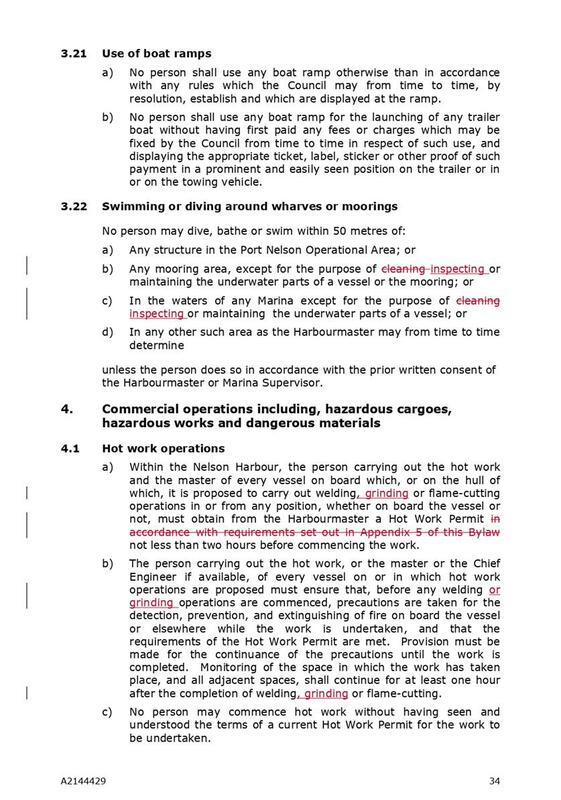 The current Bylaw provisions mean passengers rely on the judgement of skippers to decide when to wear a lifejacket. 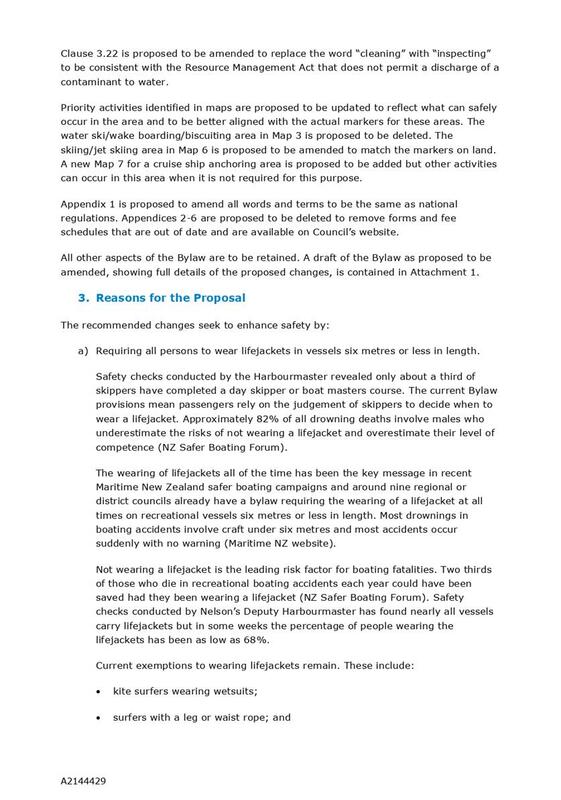 Approximately 82 % of all drowning deaths involve males who underestimate the risks of not wearing a lifejacket and overestimate their level of competence (NZ Safer Boating Forum). 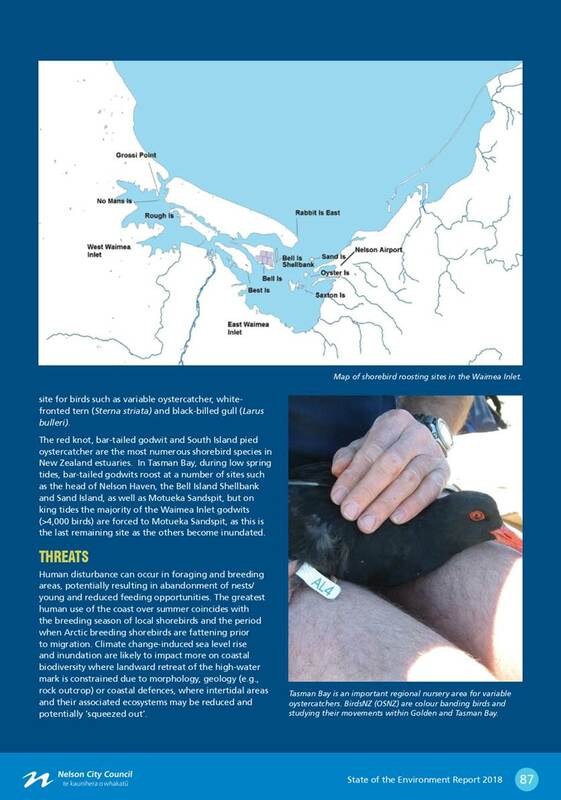 The wearing of lifejackets all of the time has been the key message in recent Maritime New Zealand safer boating campaigns. 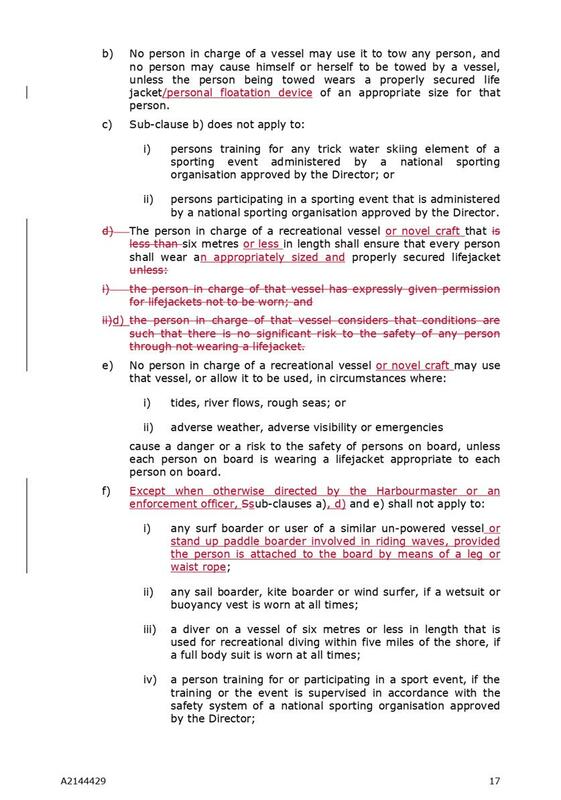 At least eight regional or district councils already have a bylaw requiring the wearing of a lifejacket at all times on recreational vessels six metres or less in length. 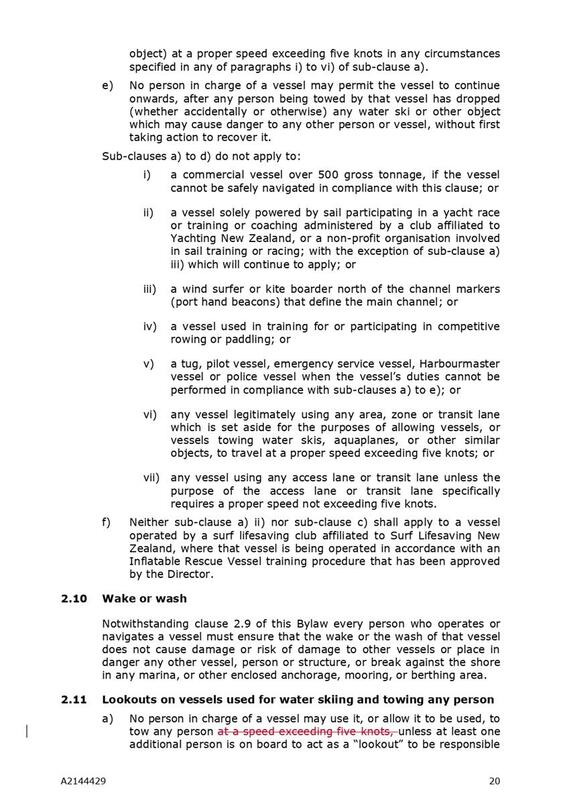 Most drownings in boating accidents involve craft under six metres and most accidents occur suddenly with no warning (Maritime NZ website). 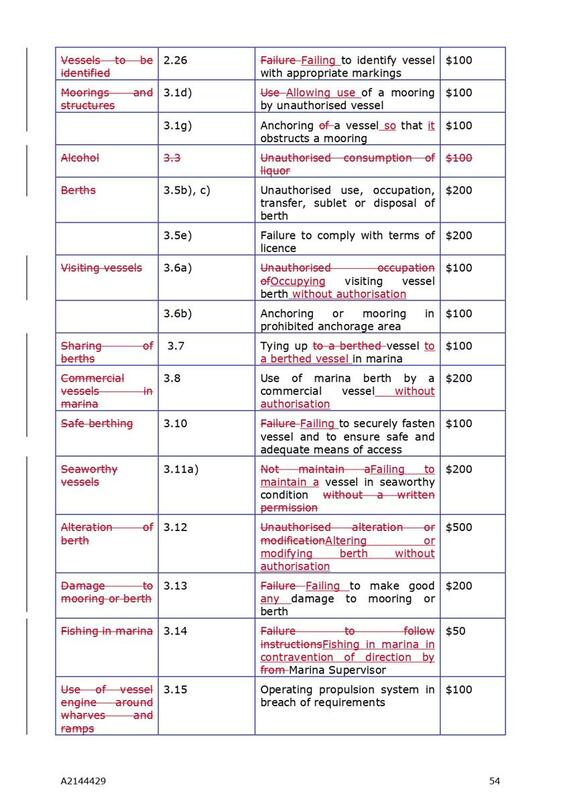 Not wearing a lifejacket is the leading risk factor for boating fatalities. 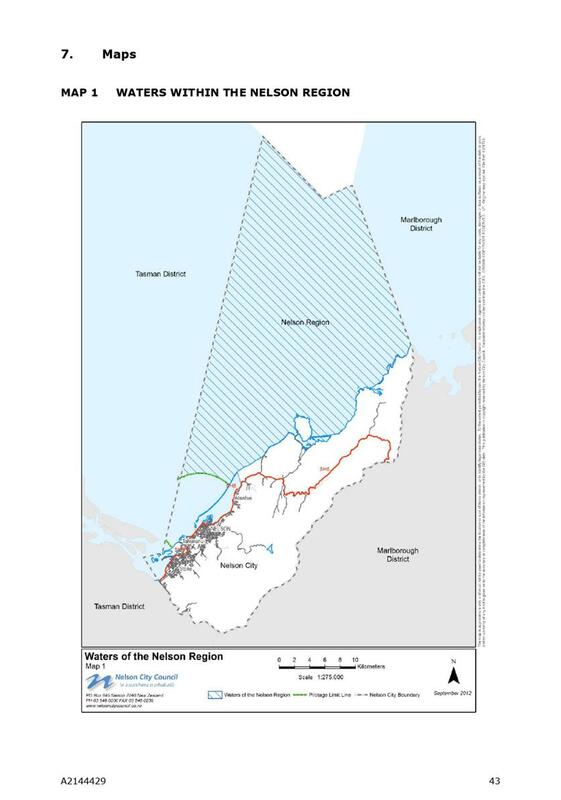 Two thirds of those who die in recreational boating accidents each year could have been saved had they been wearing a lifejacket (NZ Safer Boating Forum). 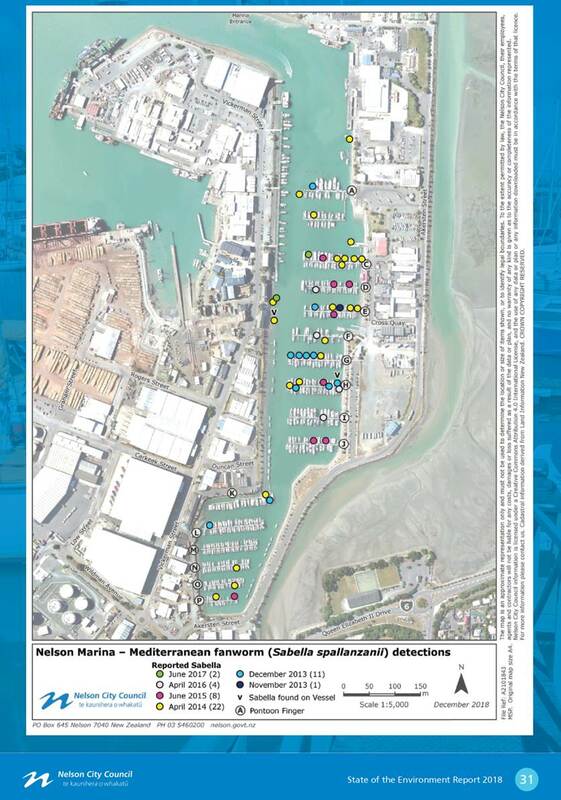 Safety checks conducted by Nelson’s Deputy Harbourmaster has found nearly all vessels carry lifejackets but in some weeks the percentage of people wearing the lifejackets has been as low as 68%. 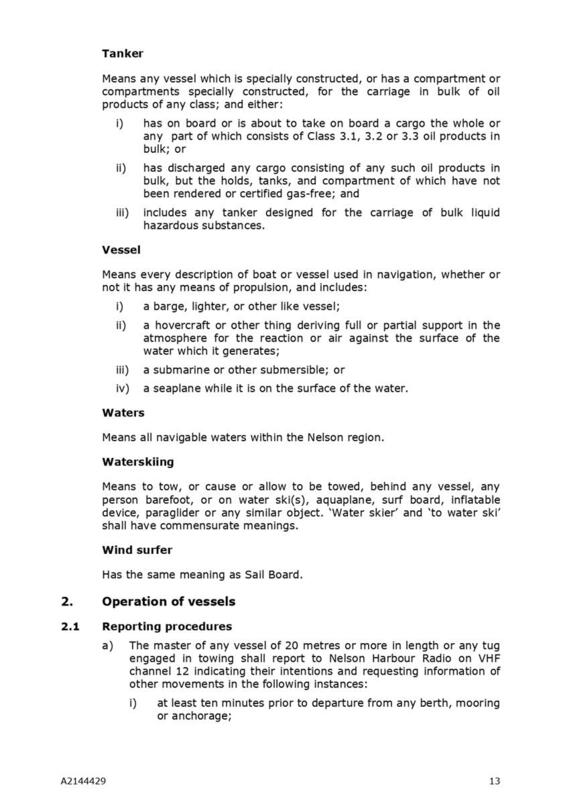 · events or activities where there is a support vessel carrying personal floatation devices in the immediate vicinity. 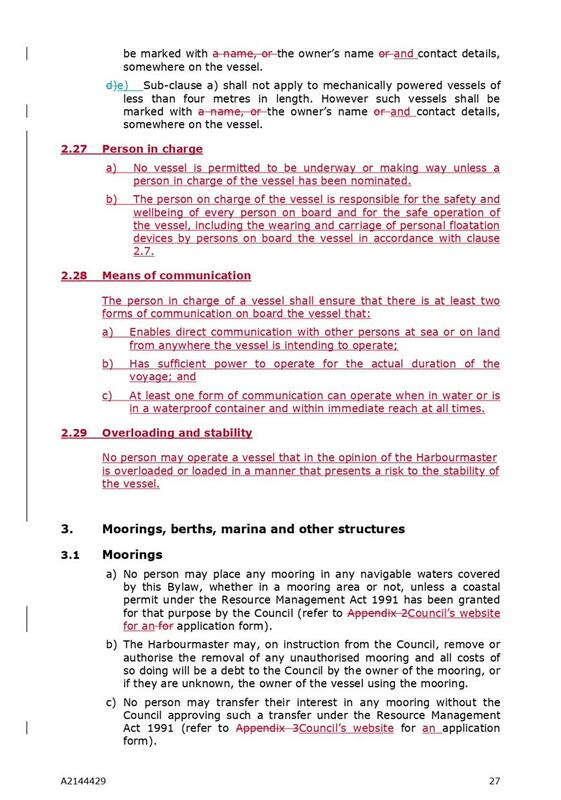 Safety – this clause reinforces the responsibilities of the person in charge of the vessel under the Bylaw and Maritime Rules to ensure the safety on every person on board and for the safe operation of the vessel. 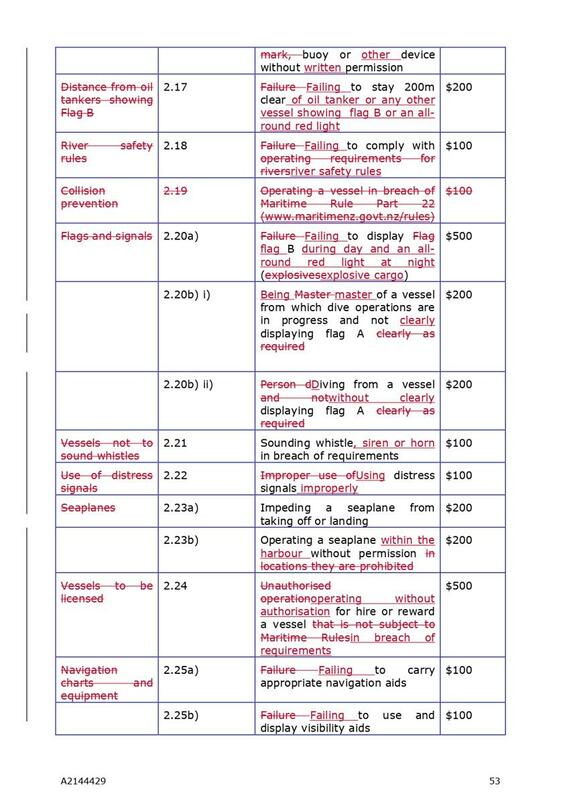 Nationwide evidence has shown boats involved in accidents have been under equipped with skippers lacking basic knowledge of key boating safety rules. 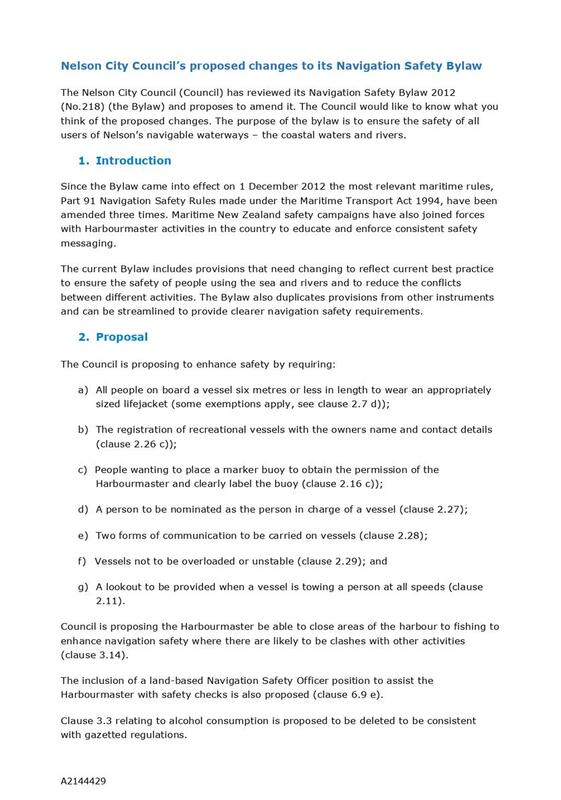 Amend to reflect what can safely occur in the area given the increased numbers of swing moorings. The water ski/ wake boarding/biscuiting area is deleted. 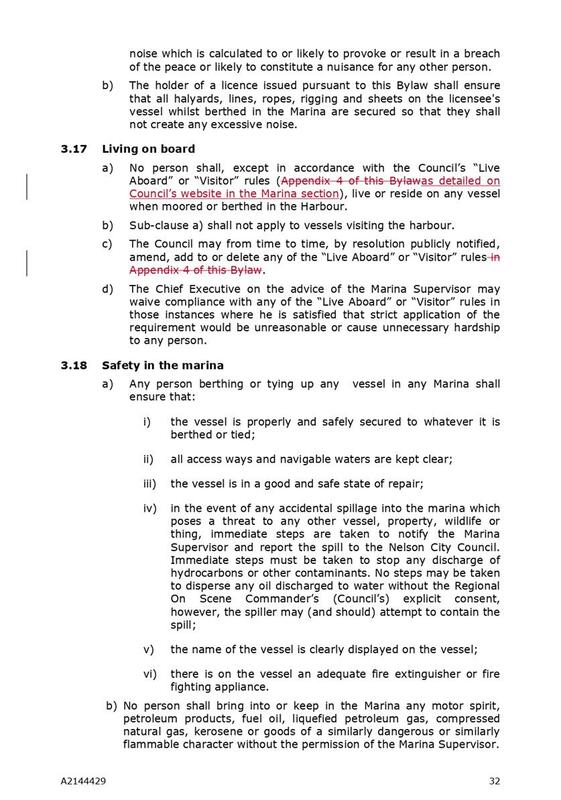 5.7 A SCP is required when the changes to a bylaw create a significant impact on the public (section 156 of the LGA). 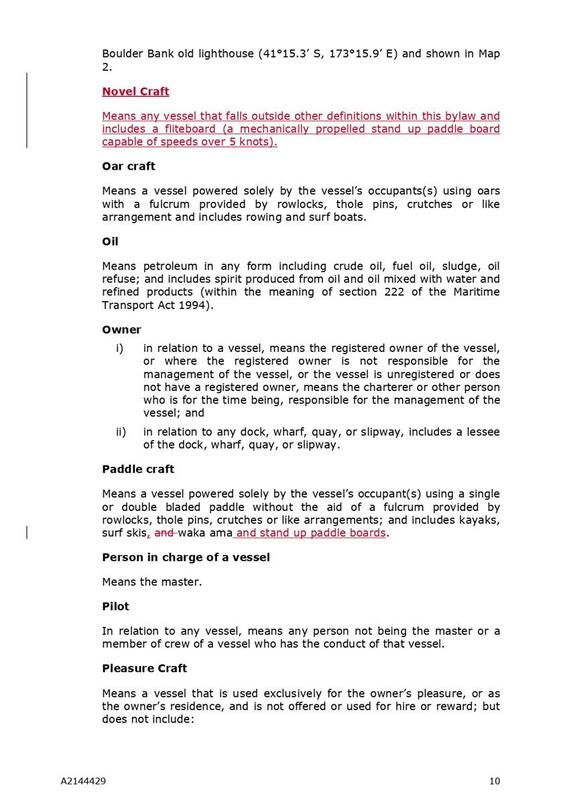 The proposed changes to the wearing of lifejackets and vessel registration could impact a number of people albeit these measures are to enhance their safety. 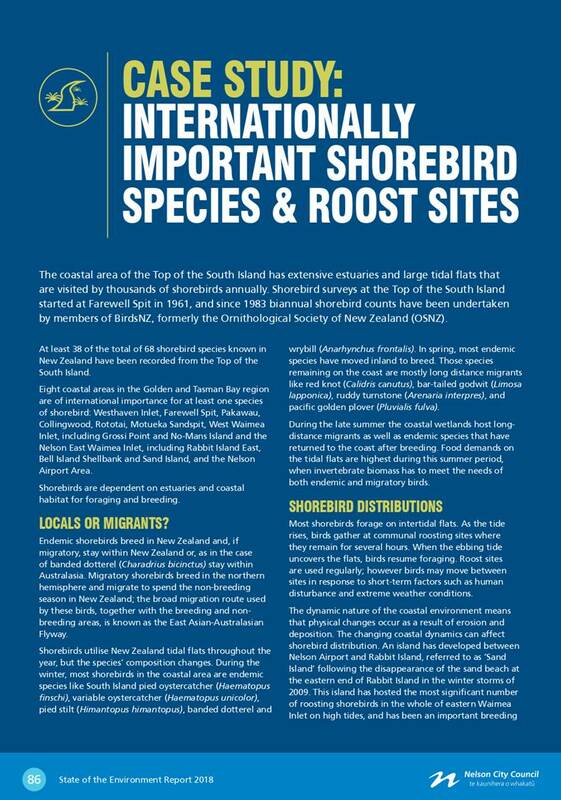 The changes to the priority areas could also impact a number of people who currently use these areas. 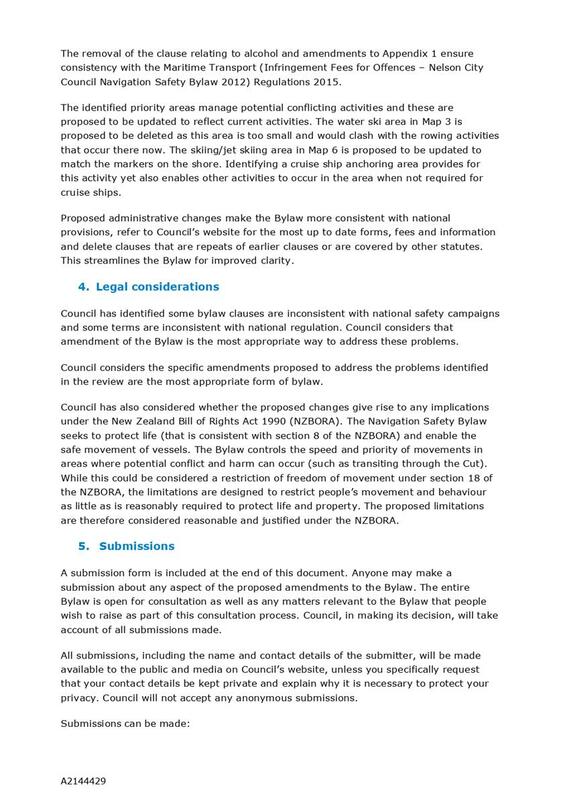 5.8 A summary of proposed changes to the Bylaw was forwarded to the clubs in mid-March inviting their feedback prior to the formal consultation process. A verbal update on their response will be provided at the Committee meeting. 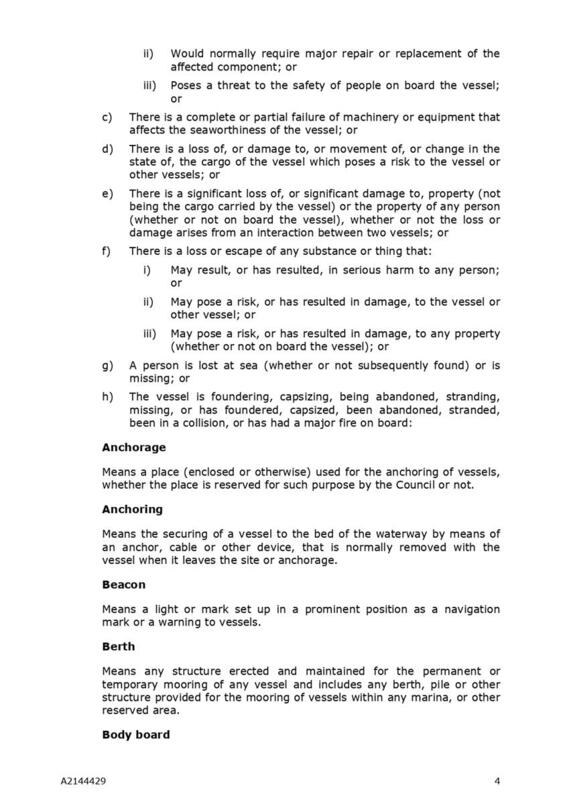 5.9 The draft SOP is included as Attachment 1. 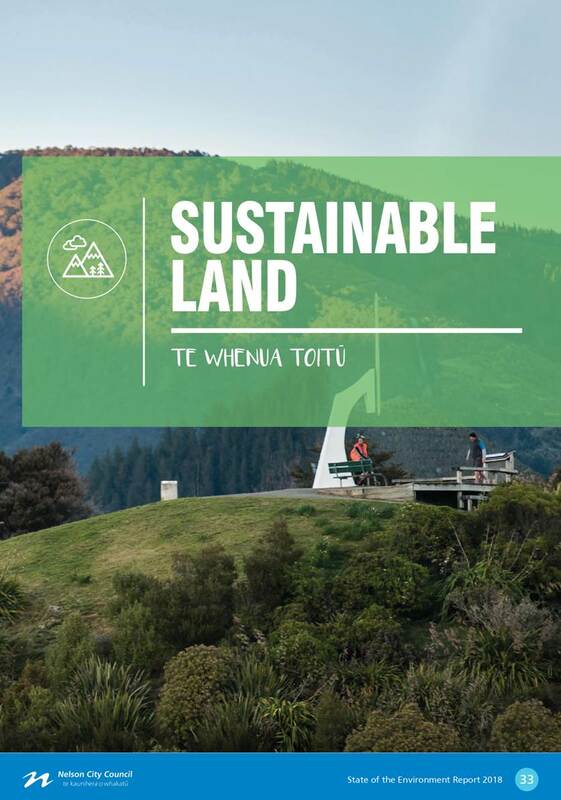 Following adoption of the SOP it will be made available to the public for feedback, with a proposed consultation period from 21 June to 24 July 2019. 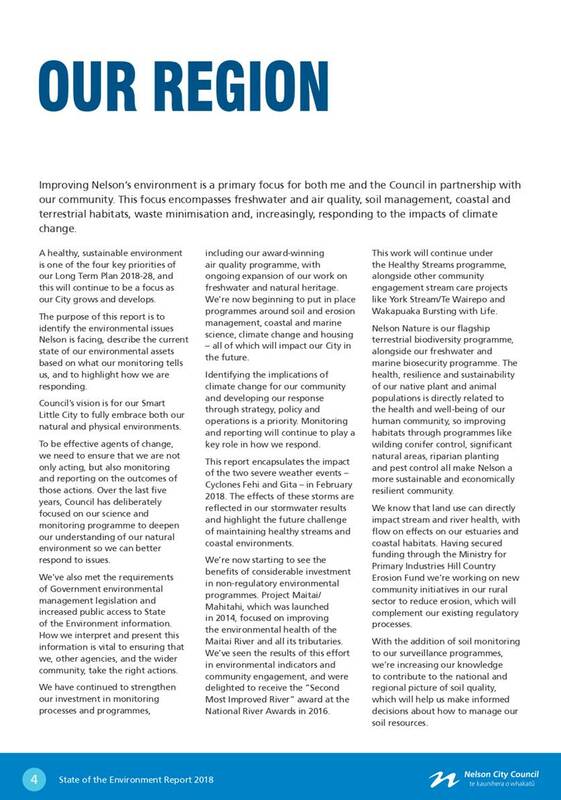 5.10 Holding a hearing on 6 August 2019 followed by deliberations on 22 August would enable a recommendation to be considered by full Council on 19 September, with any Bylaw changes to take effect from 1 October 2019. 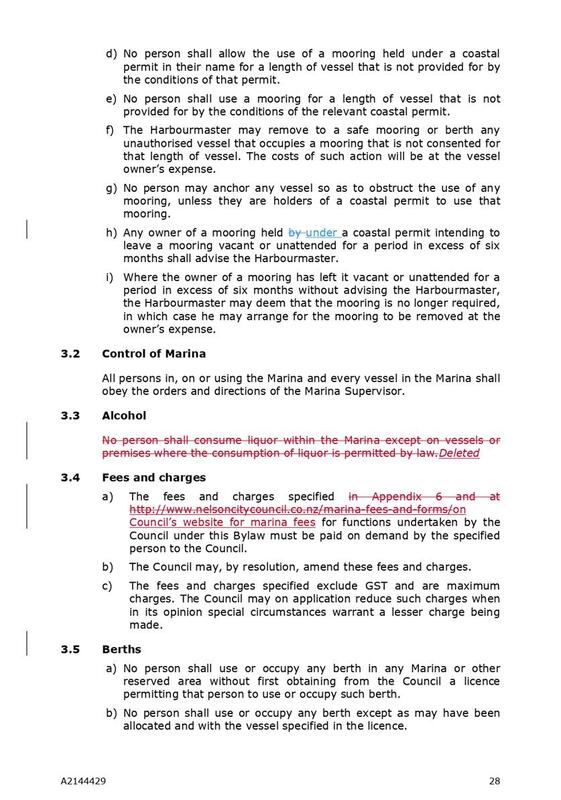 · Direct officers to amend the statement of proposal (option 3). The preferred option is option 2. 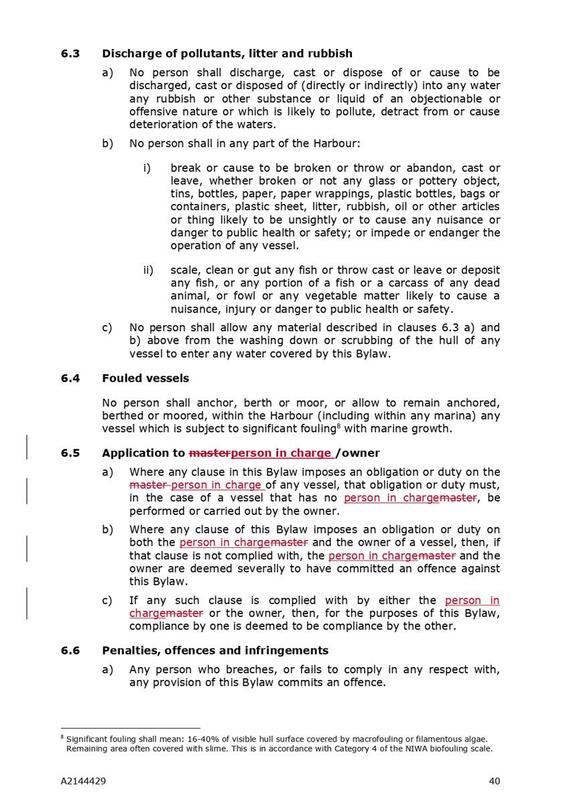 7.1 Since the Bylaw came into effect in December 2012 Maritime Rules have been updated, local safety checks have been conducted and national safety campaigns have occurred. 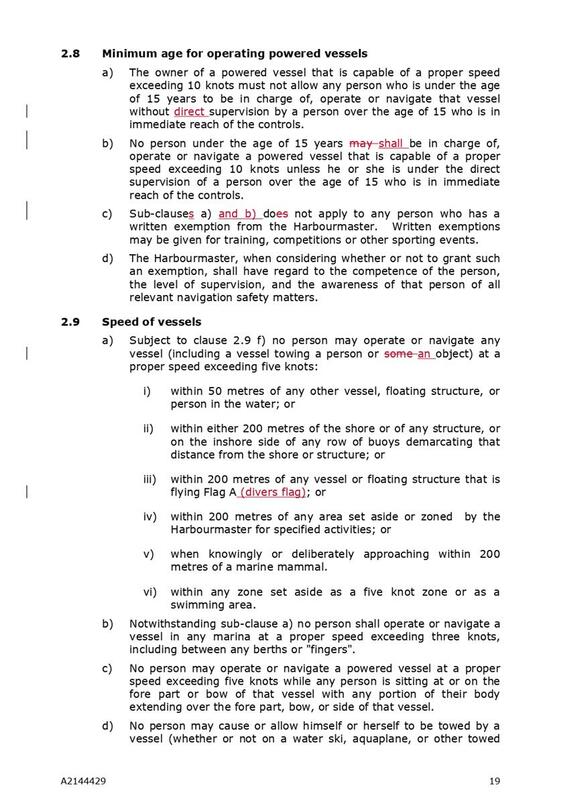 Proposed changes to the Bylaw seek to better align Bylaw provisions with these aspects to enhance the safety of people involved in water activities. 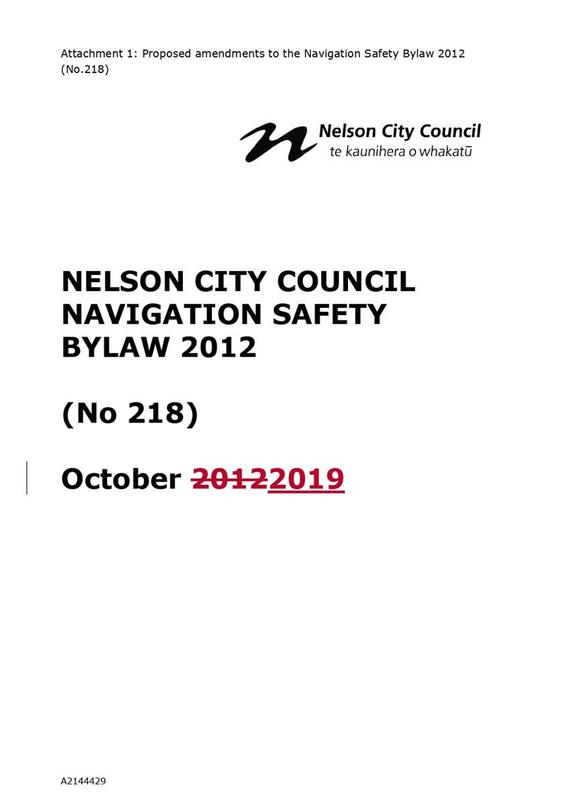 Navigation safety is the responsibility of regional councils and the recommendations in this report support the performance of the Harbourmaster duties to ensure public safety. 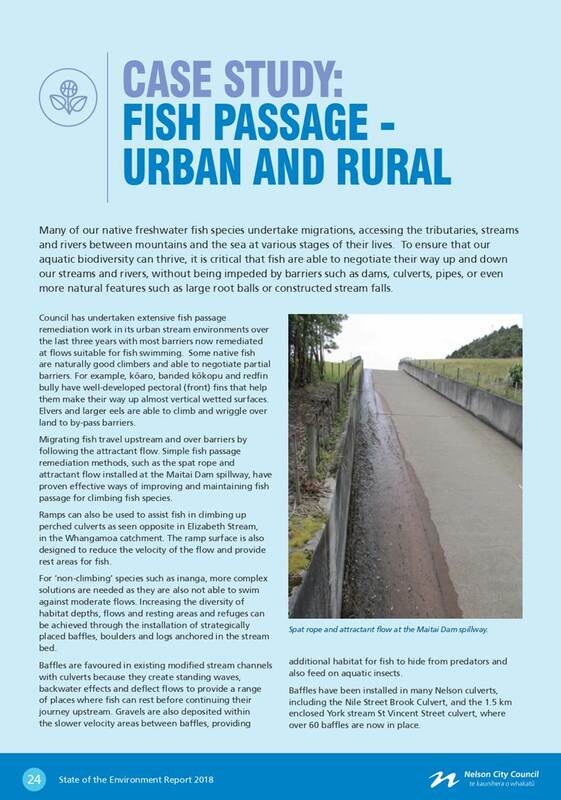 Enhancing navigation safety ensures the Community Outcome of having access to a range of social, education and recreational facilities and activities namely high quality water sport activities. 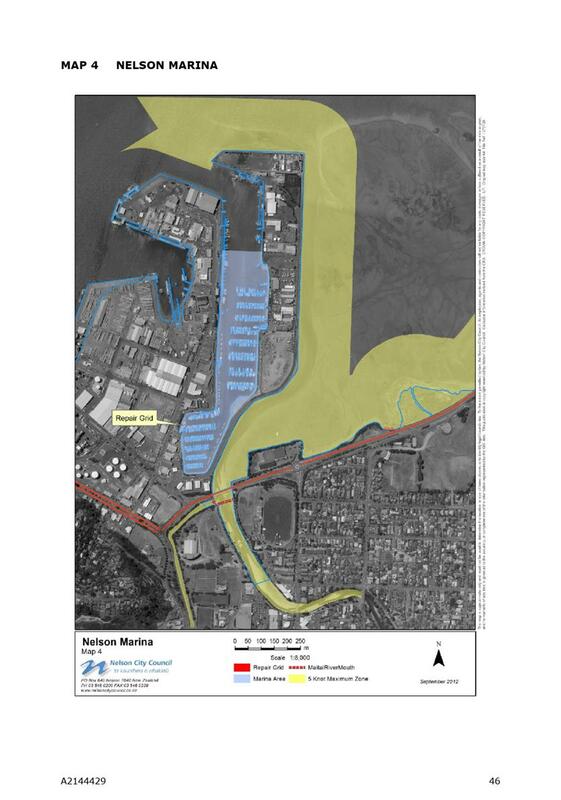 It also ensures the safe operation of Port activities that support our region having an innovative and sustainable economy. 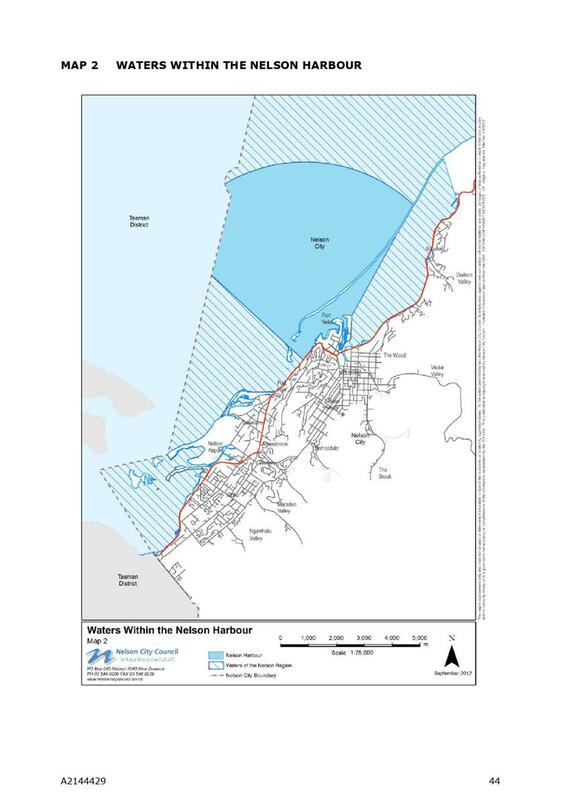 Council is responsible for ensuring navigation safety on our navigable waters. 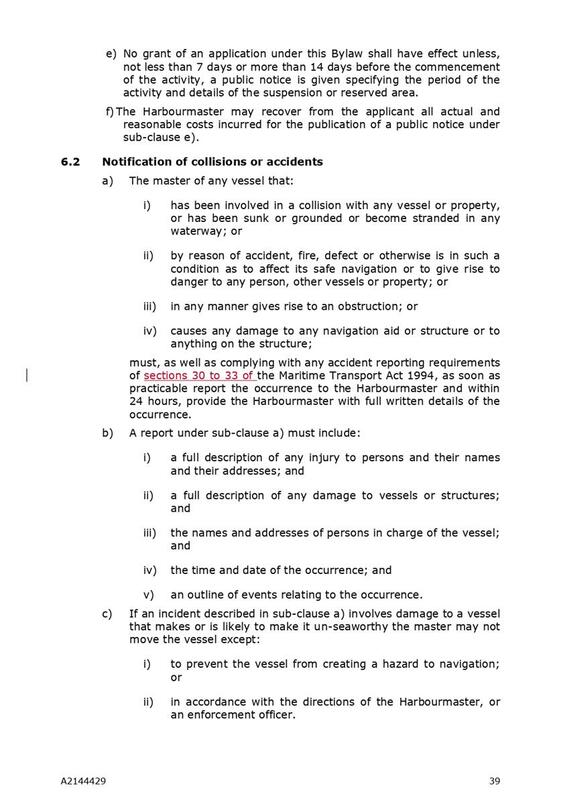 There is a moderate risk in not updating and amending the Navigation Bylaw in accordance with current national provisions and safety advice. 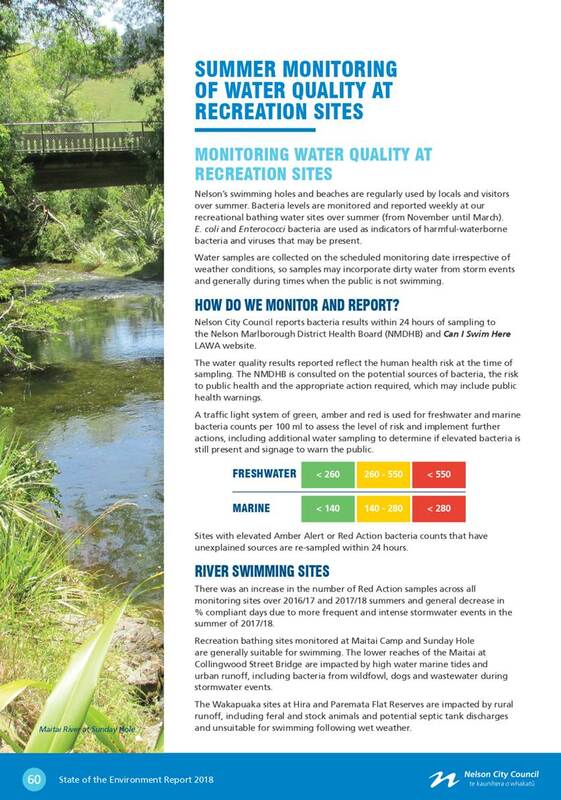 The recommendations seek to enhance safety and reduce risk to people involved in water activities. 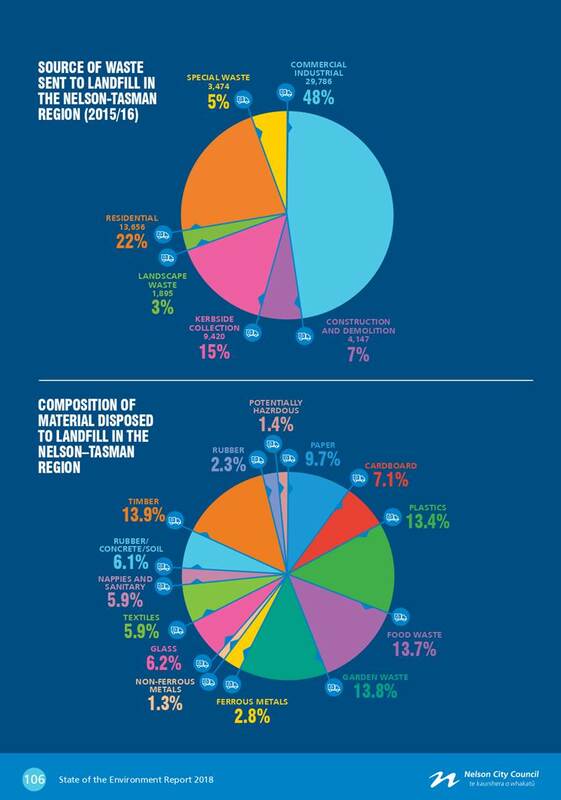 Reducing the potential for accidents also reduces the risk to the environment from pollution. 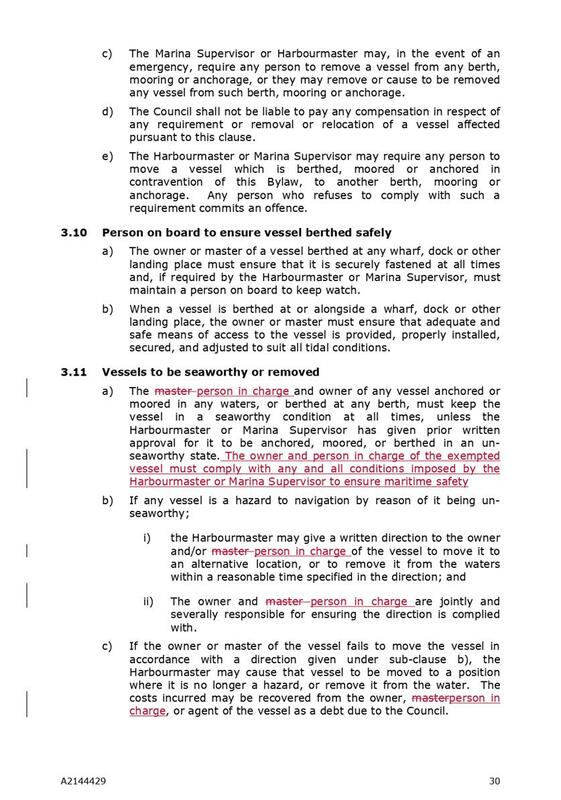 The risk in amending the Navigation Bylaw as proposed is that some people may resent the changes, even though they are designed for their own safety. 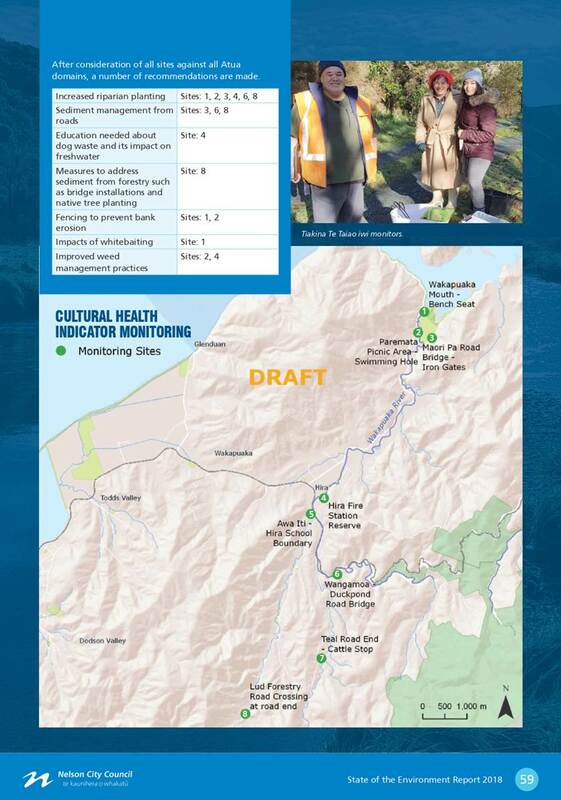 The recommendations will require staff time to administer the proposed changes but this is expected to be accommodated within existing resources. 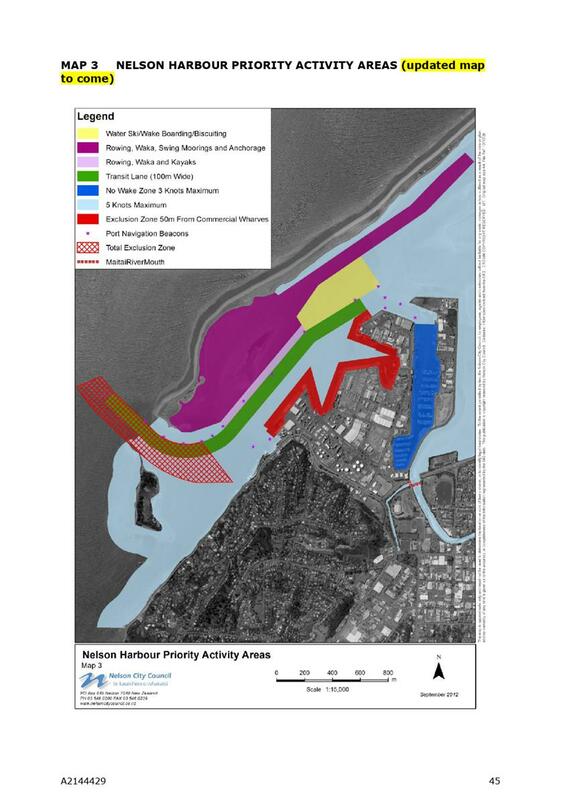 This matter is of medium significance because proposed changes will impact on a number of recreational sea and river activities. Therefore consultation will occur in the form of a special consultative procedure. 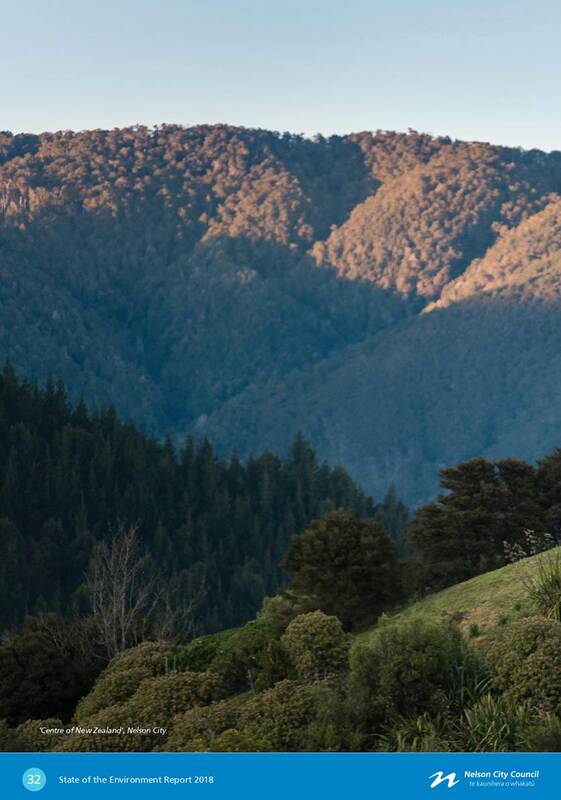 1.1 To approve the fees and charges for the dog control activity to take effect from 1 July 2019. 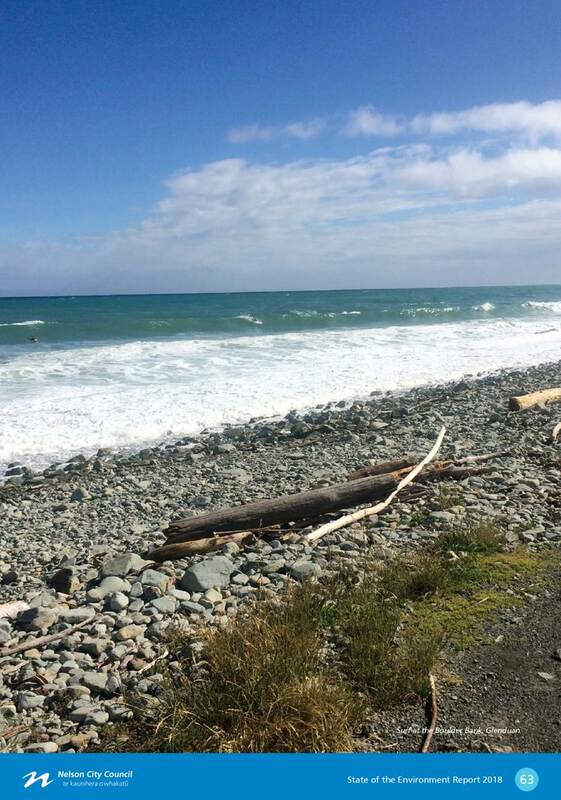 2.1 The dog control fees and charges have not changed since 1 July 2015. Proposed increases to registration and impounding fees better enables the dog control income to fully meet the costs of the dog control activity. 4.1 Section 37 of the Dog Control Act 1996 gives local authorities the power to set charges for dog registration and other dog control activities. Section 37(4) requires the territorial authority to have regard to the relative costs of the registration and control of dogs in the various categories. 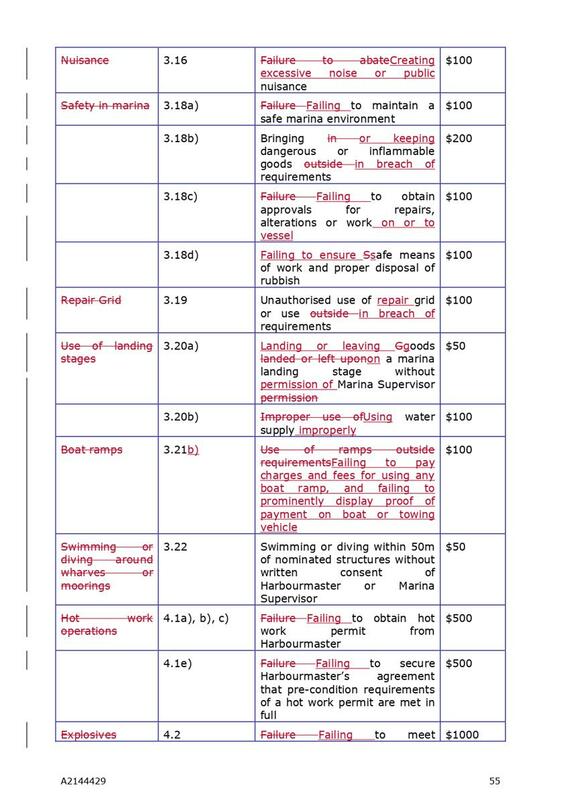 Section 37(8) states any increase in fees can only take effect at the commencement of that year. 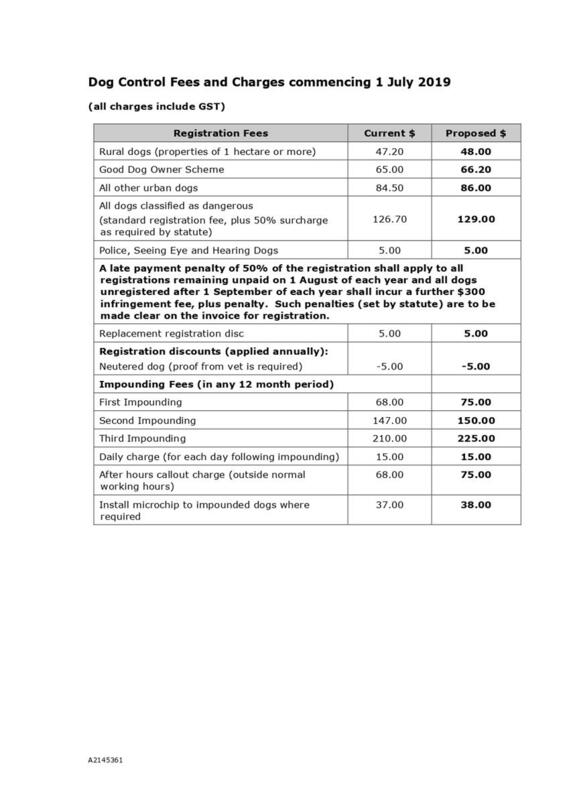 4.2 The dog control fees and charges were last changed in 2015. For the 2015/16 financial year the fees met 98% of the costs and all costs were met by fees for 2016/17. 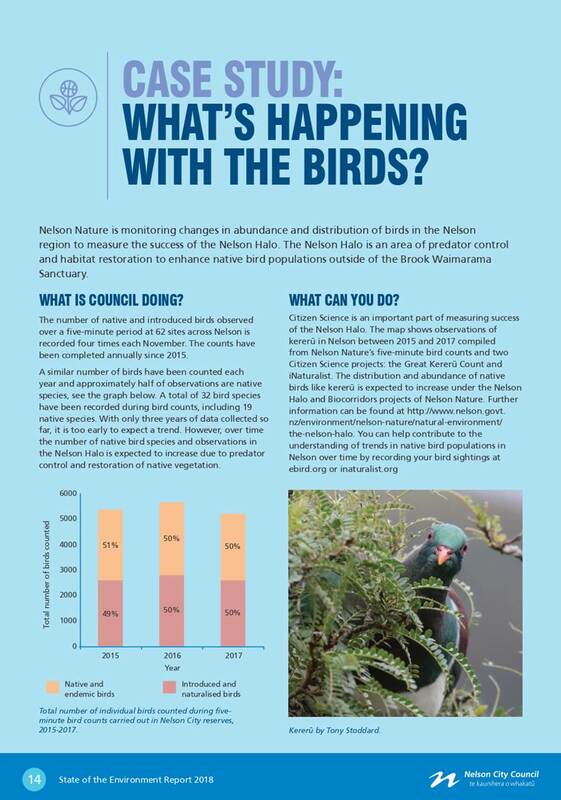 In 2017/18 the fees met 85% of the costs or 91% of the costs when the extension to the pound is excluded. 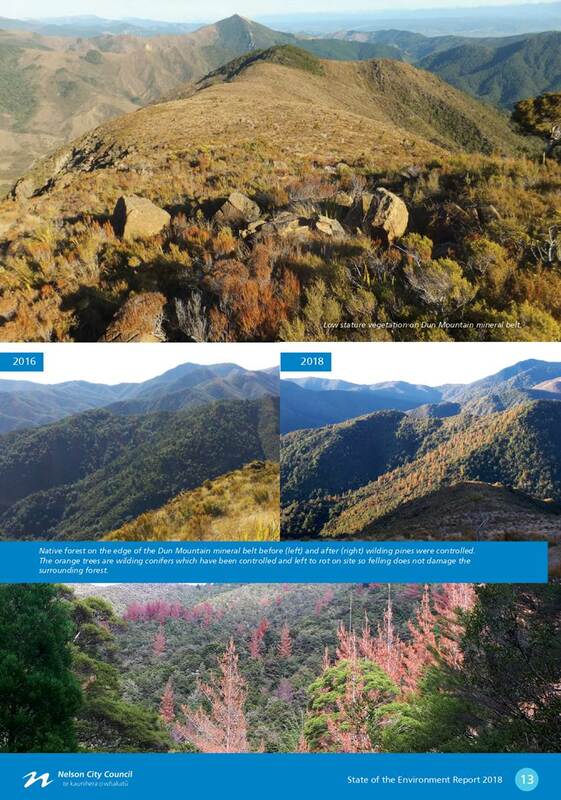 4.3 The shortfall in the last financial year was covered by the dog control reserve account. This account is nearing depletion. 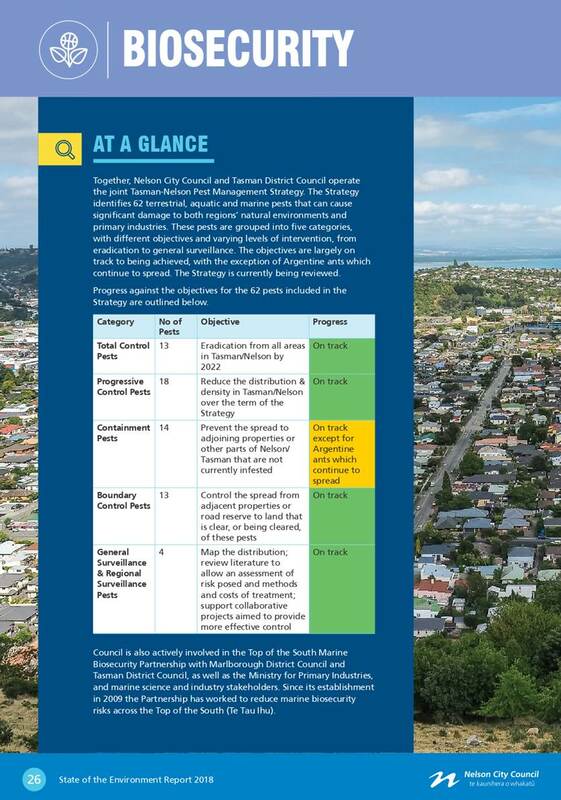 The dog control activity should be cost neutral to ratepayers. 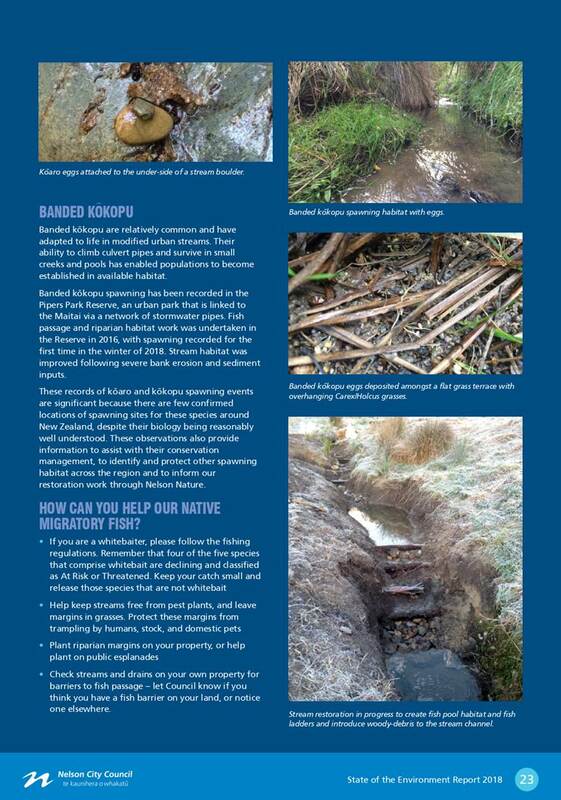 5.1 The dog control activity is funded mostly by registration fees, dog impounding fees and some minor income from infringement fees and Court awarded costs. 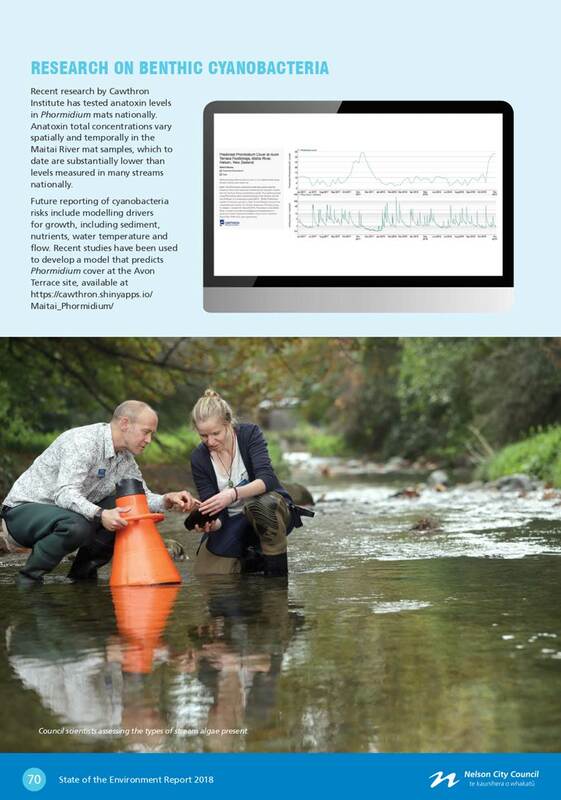 5.2 The costs of the dog control activity are largely fixed being adjusted only by the Consumer Price Index (CPI). The number of dog registrations generally increase on an annual basis which can lead to an increase in the required service level. 5.3 There was an increase in dog registrations of 2% from 2015/16 to 2016/17 and an increase of 1.7% from 2016/17 to 2017/18. However the forecasted income for 2018/19 is expected to be less than the forecasted costs by 1.8%. 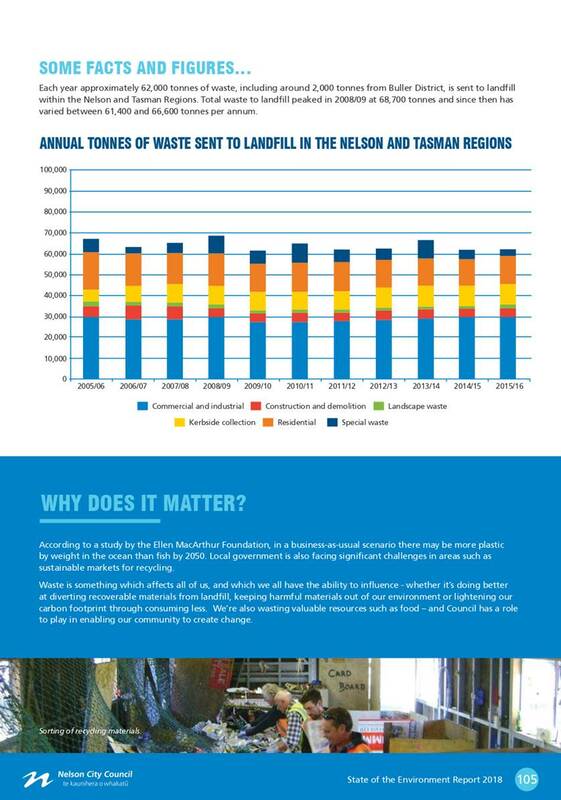 The difference is due to a decrease in the impounding income and an increase in doggie do bag costs. 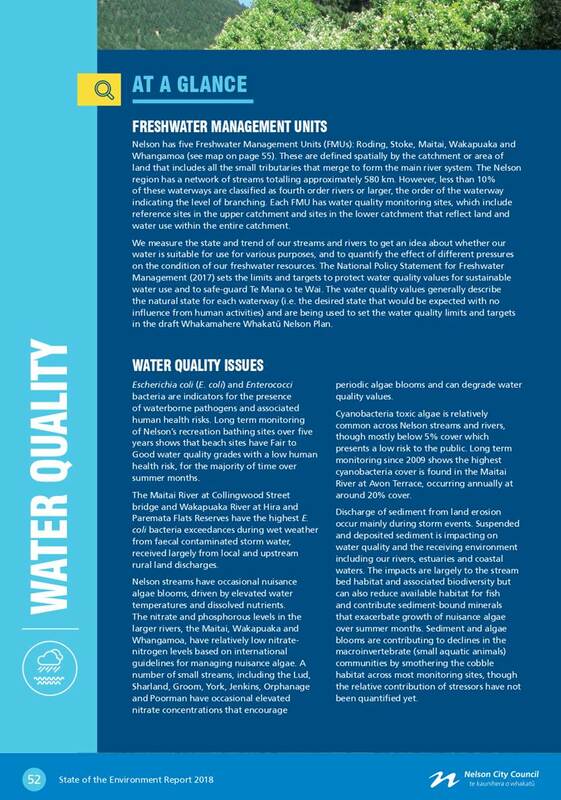 Fees and charges will need to be increased to cover these factors so future budgets will achieve a cost neutral outcome. 5.4 The proposed increase in registration fees in attachment one is based on an increase of 1.8% and rounded to the nearest ten cents. The increase in impounding fees is greater than 1.8% for the first impoundment and the after-hours call out charge to better reflect the costs for officer time for these tasks. 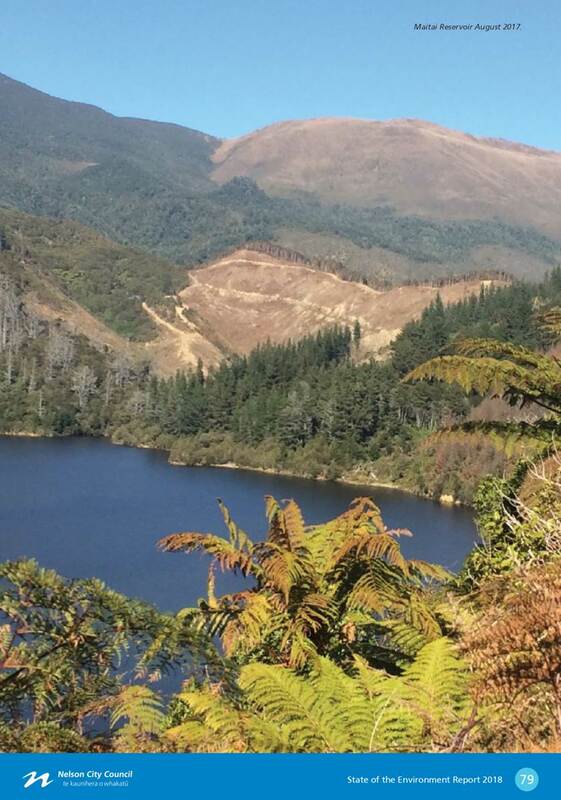 The second and third impoundment fees double and triple the first impounding fee to incentivise repeat offenders to resolve the issue. 5.5 The same percentage increase in the various categories of registration fees maintains the lower fees for neutered dogs, rural dogs and those qualifying for good dog ownership. 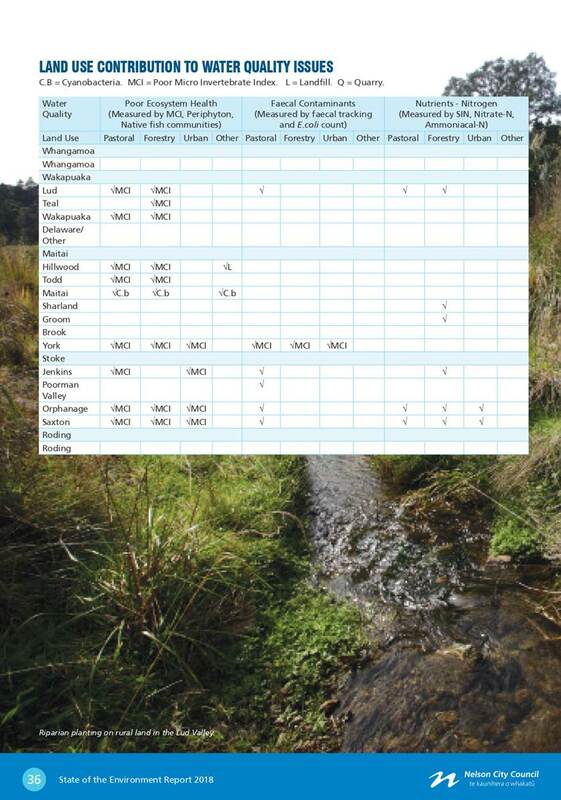 The relative costs of registration in the various categories are therefore unchanged by the proposal. 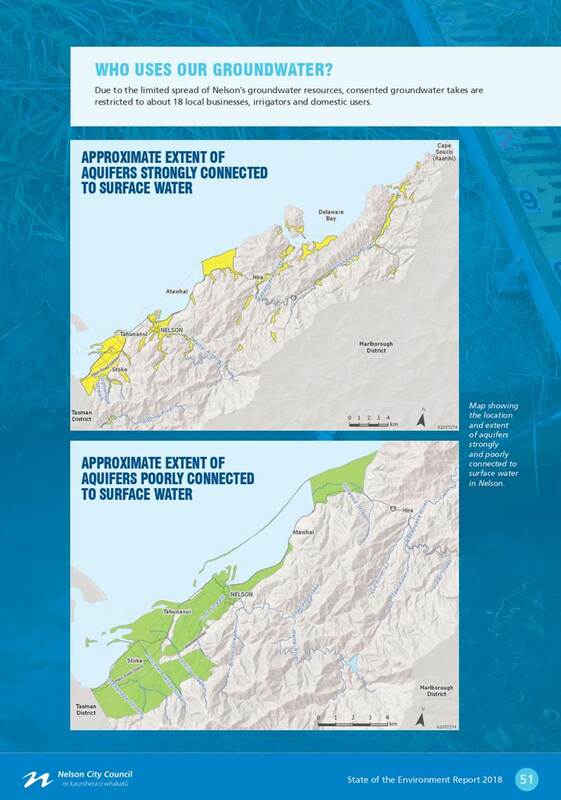 5.6 The preferred option is option 2 – increase the charges as proposed. 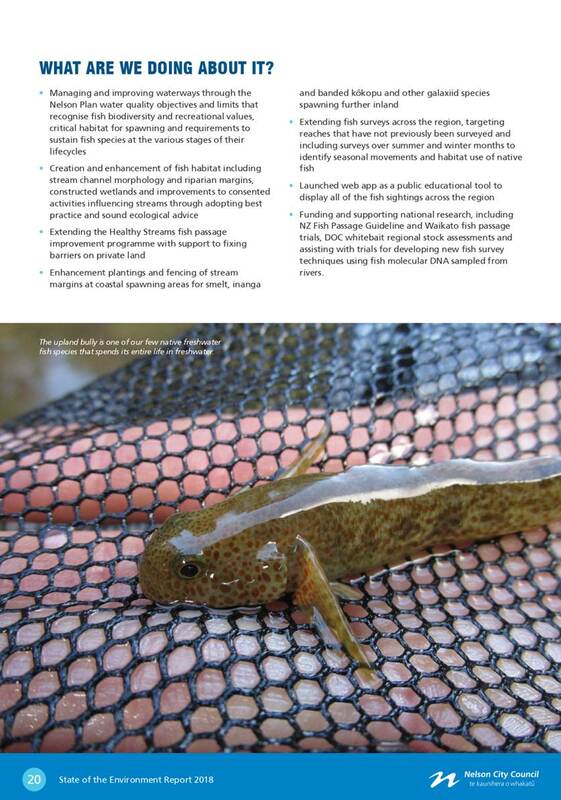 Fees and charges can be reviewed at any time to ensure costs of the service are being met. The fees and charges will be reviewed after the decisions on any changes to the dog control policy and bylaw have been made. 6.1 Registration fees need to increase by 1.8% to cover increased costs in providing the dog control service. 6.2 Proposed changes to registration and dog control fees are in accordance with section 37 of the Dog Control Act 1996. 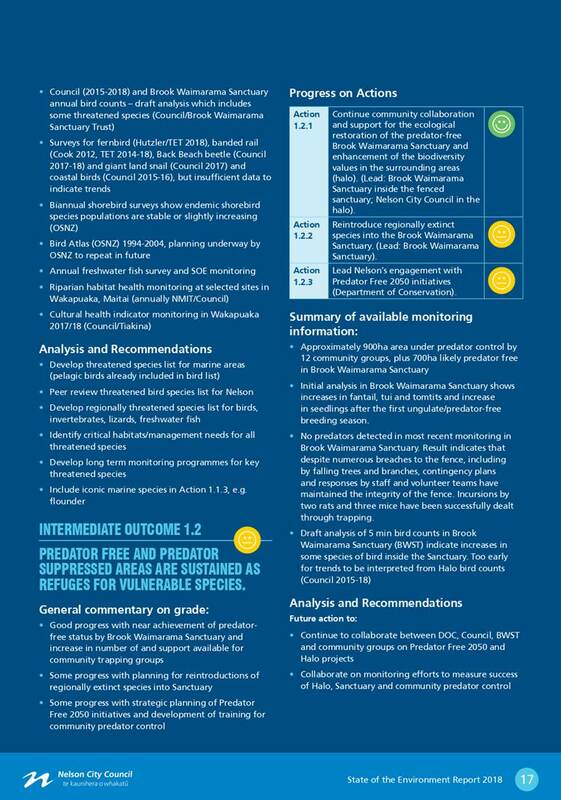 The recommendation in the report provides for the cost-effect delivery of the dog control regulatory function. 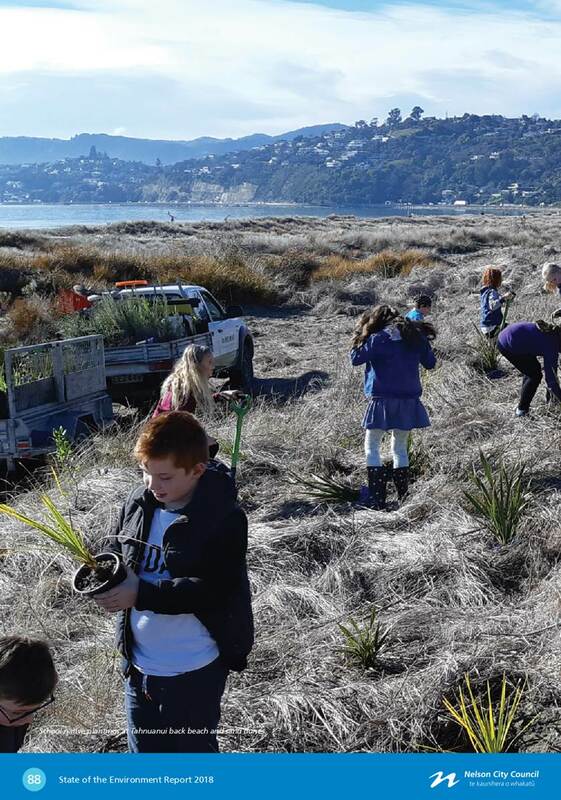 The recommended fees and charges are consistent with statutes and assist with achieving the funding outcomes in the Long Term Plan. 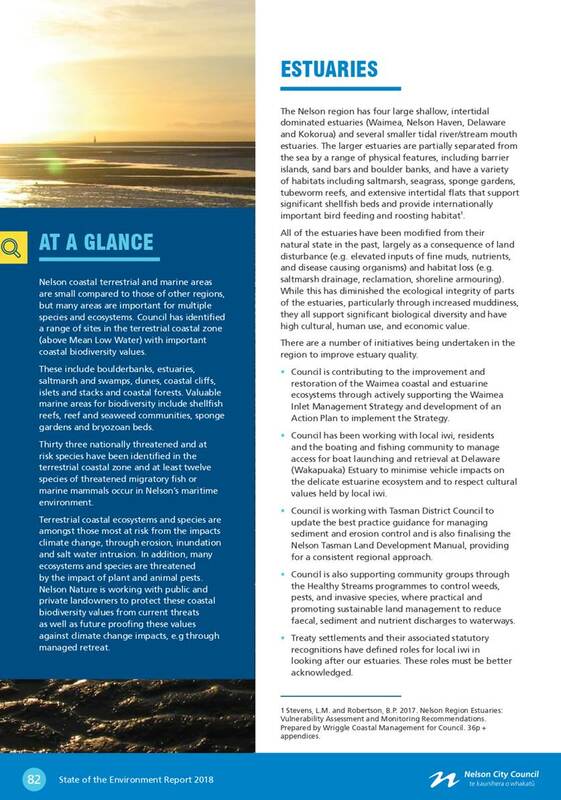 The do nothing option will likely not achieve the funding outcomes stated in the Long Term Plan. 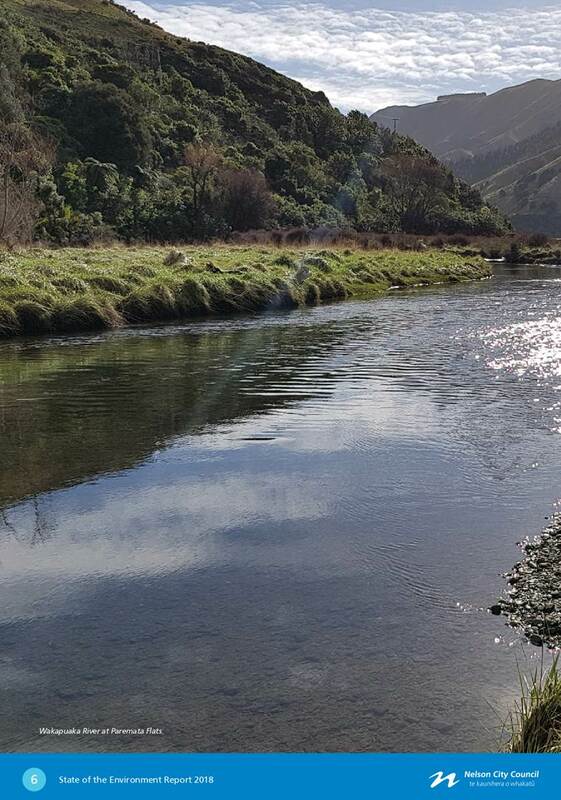 In the short-term the dog reserve account (accumulated when fees and charges exceeded the costs of the service) may cover any shortfall but medium to long-term costs of the service are unlikely to be met through the fees and charges income if this is not increased. 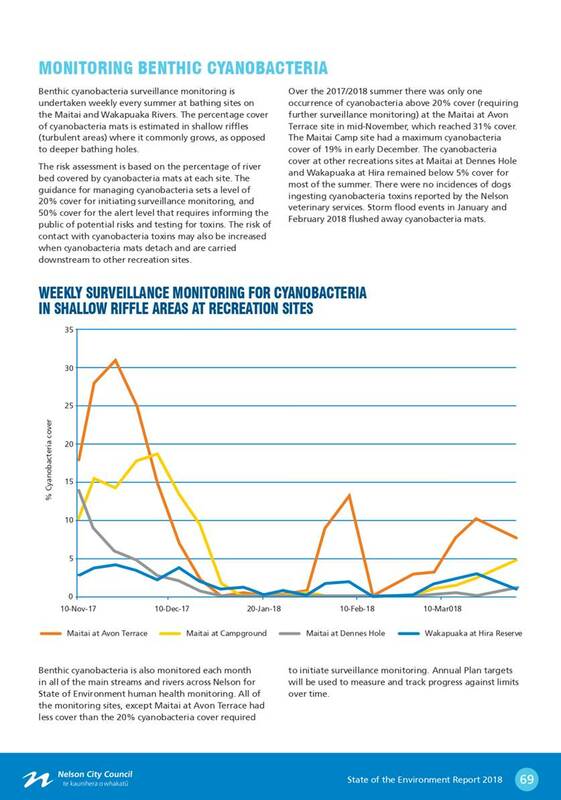 This matter is of low significance because the amount of increase is not significant for most dog owners. The fees and charges have not increased since 2015 and this will be conveyed to dog owners prior to reregistration.